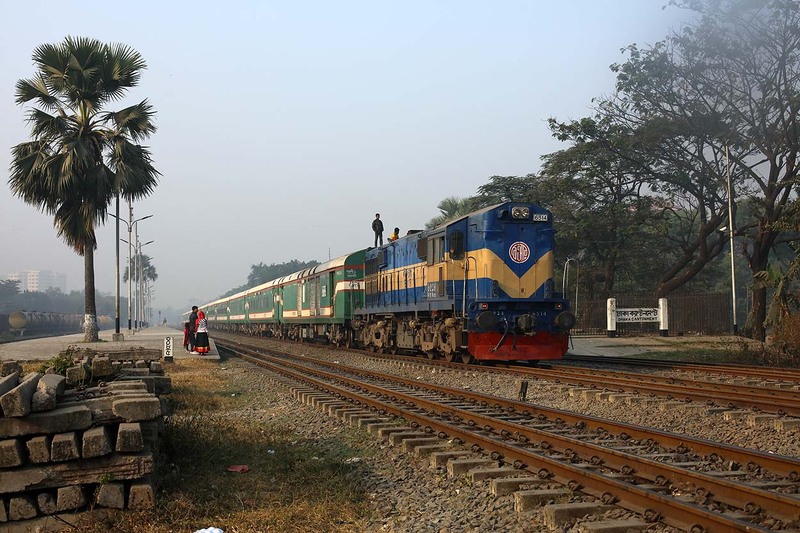 Bangladesh Railways 2319 with InterCity train 737 'Egarosindhur Provati' from Dhaka to Kishoreganj at Dhaka Banani on 11 January 2019. 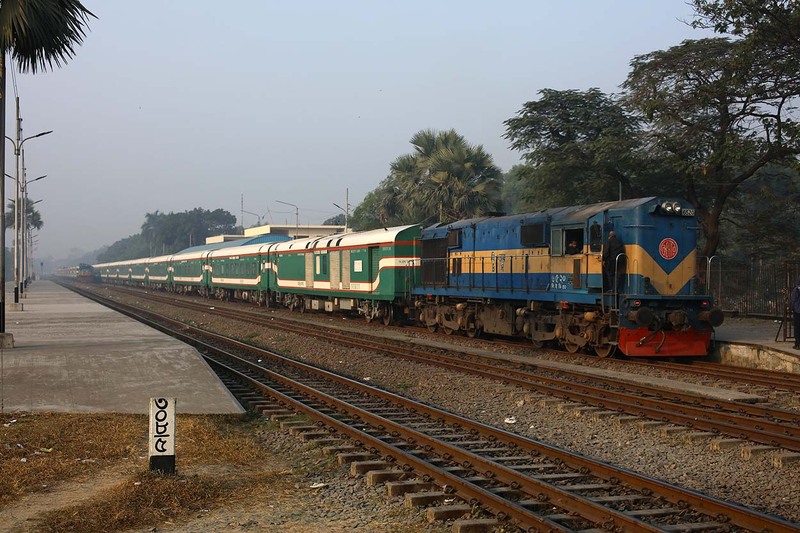 Bangladesh Railways 2914 with Intercity Train 766 'Nilsagar' from Chilahati to Dhaka at Dhaka Cantonment on 11 January 2019. 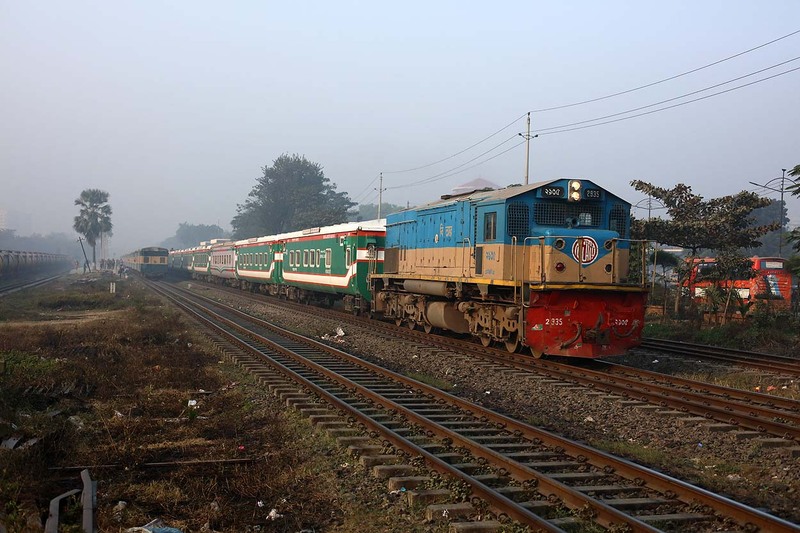 Bangladesh Railways 2938 with Intercity Train 707 'Tista Express' from Dhaka to Dewanganj Bazar at Dhaka Cantonment on 11 January 2019. 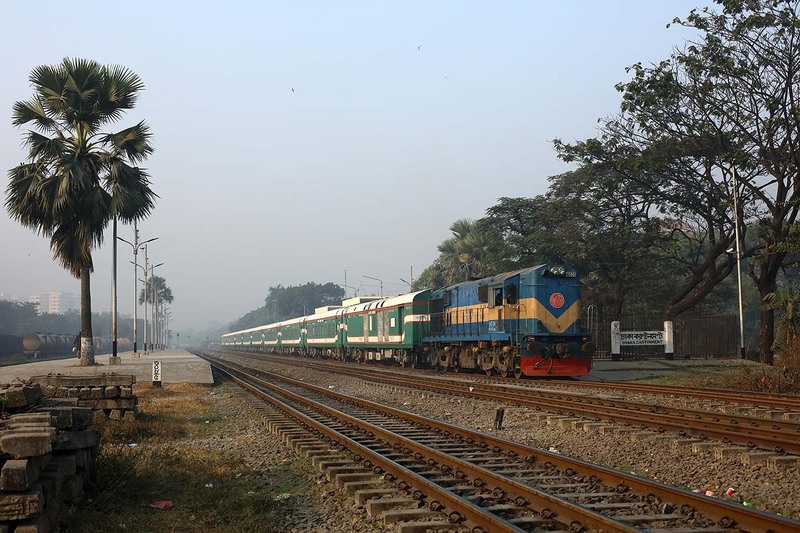 Bangladesh Railways 2930 with Intercity Train 746 'Jamuna Express' from Tarakandi to Dhaka at Dhaka Cantonment on 11 January 2019. 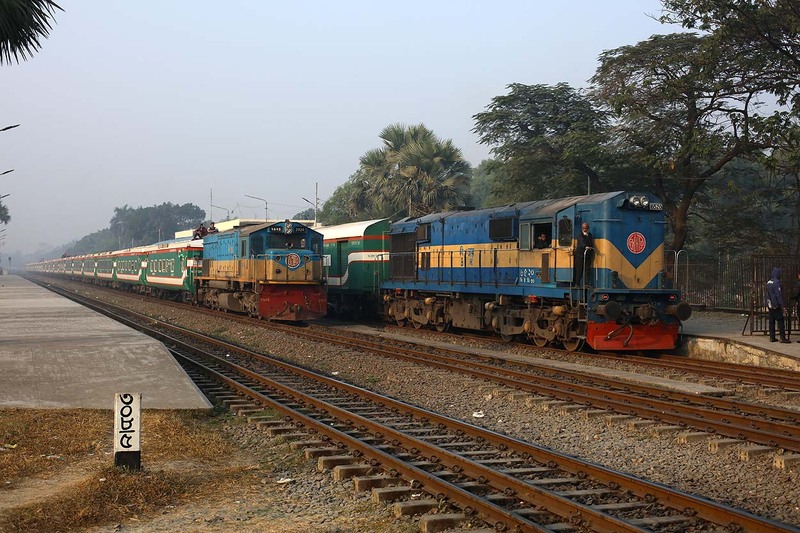 Bangladesh Railways 6520 prepares for the start of its journey as international Intercity train 3107 'Moitree Express' (Dhaka Cantonment, BD - Kolkata, IN) while Bangladesh Railways 2924 passes with Intercity Train 704 'Mohanagar Provati' from Dhaka to Chittagong at Dhaka Cantonment on 11 January 2019. 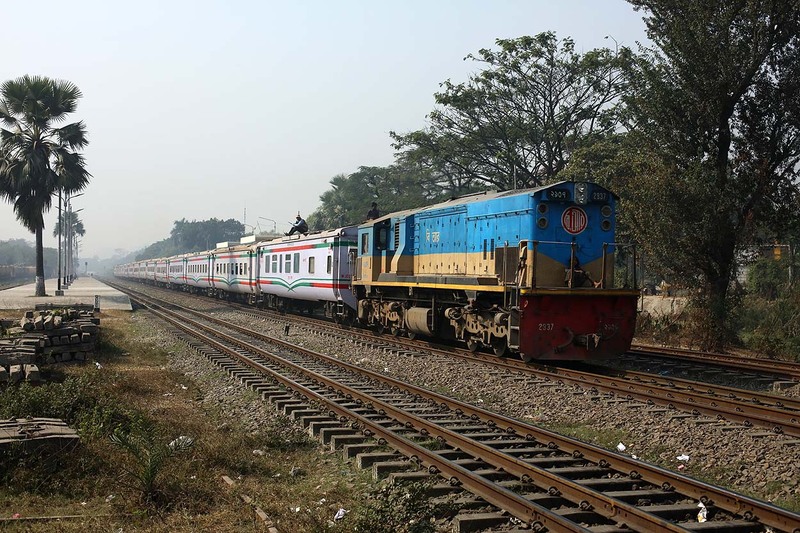 Bangladesh Railways 6520 leaves Dhaka Cantonment with international Intercity train 3107 'Moitree Express' (Dhaka Cantonment, BD - Kolkata, IN) on 11 January 2019. 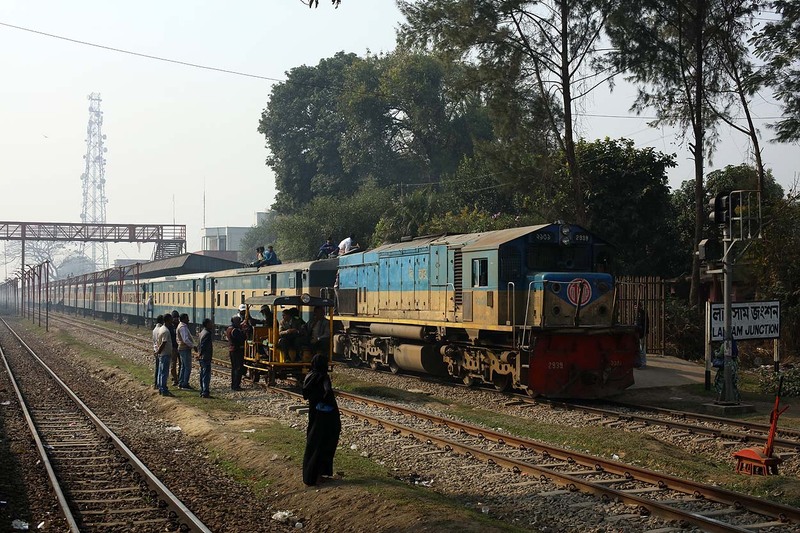 Bangladesh Railways 6514 with Intercity train 765 'Nilsagar' from Dhaka to Chilahati at Dhaka Cantonment on 11 January 2019. 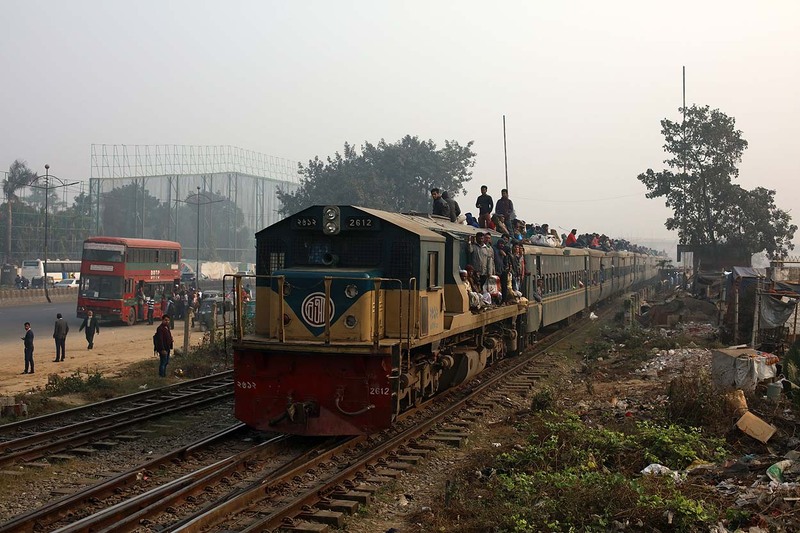 Bangladesh Railways 2412 with 'Kanchan Express' 43 from Dhaka to Mohanganj at Dhaka Cantonment on 11 January 2019. 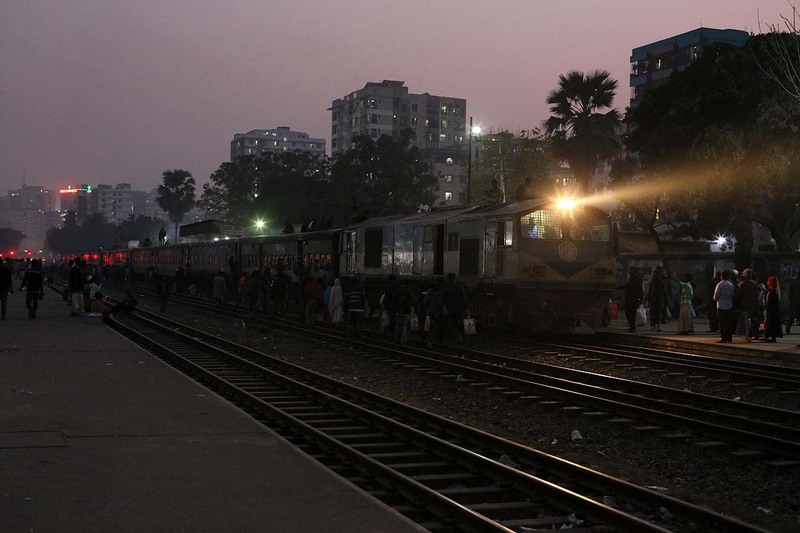 Full house: Bangladesh Railways 2412 leaves Dhaka Cantonment with 'Kanchan Express' 43 from Dhaka to Mohanganj while Bangladesh Railways 2411 approaches with Tongi-Commuter 2 from Tongi Junction to Dhaka on 11 January 2019. 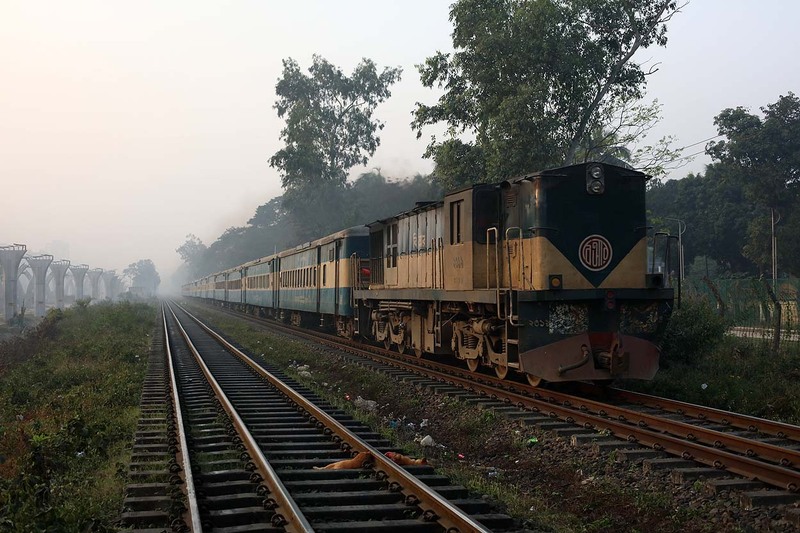 Bangladesh Railways 2612 runs through Dhaka Cantonment with 'Karnapuli Express' 4 from Dhaka to Chittagong on 11 January 2019. 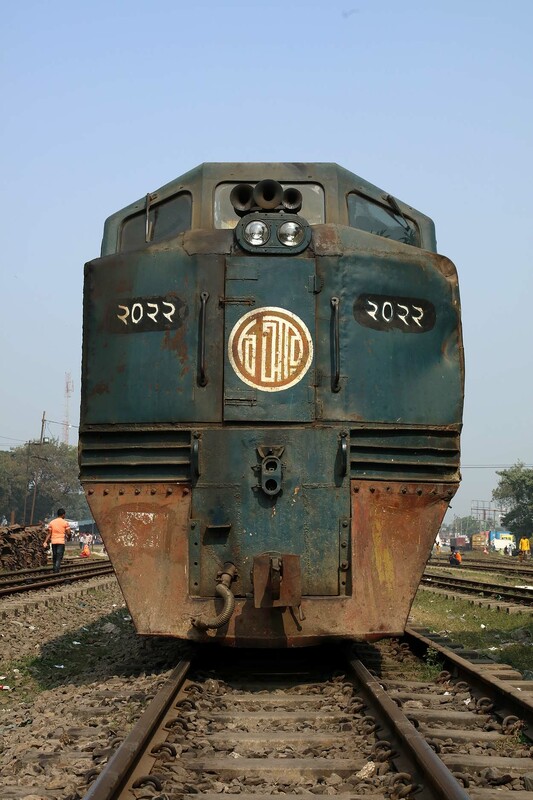 Bangladesh Railways 2316 arrives at Dhaka Cantonment with 'Surma Mail' 10 from Sylhet to Dhaka on 11 January 2019. 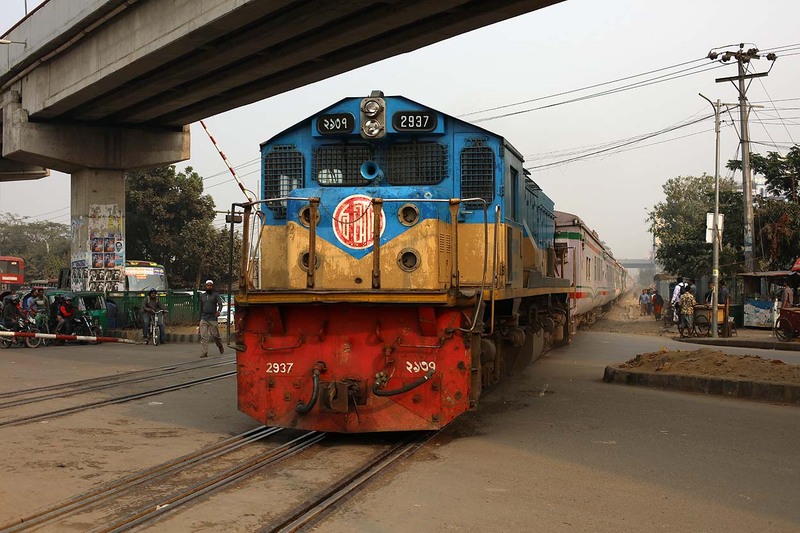 Bangladesh Railways 2316 arrives at Dhaka Cantonment with 'Surma Mail' 10 from Sylhet to Dhaka on 11 January 2019. Mind the gap. 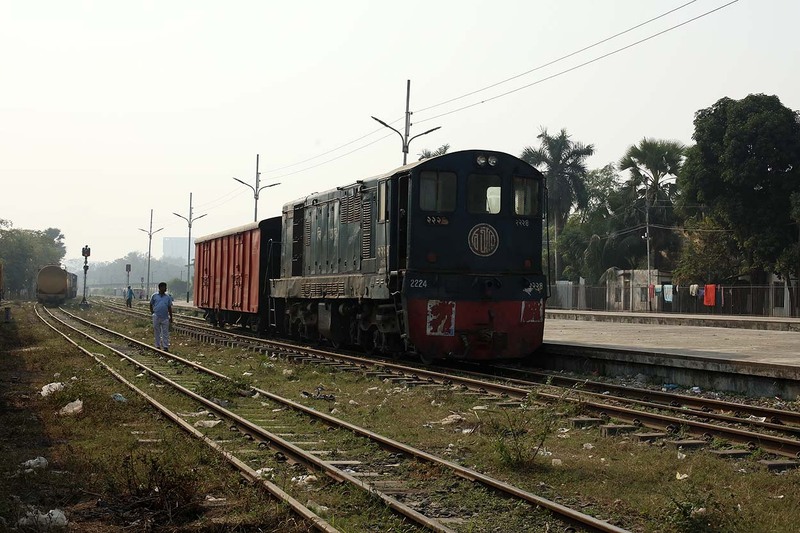 Bangladesh Railways 2702 with 'Rangpur Express' 771 from Dhaka to Rangpur at Dhaka Cantonment on 11 January 2019. 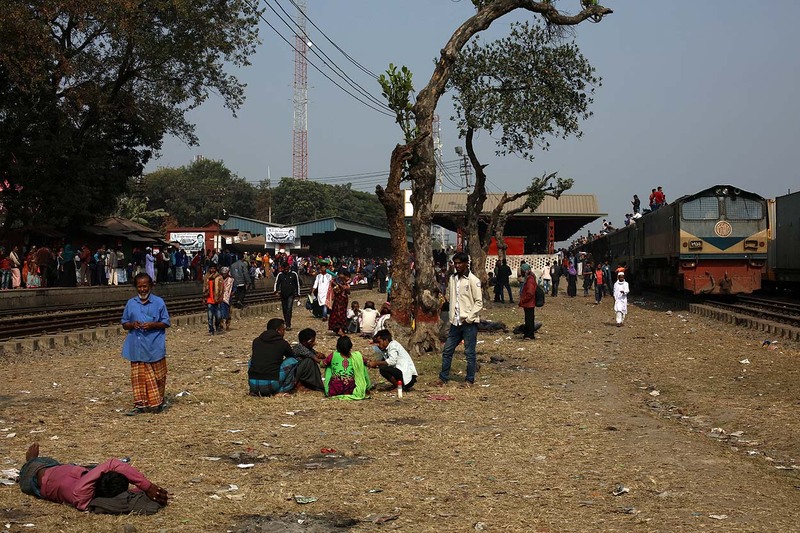 Never a picture without people in Bangladesh: Bangladesh Railways 6521 with Intercity Train 'Sirajgonj Express' 775 from Sirajganj to Dhaka at Dhaka Cantonment on 11 January 2019. 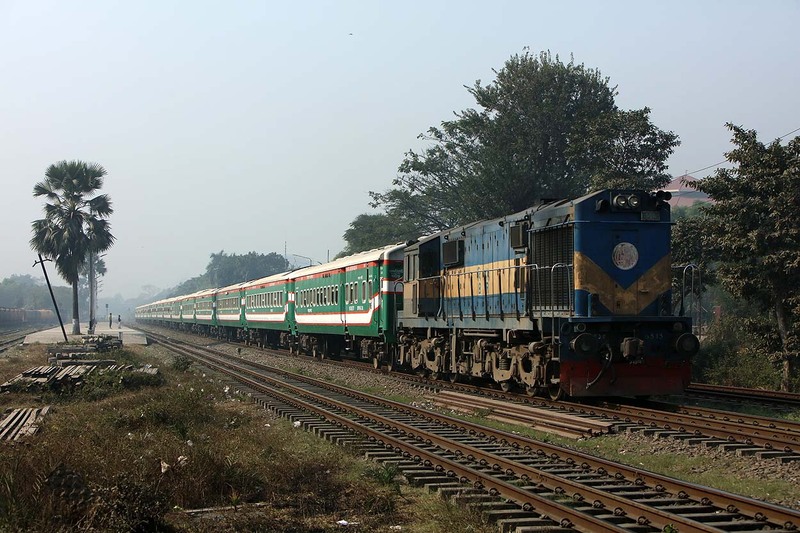 Bangladesh Railways 2916 with Intercity Train 'Agnibina Express' 735 from Dhaka to Tarakandi at Dhaka Cantonment on 11 January 2019. 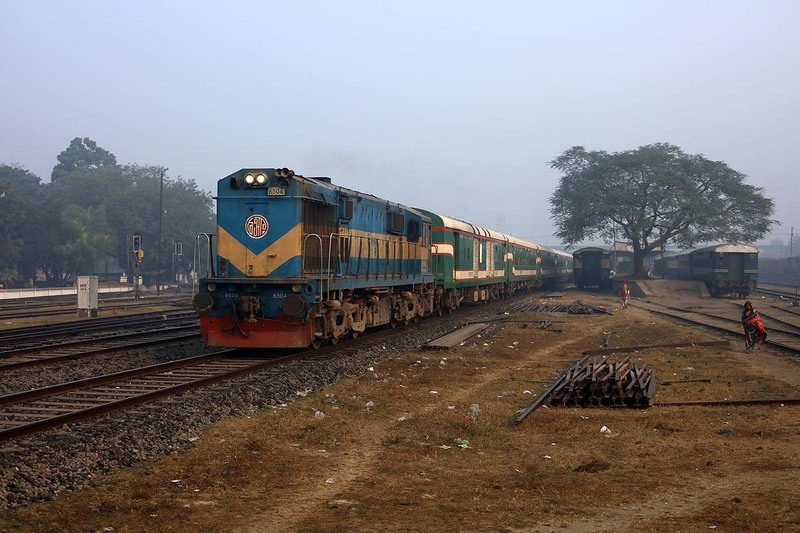 Bangladesh Railways 6515 with Intercity Train 'Ekota Express' 705 from Dhaka to Dinajpur at Dhaka Cantonment on 11 January 2019. 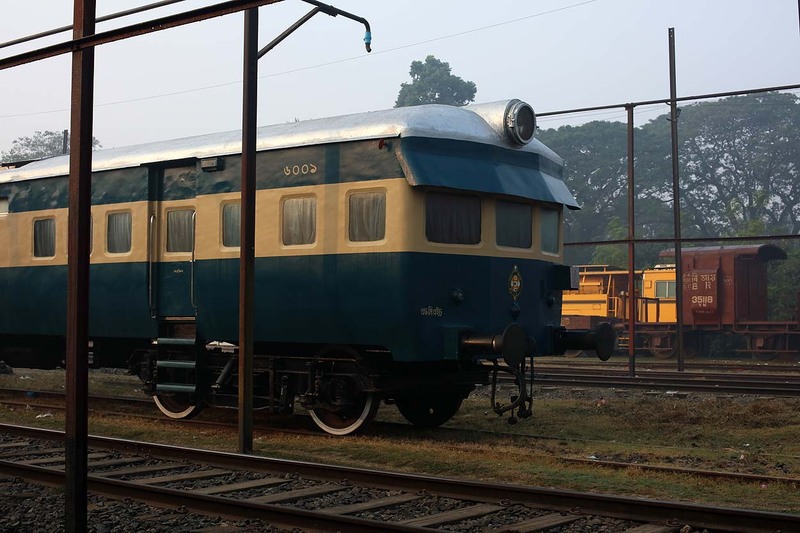 Bangladesh Railways 2401 with 'Titas Commuter' 33 from Narsingdi to Dhaka at Dhaka Cantonment on 11 January 2019. 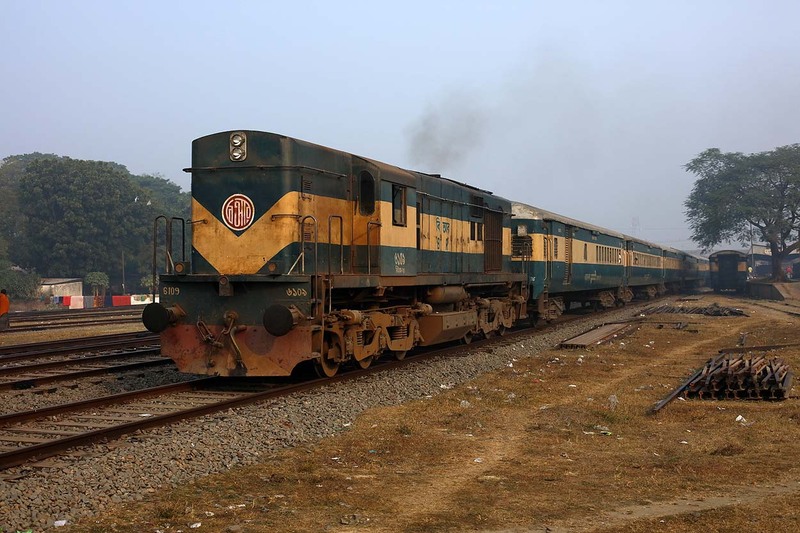 Bangladesh Railways 2314 with Intercity Train 'Egarosindhur Provati' 738 from Narsingdi to Dhaka at Dhaka Cantonment on 11 January 2019. 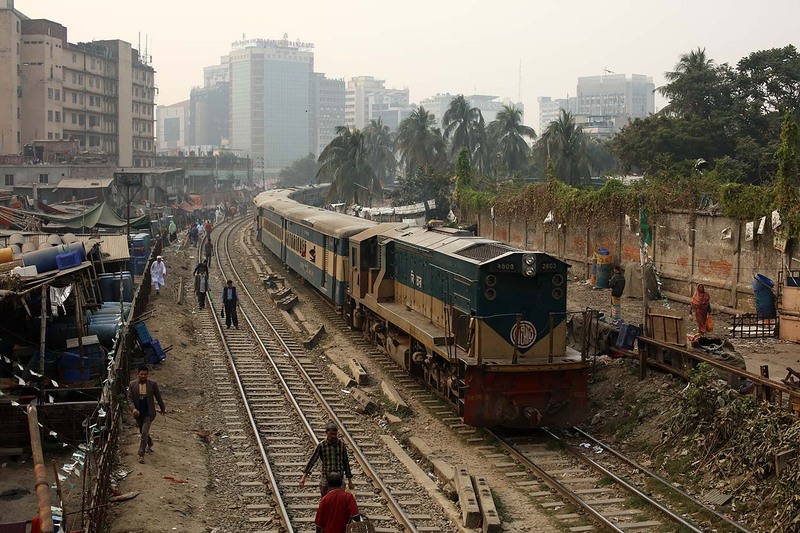 Bangladesh Railways 2937 with an Intercity Train from Dhaka towards Tongi Junction at Dhaka Cantonment on 11 January 2019. 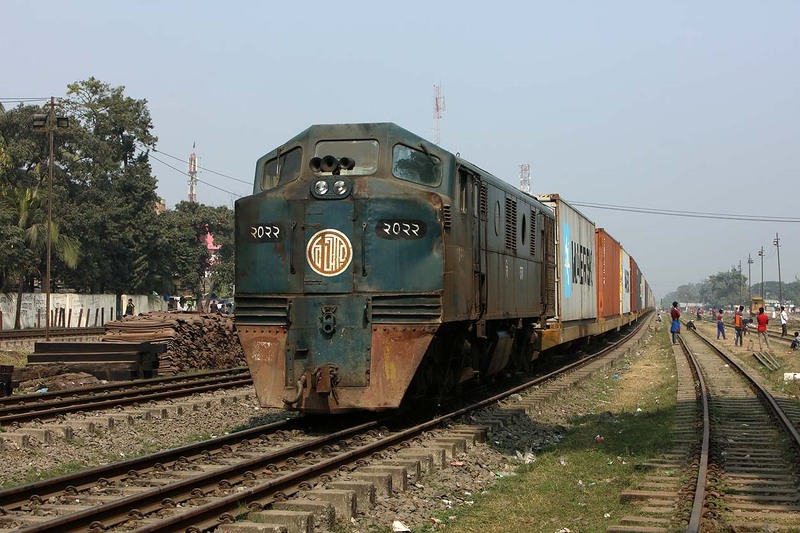 Bangladesh Railways 2720 with 'Jamalpur Commuter' 52 from Dewanganj Bazar to Dhaka at Dhaka Cantonment on 11 January 2019. 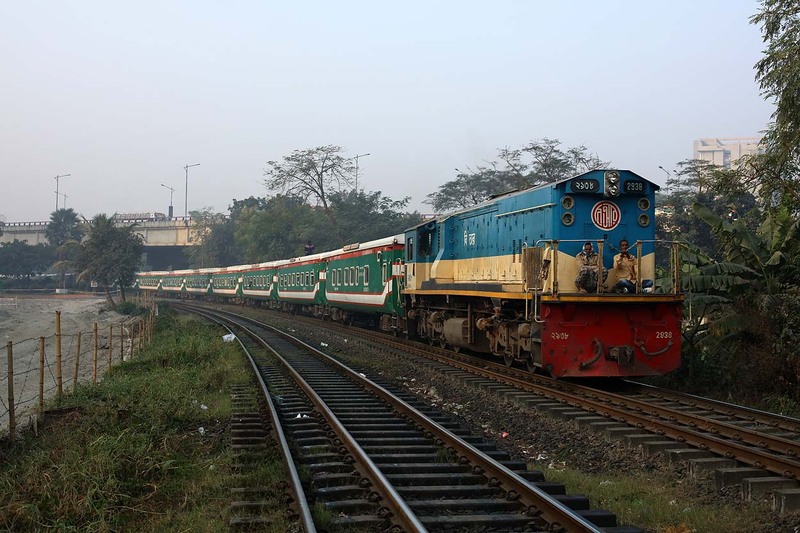 Bangladesh Railways 2936 with Intercity train 'Subarna Express' 701 from Chittagong to Dhaka at Dhaka Cantonment on 11 January 2019. 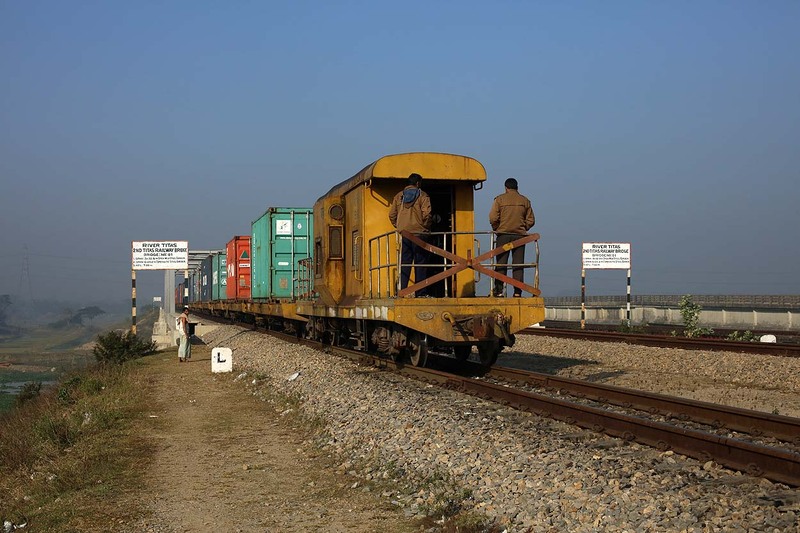 Bangladesh Railways 2019 runs a container train from Dhaka to Chittagong through Dhaka Cantonment on 11 January 2019. 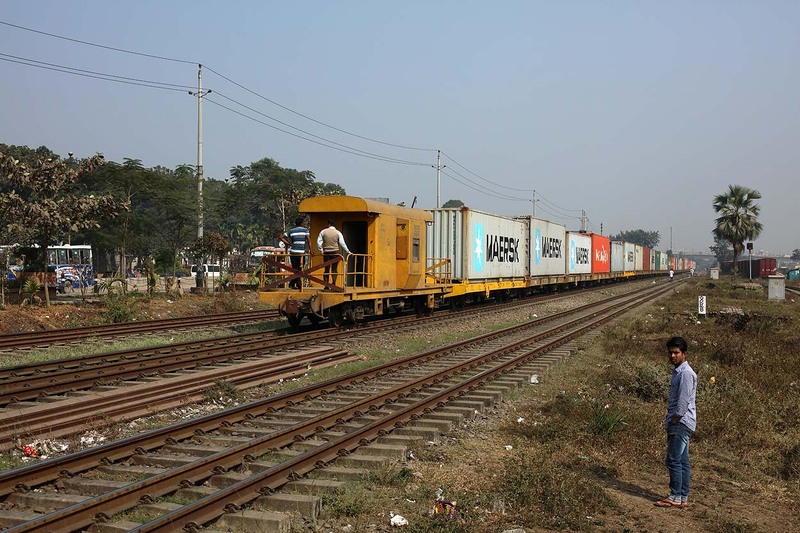 A conductor van brings up the rear of the container train (hauled by Bangladesh Railways 2019) from Dhaka to Chittagong at Dhaka Cantonment on 11 January 2019. 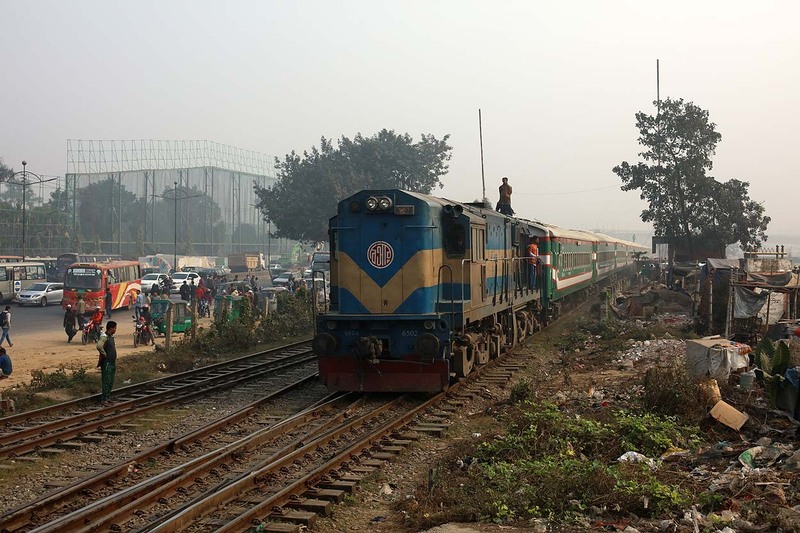 Bangladesh Railways 6508 with a train from Tangail Chittagong to Dhaka at Dhaka Cantonment on 11 January 2019. 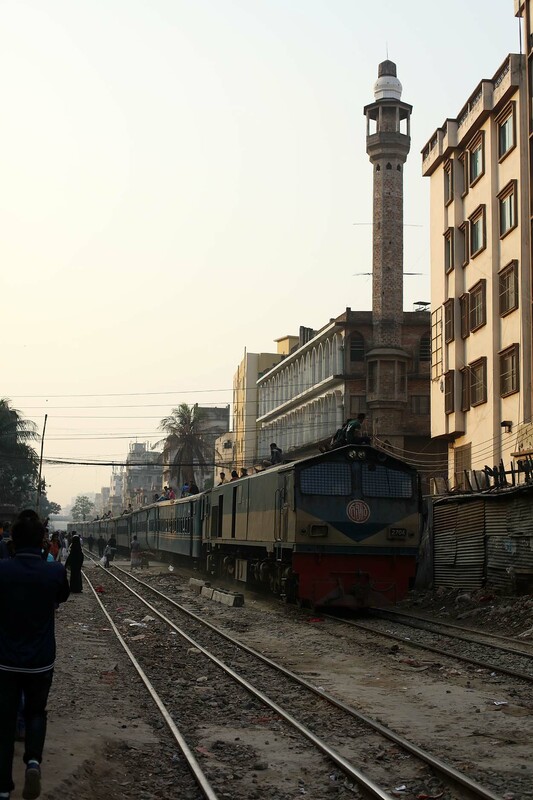 Bangladesh Railways 2718 with 'Comilla Cummuter' 89 from Comilla to Dhaka at Dhaka Cantonment on 11 January 2019. 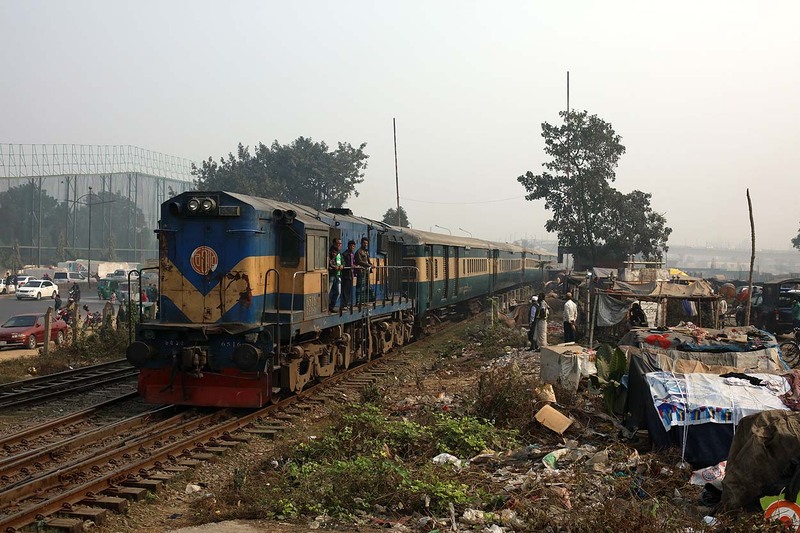 Bangladesh Railways 2913 with 'Vawal Express' 56 from Dewanganj Bazar to Dhaka at Dhaka Cantonment on 11 January 2019. 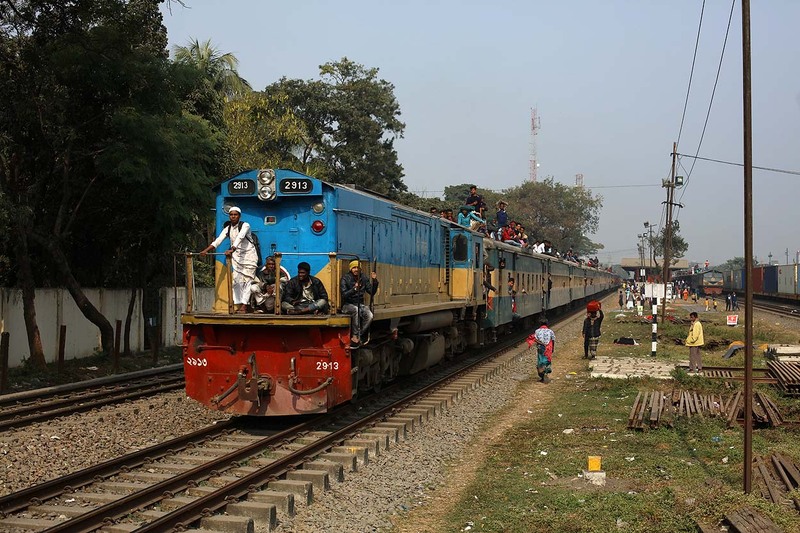 Bangladesh Railways 2804 with 'Isakhan Express' 39 from Dhaka to Mymensingh at Dhaka Cantonment on 11 January 2019. 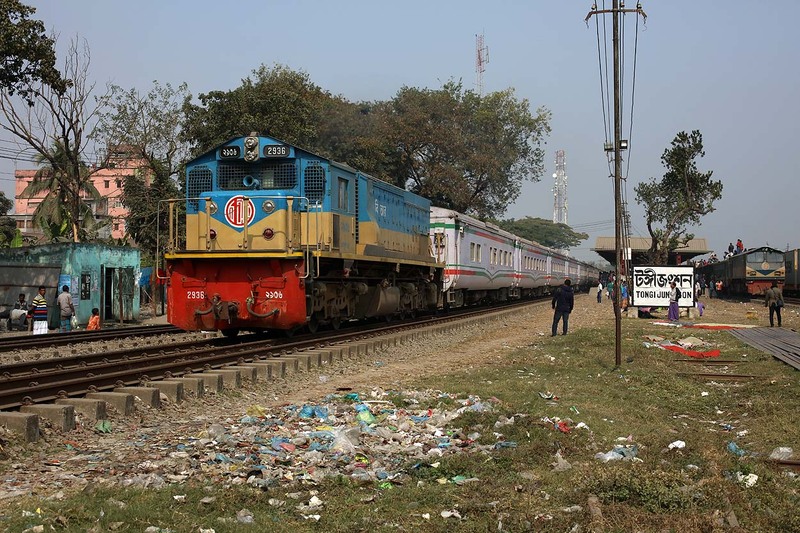 Bangladesh Railways 6516 with Intercity train 'Silk City Express' 754 from Rajshahi to Dhaka at Dhaka Cantonment on 11 January 2019. 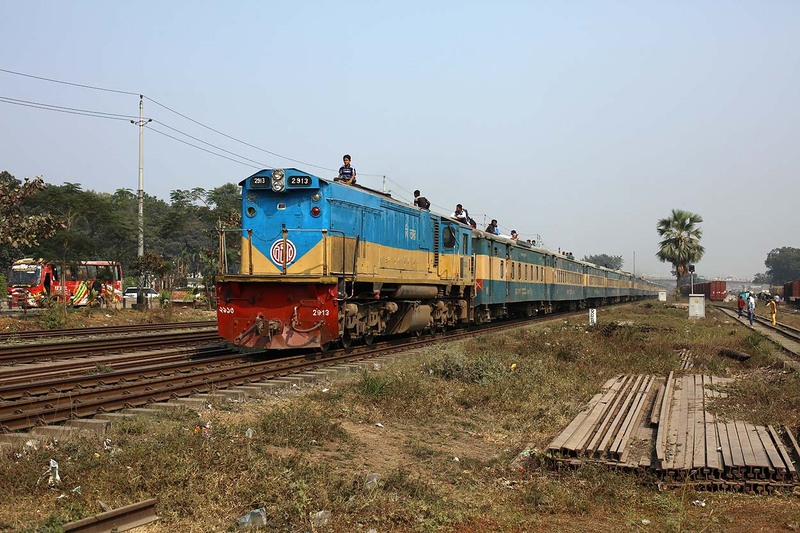 Bangladesh Railways 2719 with Intercity train 'Bharamaputra' 744 from Mymensingh to Dhaka at Dhaka Cantonment on 11 January 2019. 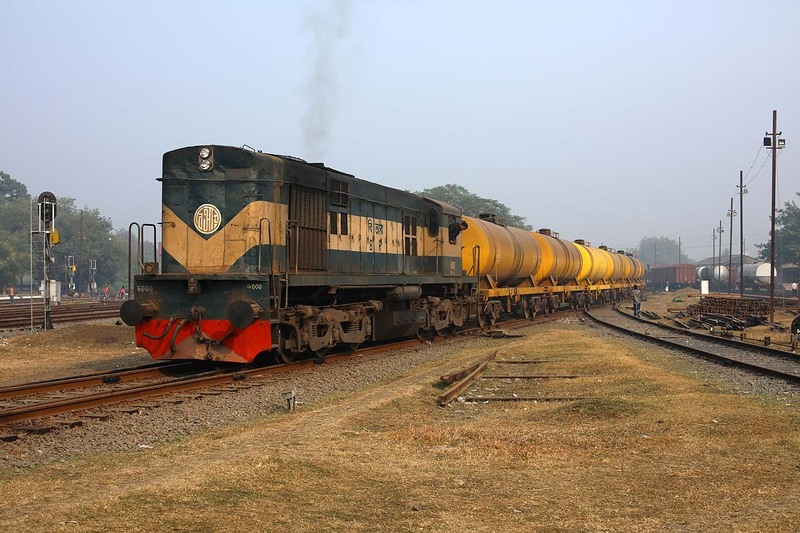 Bangladesh Railways 2224 arrives with a rerailing van from Dhaka at Dhaka Cantonment while Bangladesh Railways 2233 stands with a tank car train (of which one tank car was derailed) on 11 January 2019. 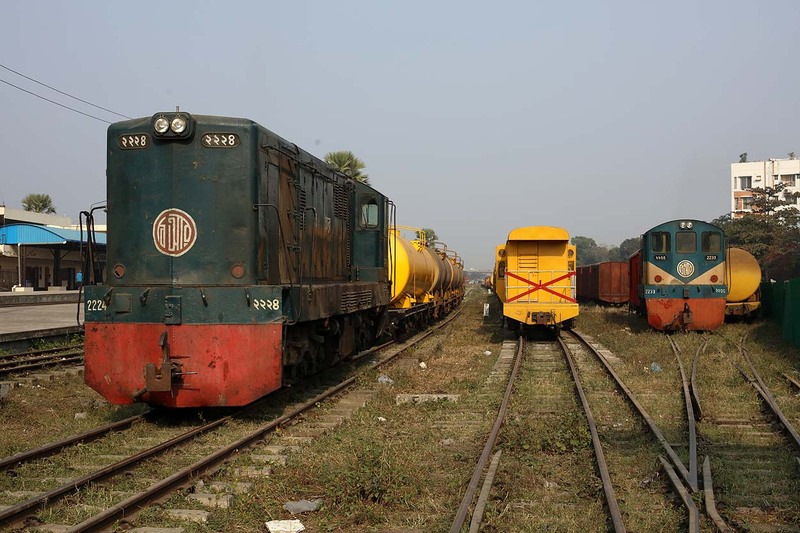 Bangladesh Railways 2233 stands with some tank cars at Dhaka Cantonment while one derailed tank car on the right needs to be rerailed on 11 January 2019. 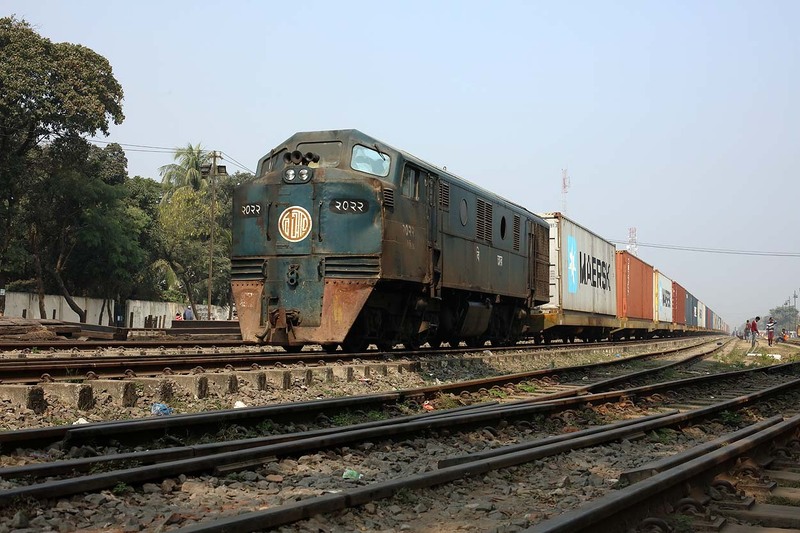 Bangladesh Railways 2233 sits with a rerailing van and Bangladesh Railways 2224 at Dhaka Cantonment while Bangladesh Railways 2915 passes by with a containertrain from Chittagong to Dhaka on 11 January 2019. 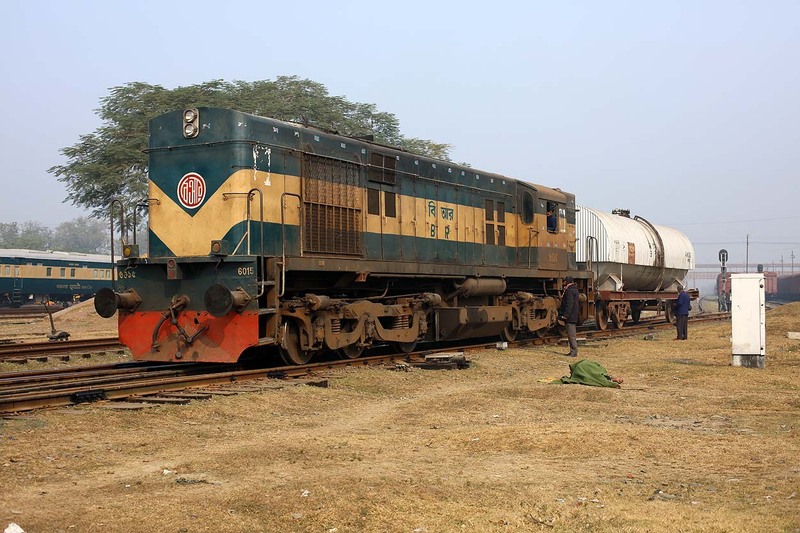 Bangladesh Railways and a rerailing van position themselves next to a derailed tank car while Bangladesh Railways 2224 wait with some tank cars at Dhaka Cantonment on 11 January 2019. 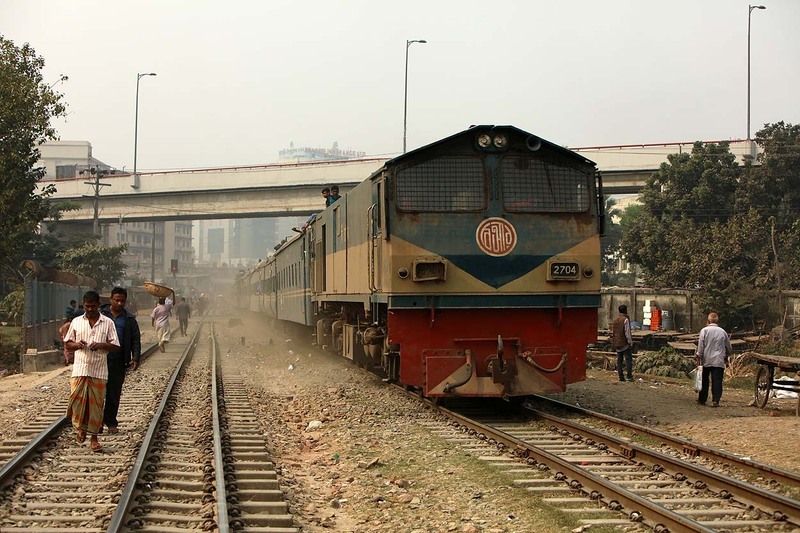 Bangladesh Railways 2704 runs through Dhaka Malibagh with 'Chattala Express' 67 from Chittagong to Dhaka on 11 January 2019. 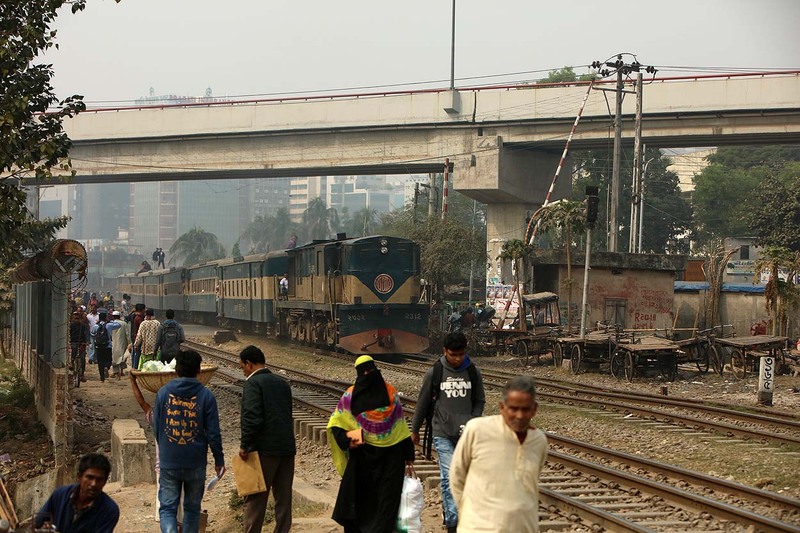 Bangladesh Railways 2913 runs through Dhaka Malibagh with 'Jamalpur Commuter' 51 from Dhaka to Dewanganj on 11 January 2019. 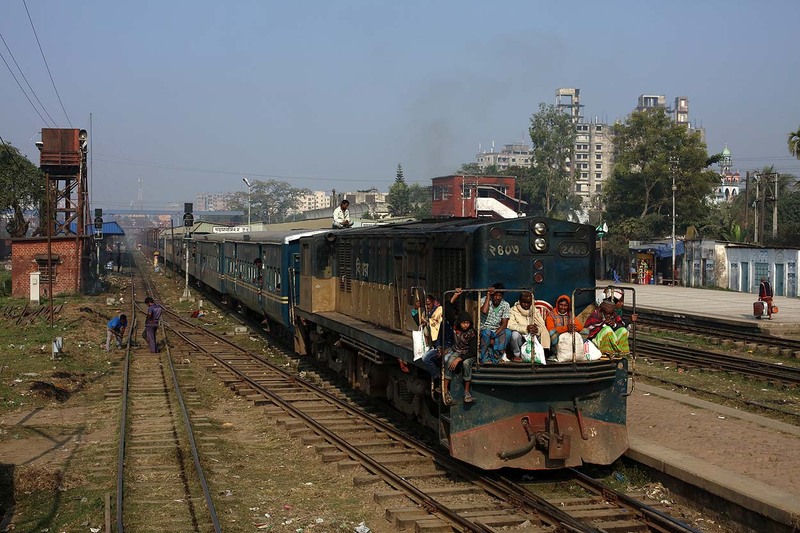 Bangladesh Railways 2927 runs through Dhaka Malibagh with Intercity train 'Haor Express' 778 from Mohangonj to Dhaka on 11 January 2019. 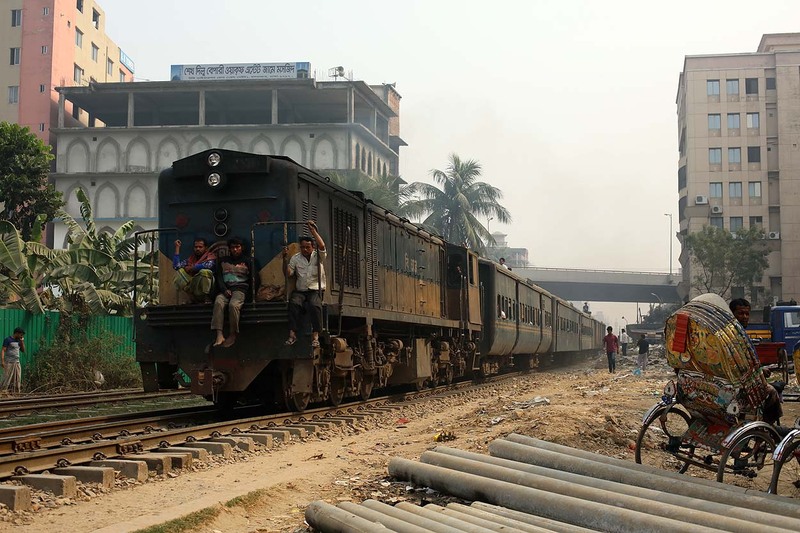 Bangladesh Railways 2319 runs through Dhaka Malibagh with Intercity train 'Egarosindhur Goduli' 750 from Kishoreganj to Dhaka on 11 January 2019. 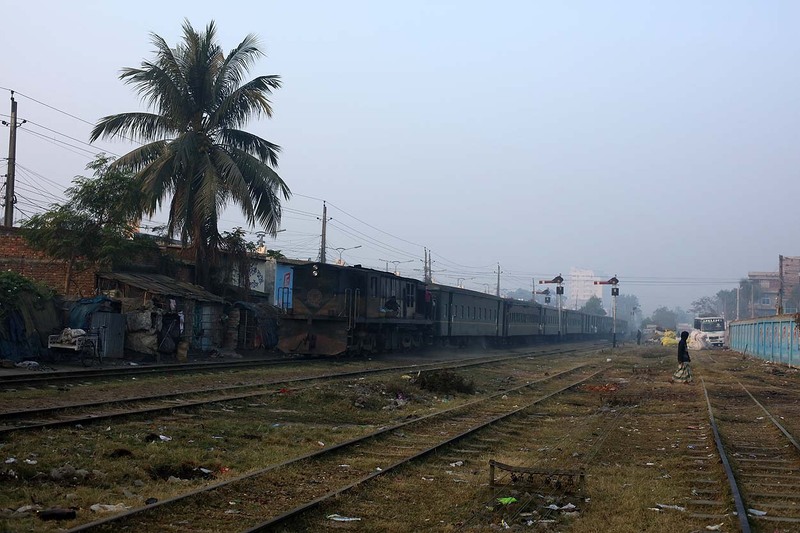 Bangladesh Railways 2601 runs through Dhaka Malibagh with Intercity train 'Jamuna Express' 745 from Dhaka to Tarakandi on 11 January 2019. 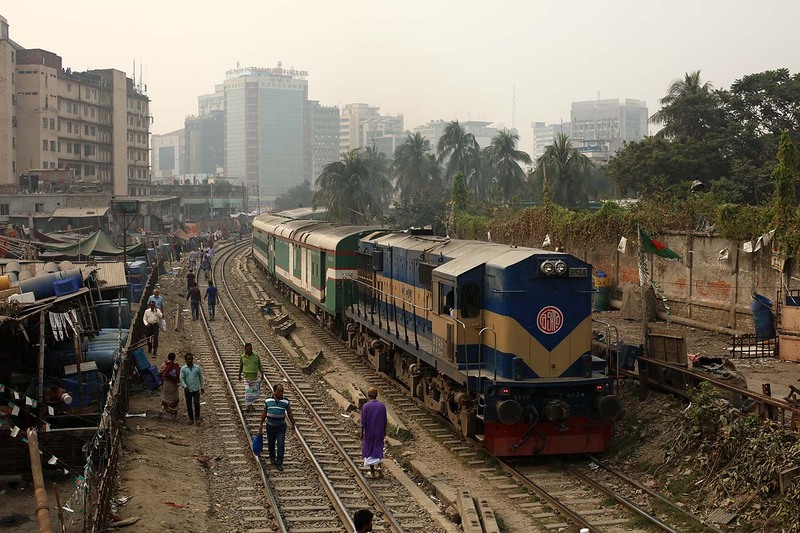 Bangladesh Railways 6508 runs through Dhaka Malibagh with Intercity train 'Sirajgonj Express' 776 from Dhaka to Sirajganj on 11 January 2019. 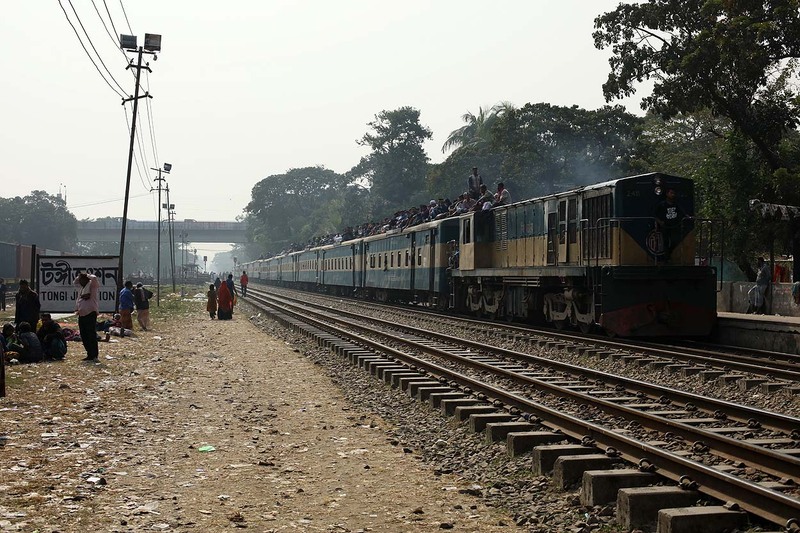 Bangladesh Railways 2719 halts at Dhaka Tejgaon with 'Titas Commuter' 36 from Dhaka to Akhaura on 11 January 2019. 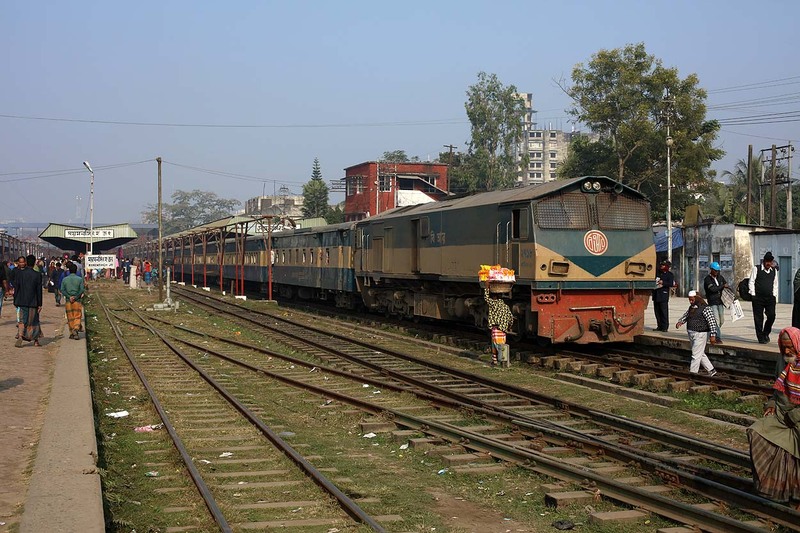 Bangladesh Railways 2935 runs through Dhaka Cantonment with Intercity train 'Mohanagar Provati' 704 from Dhaka to Chittagong on 12 January 2019. 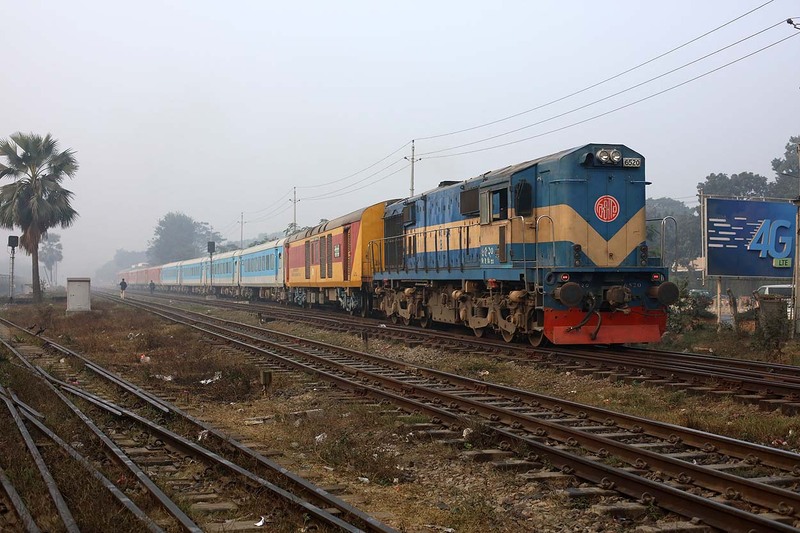 Bangladesh Railways 6526 accelarates out of Dhaka Cantonment with international Intercity train 'Moitree Express' 3110 (Dhaka Cantonment, BD - Kolkata, IN) on 12 January 2019. 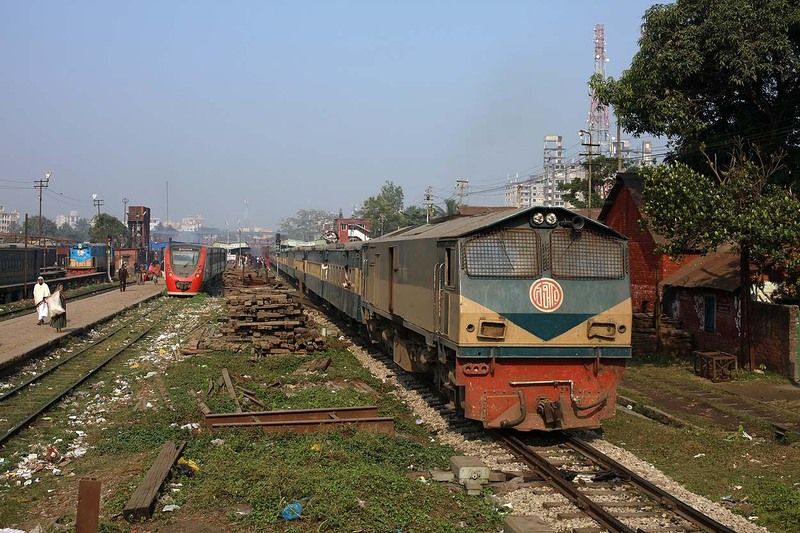 Bangladesh Railways 6506 runs through Dhaka Cantonment with Intercity train 'Nilsagar' 765 from Dhaka to Chilahati on 12 January 2019. 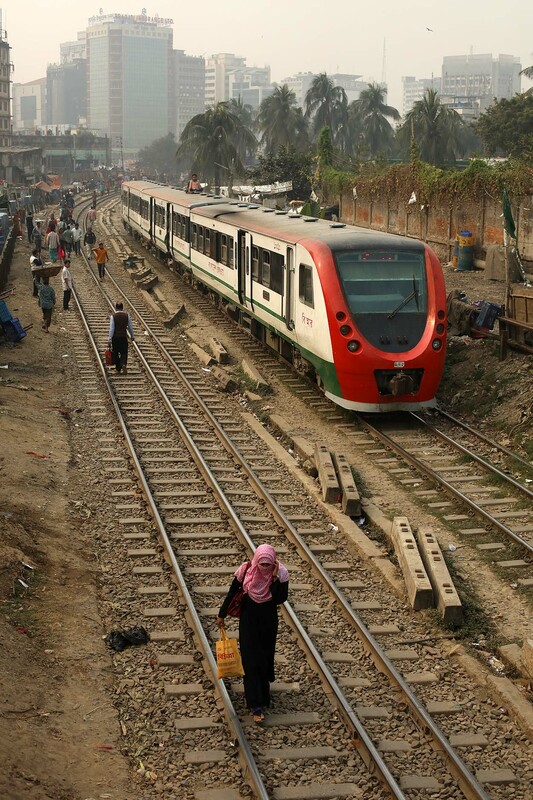 Bangladesh Railways 2932 runs through Dhaka Cantonment with an Intercity train from Dhaka towards Tongi Junction on 12 January 2019. 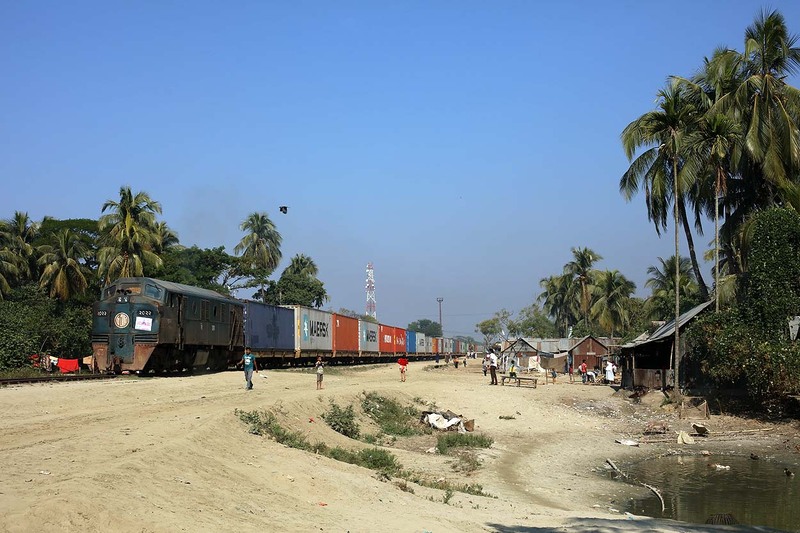 Bangladesh Railways 2022 waits with its containertrain from Chittagong to Dhaka at Tongi Junction while Bangladesh Railways 2719 will soon overtake him with a southbound passenger train to Dhaka on 12 January 2019. 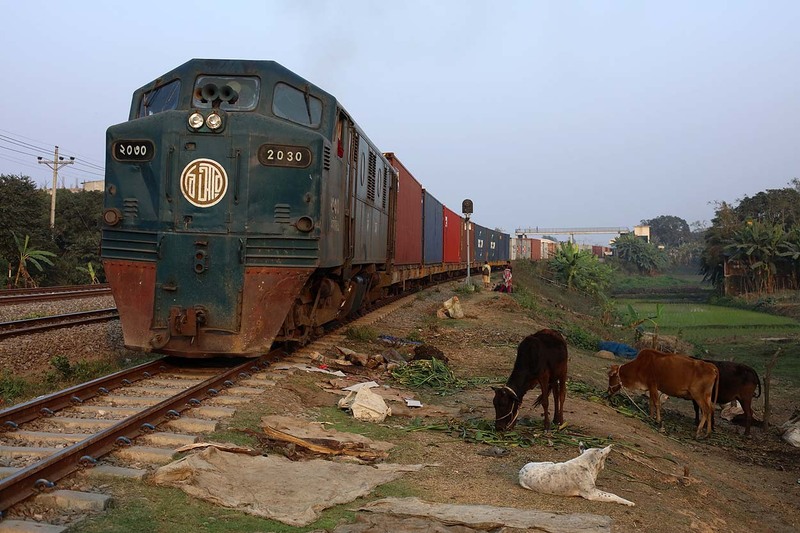 Bangladesh Railways 2022 waits with its containertrain from Chittagong to Dhaka at Tongi Junction on 12 January 2019. 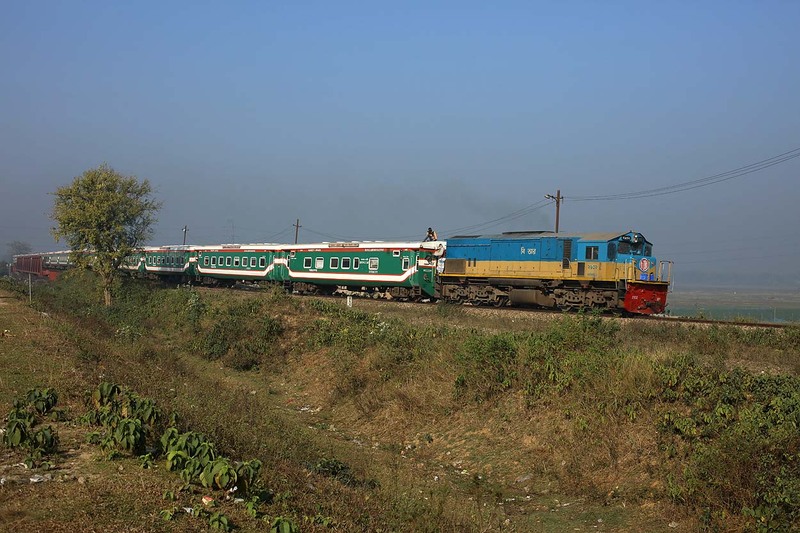 Bangladesh Railways 2936 and its Intercity train overtakes Bangladesh Railways 2719 at Tongi Junction on 12 January 2019. 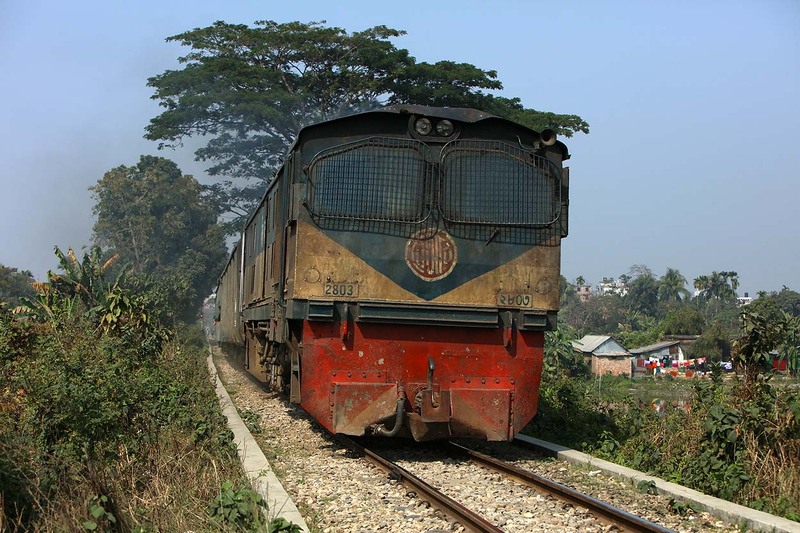 Bangladesh Railways 2719 will soon depart Tongi Junction with a passenger train to Dhaka on 12 January 2019. 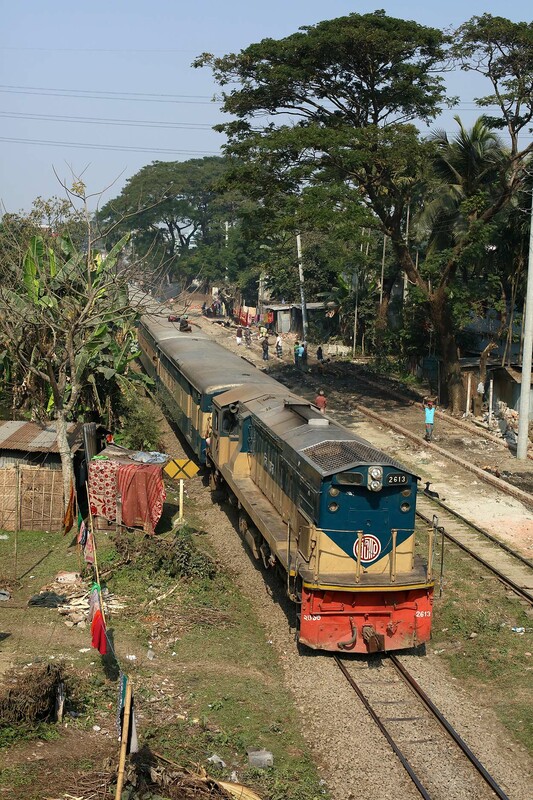 Bangladesh Railways 2411 arrives at Tongi Junction with Intercity train 'Tista Express' 707 from Dhaka to Dewanganj Bazar on 12 January 2019. 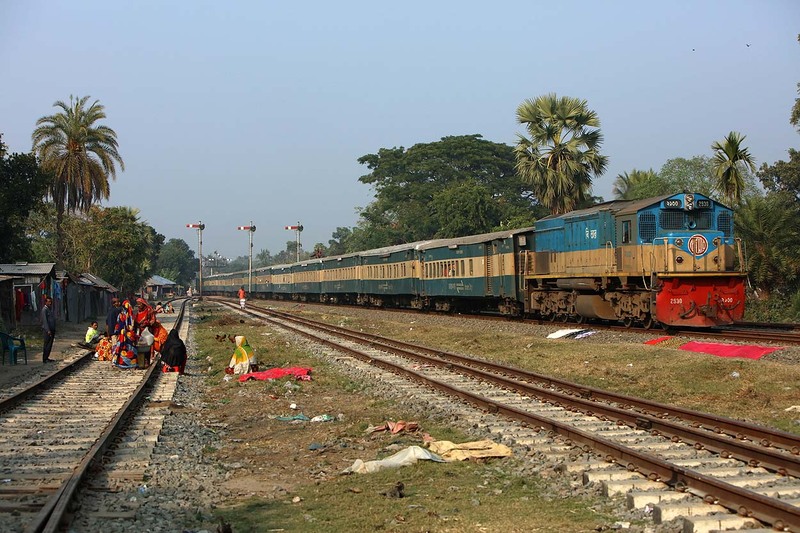 Bangladesh Railways 2913 and its Intercity train 'Subarna Express' 701 from Chittagong to Dhaka overtakes Bangladesh Railways 2719 at Tongi Junction on 12 January 2019. 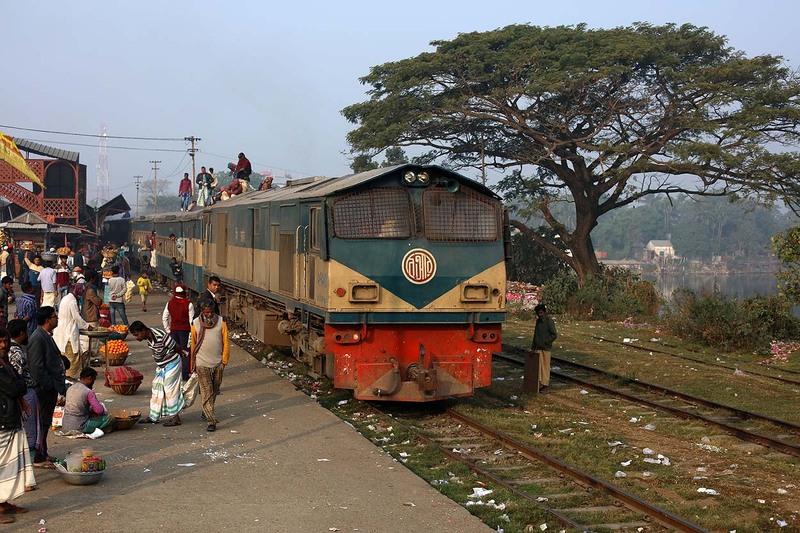 Bangladesh Railways DMU 10010 arrives at Tongi Junction from Dhaka while Bangladesh Railways 2719 is ready to depart with a passenger train to Dhaka on 12 January 2019. 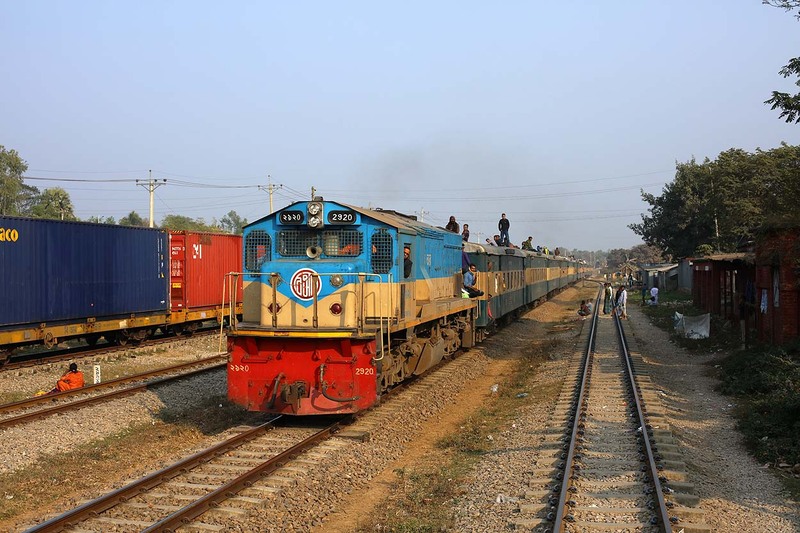 Bangladesh Railways 2022 waits with its containertrain from Chittagong to Dhaka at Tongi Junction while Bangladesh Railways 2719 overtakes him with a southbound passenger train to Dhaka on 12 January 2019. 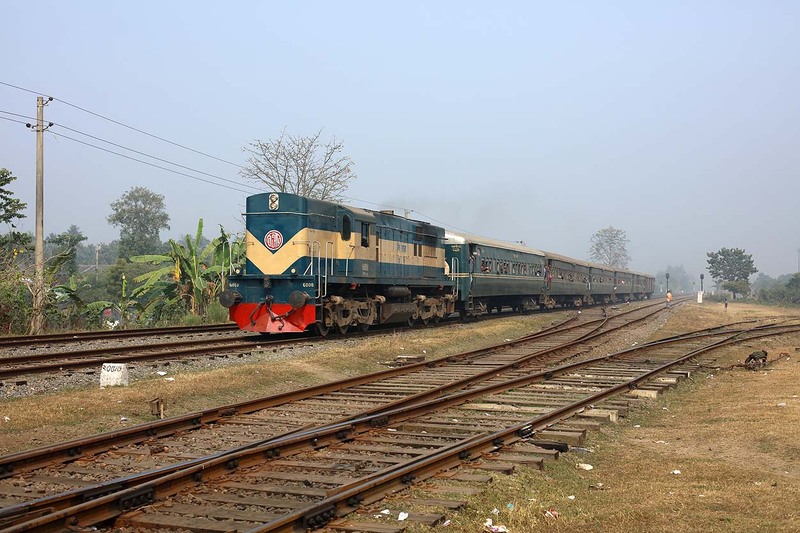 Due to major delays the 'Titas Commuter' 33 from Brahmanbaria to Dhaka and the 'Comilla Commuter' 89 from Comilla to Dhaka were coupled together and depart here from Pubail on 12 January 2019. 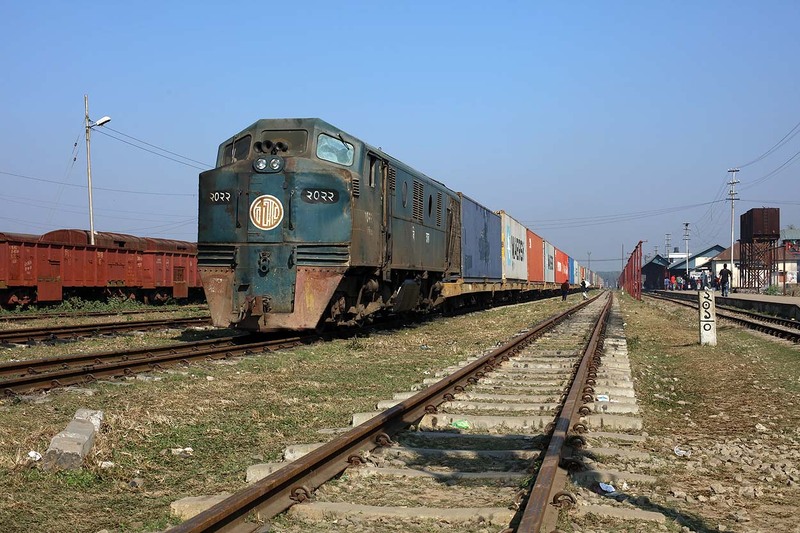 Bangladesh Railways 2030 arrives at Pubail with a container train from Chittagong to Dhaka on 12 January 2019. 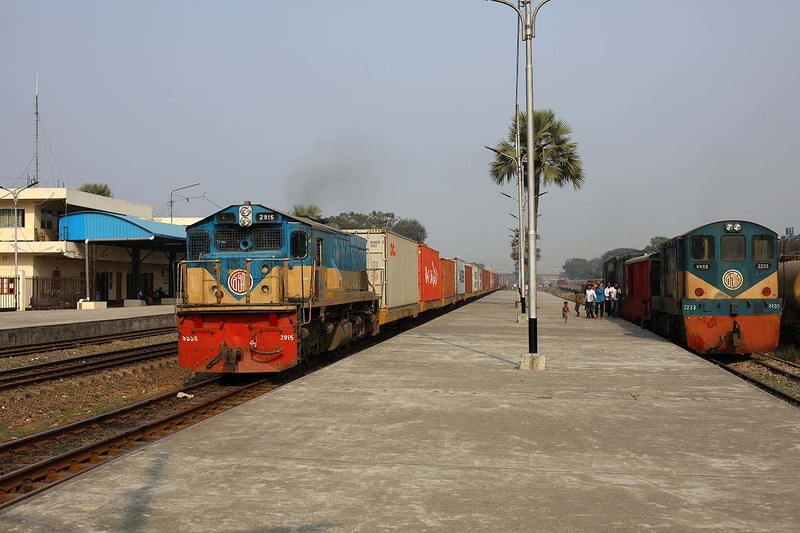 Bangladesh Railways 2030 waits at Pubail with a container train from Chittagong to Dhaka on 12 January 2019. 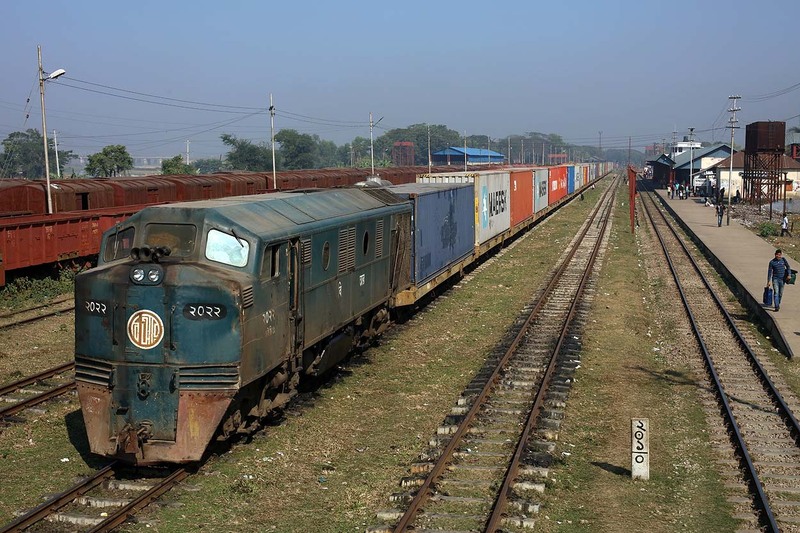 Bangladesh Railways 2031 arrives at Pubail with a container train from Dhaka to Chittagong on 12 January 2019. 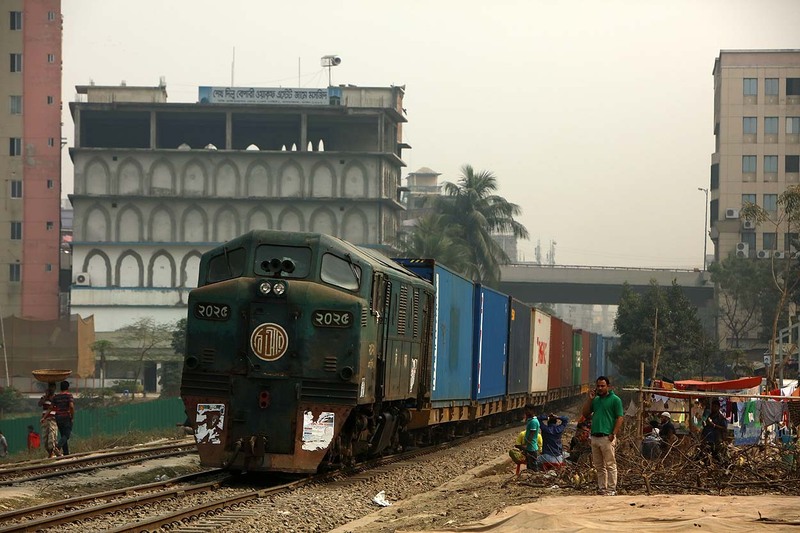 Bangladesh Railways 2031 waits at Pubail with a container train from Dhaka to Chittagong on 12 January 2019. 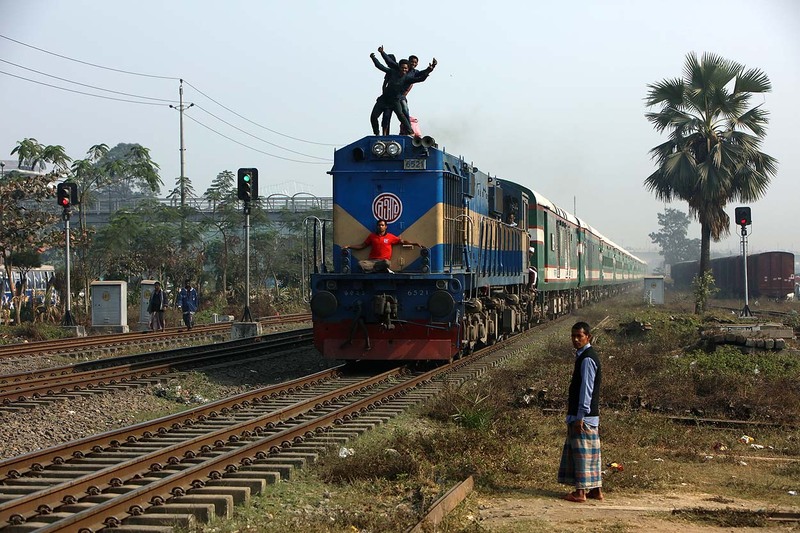 Bangladesh Railways 2905 storms through Pubail with 'Chattala Express' 67 from Chittagong to Dhaka on 12 January 2019. 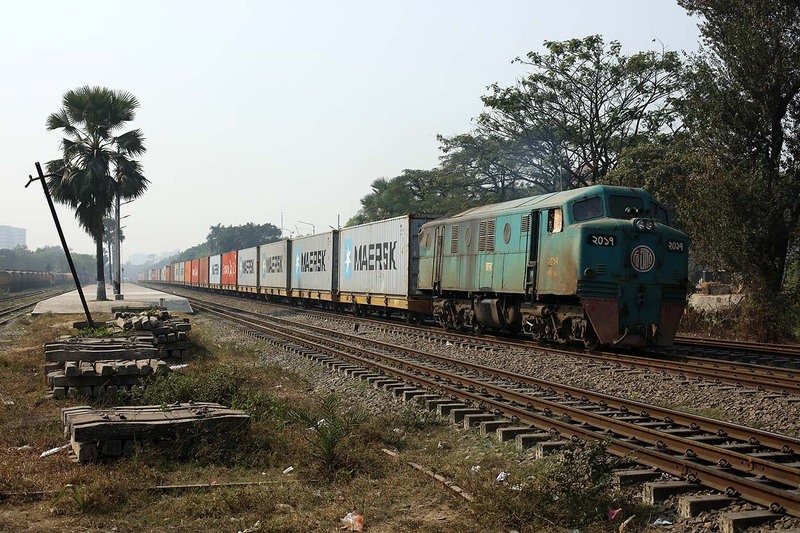 Bangladesh Railways 2930 with its Intercity train 'Joyantika Express' 717 (Dhaka - Chittagong) passes Bangladesh Railways 2031 with its container train from Dhaka to Chittagong at Pubail on 12 January 2019. 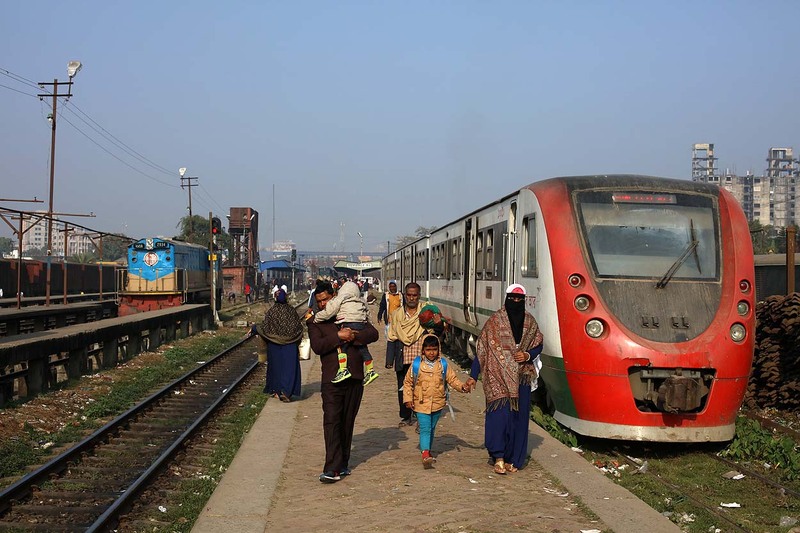 Bangladesh Railways 2920 storms through Pubail with Intercity train 'Kalani Express' 774 from Sylhet to Dhaka on 12 January 2019. 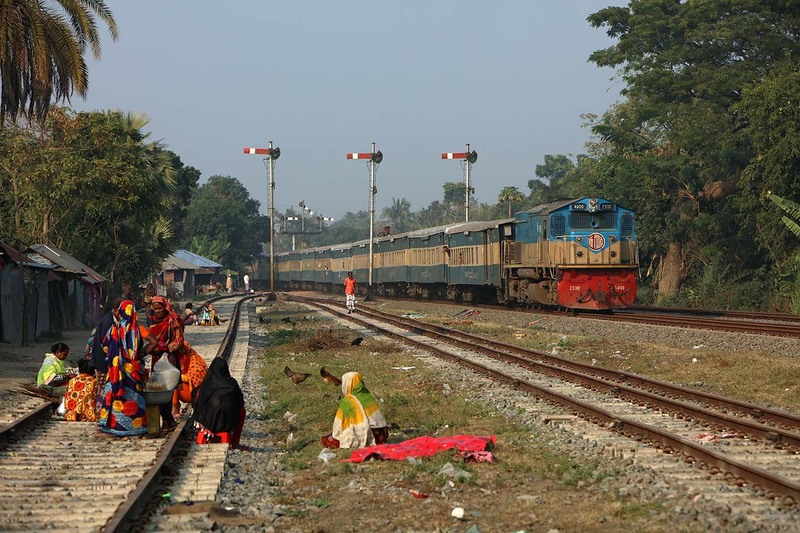 Bangladesh Railways 2936 approaches Pubail with Intercity train 'Subarna Express' 702 from Dhaka to Chittagong on 12 January 2019. 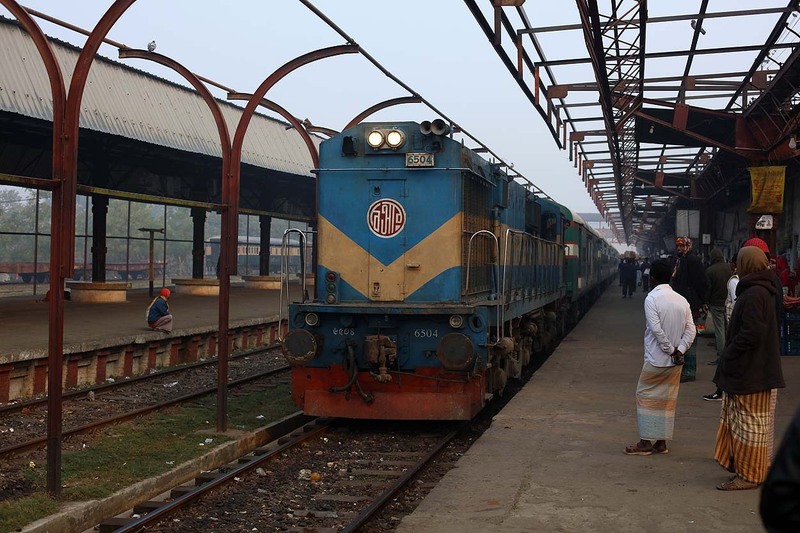 Bangladesh Railways 2802 arrives at Pubail with 'Jamalpur Commuter' 51 from Dhaka to Dewanganj on 12 January 2019. 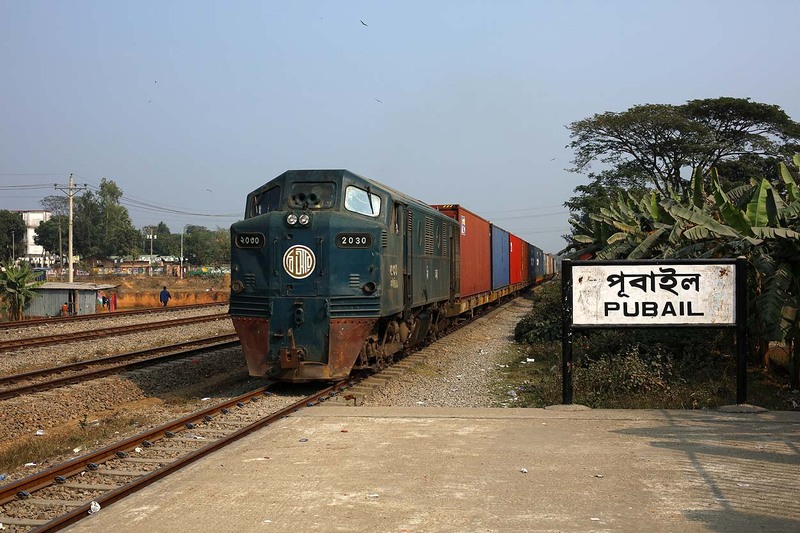 Bangladesh Railways 2030 departs Pubail with a container train from Chittagong to Dhaka on 12 January 2019. 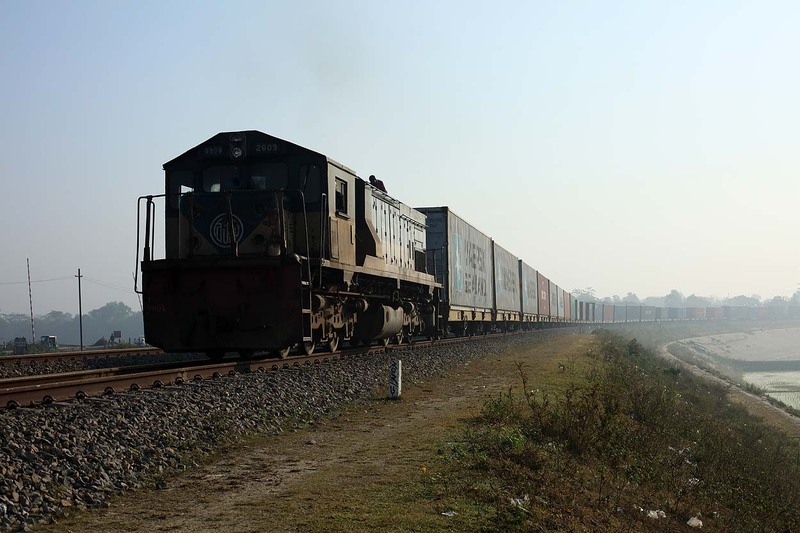 Bangladesh Railways 2609 round the curve at Akhaura with a containertrain from Chittagong to Dhaka on 13 January 2019. 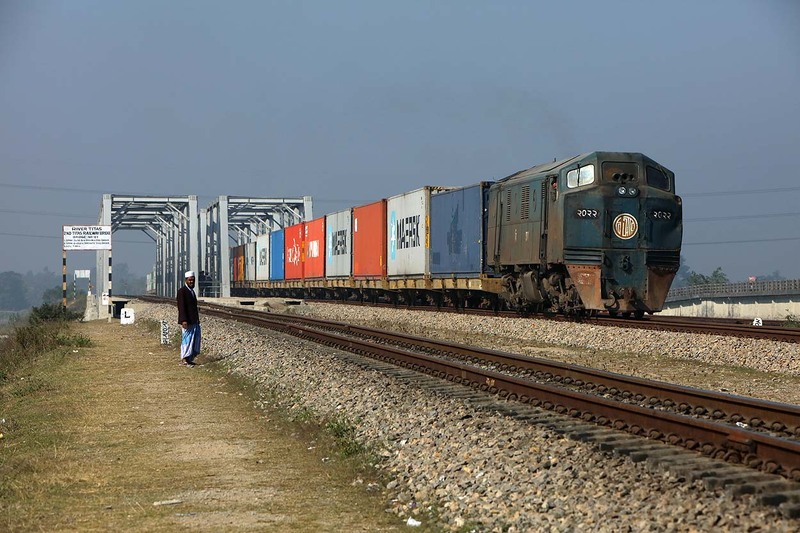 Conductor van brings up the rear of a containertrain from Chittagong to Dhaka (powered by Bangladesh Railways 2609) at the 2nd Titas River bridge at Akhaura on 13 January 2019. 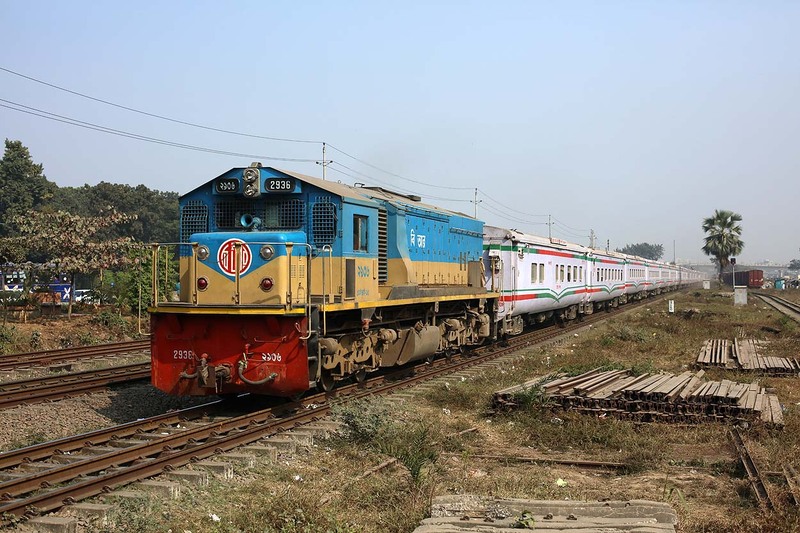 Bangladesh Railways 2932 with Intercity train 'Parabat Express' 709 from Dhaka to Sylhet at Akhaure on 13 January 2019. 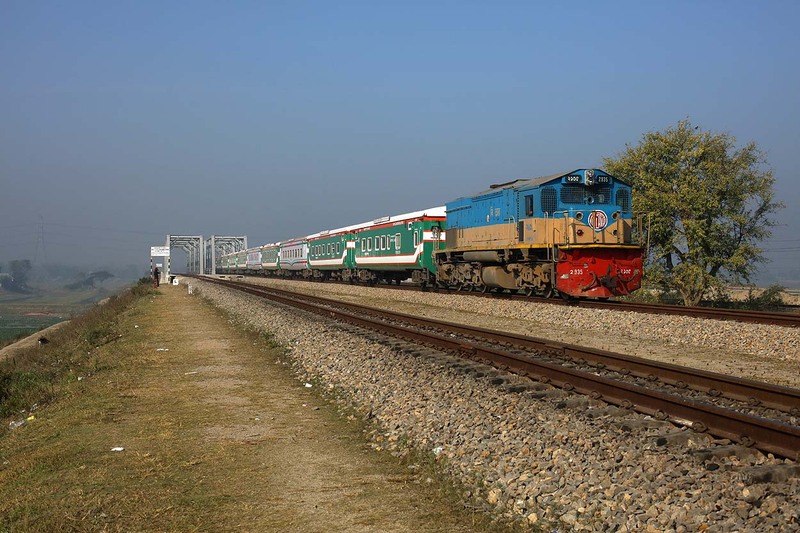 Bangladesh Railways 2935 crosses with Intercity train 'Mohanagar Provati' 704 from Dhaka to Chittagong the 2nd Titas River bridge at Akhaura on 13 January 2019. 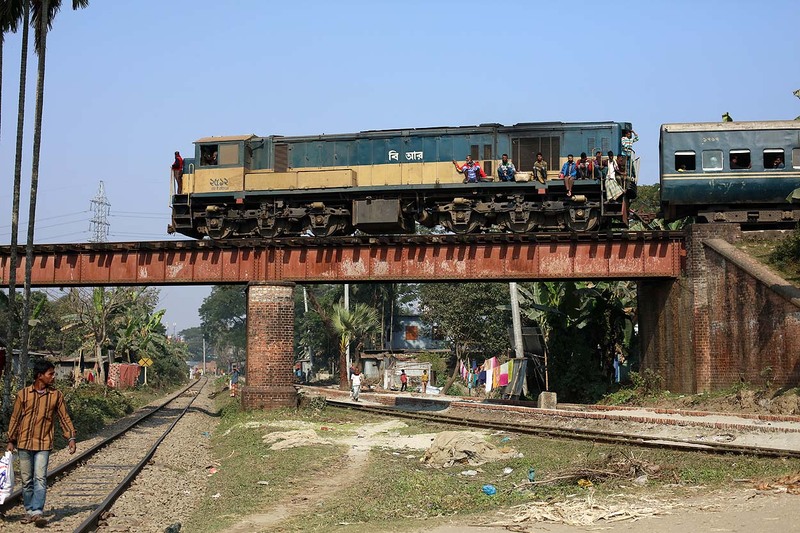 Bangladesh Railways 2910 approaches the 2nd Titas River bridge at Akhaura with Intercity train 'Upukol Express' 711 (Noakhali - Dhaka) on 13 January 2019. 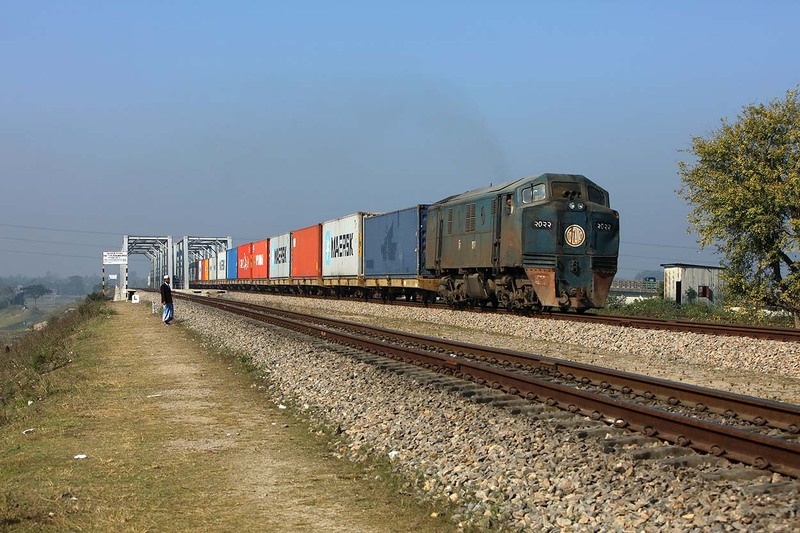 Bangladesh Railways 2022 crosses with a containertrain from Dhaka to Chittagong the 2nd Titas River bridge at Akhaura on 13 January 2019. 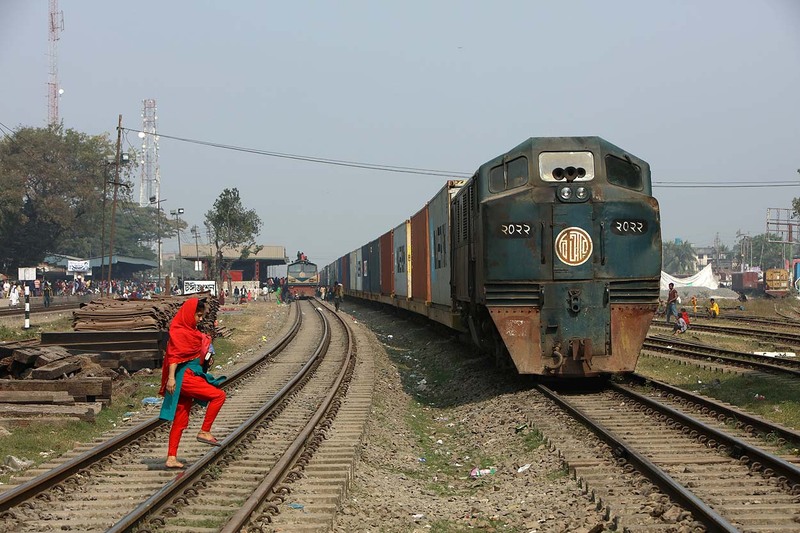 Bangladesh Railways 2022 pauses with a containertrain from Dhaka to Chittagong at Akhaura on 13 January 2019. 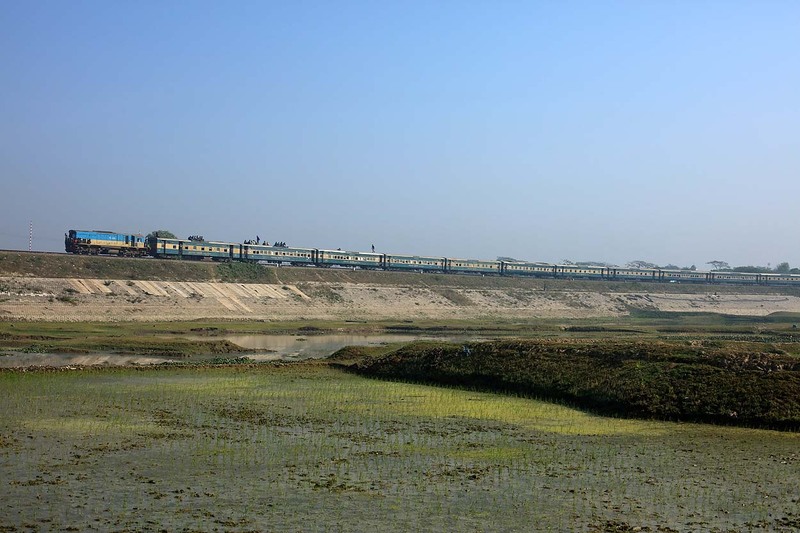 Bangladesh Railways 2920 approaches Akhaura with Intercity train 'Bijoy Express' 785 from Chittagong to Mymensingh on 13 January 2019. 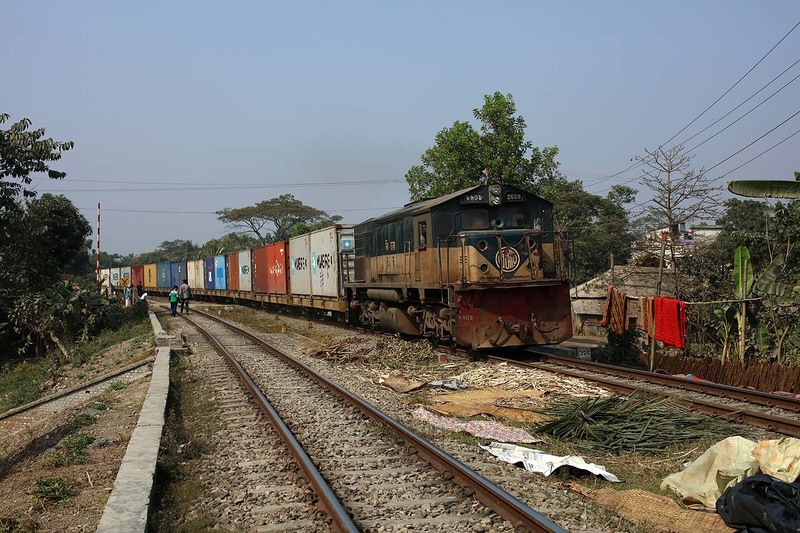 Bangladesh Railways 2022 accelarates out of Akhaura with a containertrain from Dhaka to Chittagong on 13 January 2019. 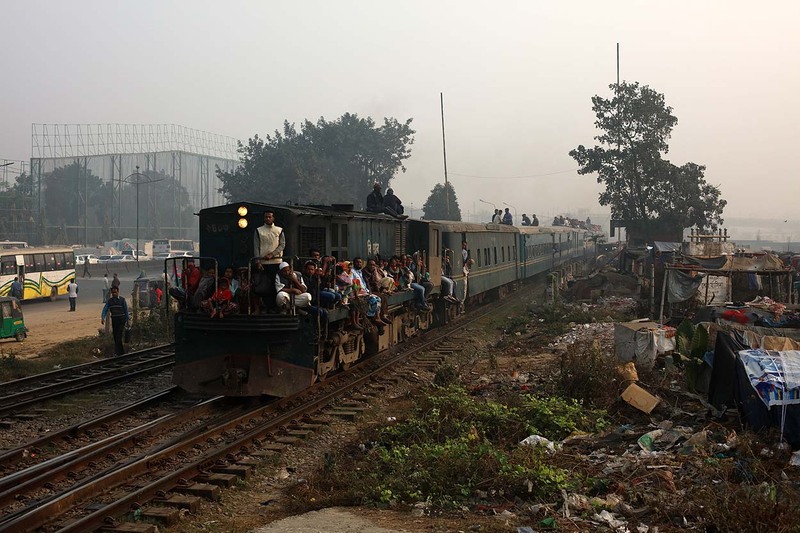 At Akhaura, some people put a pamflet for an upcoming Muslim gathering in Chittagong on the locomotive. 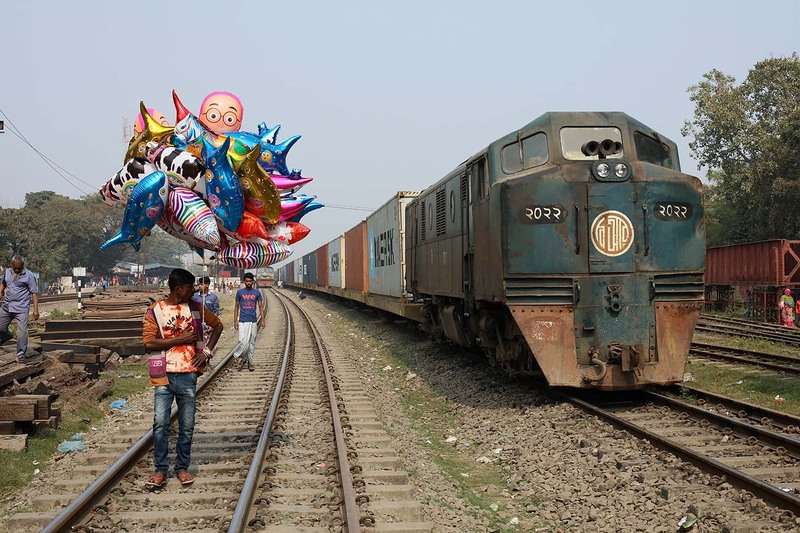 Graffiti Bangladesh style. 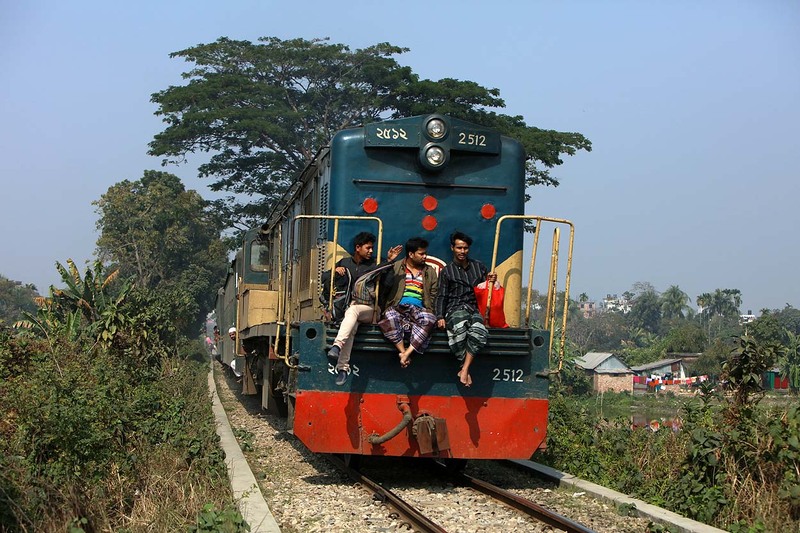 While 17 people concern themselves with a cement mixer in Mandabag many more try to climb on board and on top of 'Karnapuli Express 4' hauled by Bangladesh Railways 2612 on 13 January 2019. 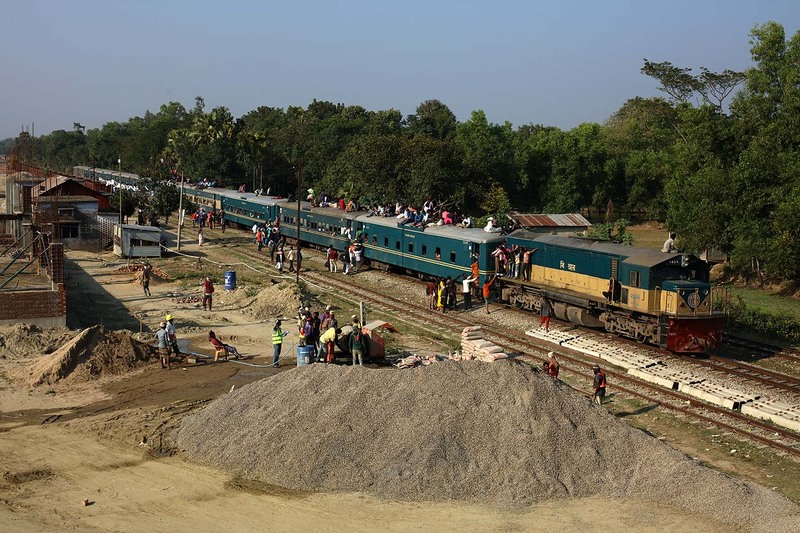 During the halt of 'Mymensingh Express' 38 (Bangabandhu Setu Purbo - Chittagong) at Mandabag the same 17 cement mixer workers outnumbered the amount of people on the train on 13 January 2019. 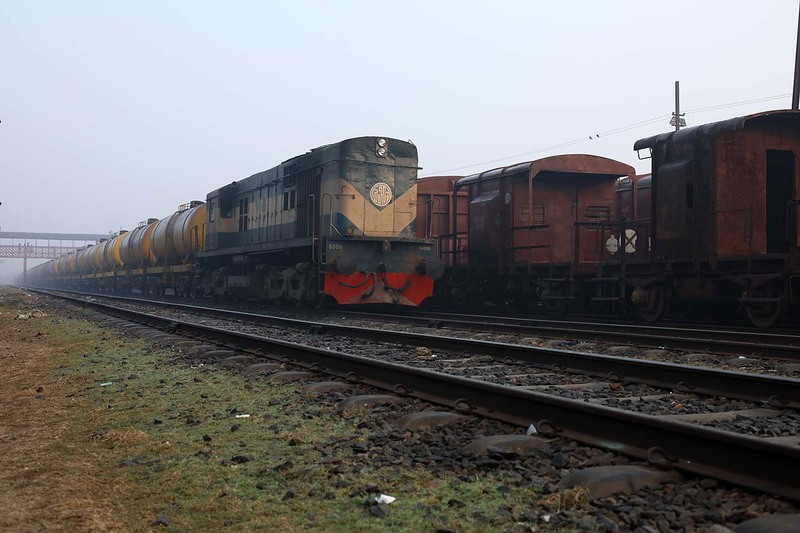 A 2-axle diesel locomotive from rail contractor MAXX takes a rest with three ballast wagons at Alishwar on 14 January 2019. 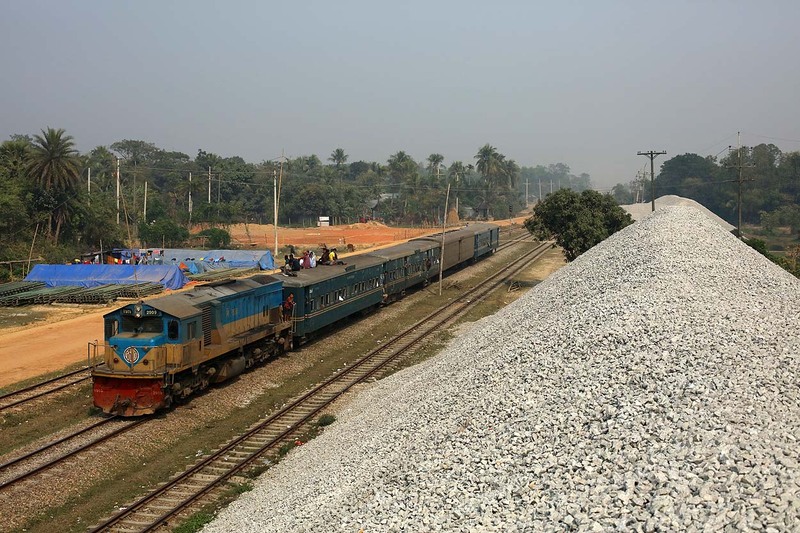 The final hand is being laid at double tracking the last stretch between Dhaka and Chittagong: Akhaura - Laksam Junction. 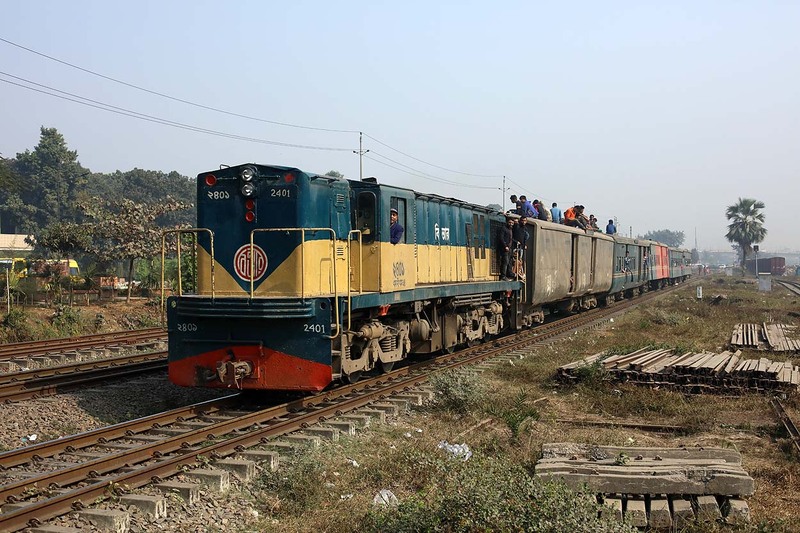 MAXX staff showed us with proud their well maintained ex-KTM Class 22 English Electric locomotive at Laksam Junction on 14 January 2019. 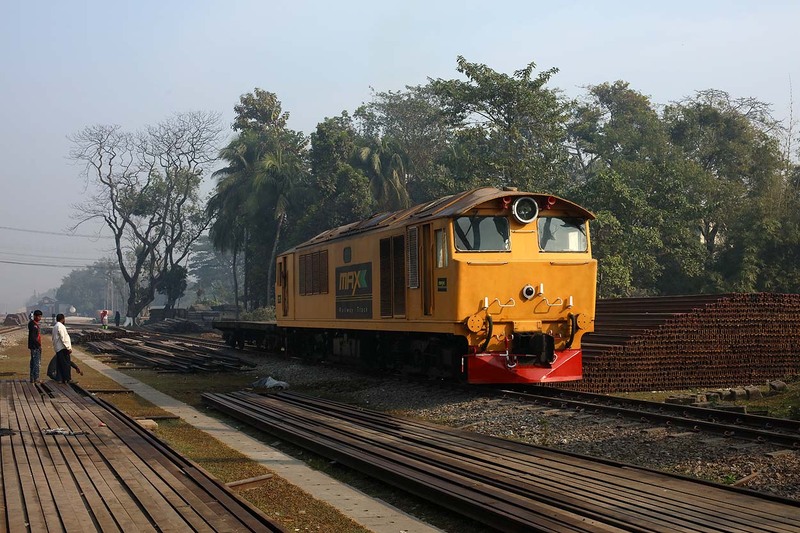 MAXX staff showed us with proud their well maintained ex-KTM (Malaysia) Class 22 English Electric locomotive at Laksam Junction on 14 January 2019. 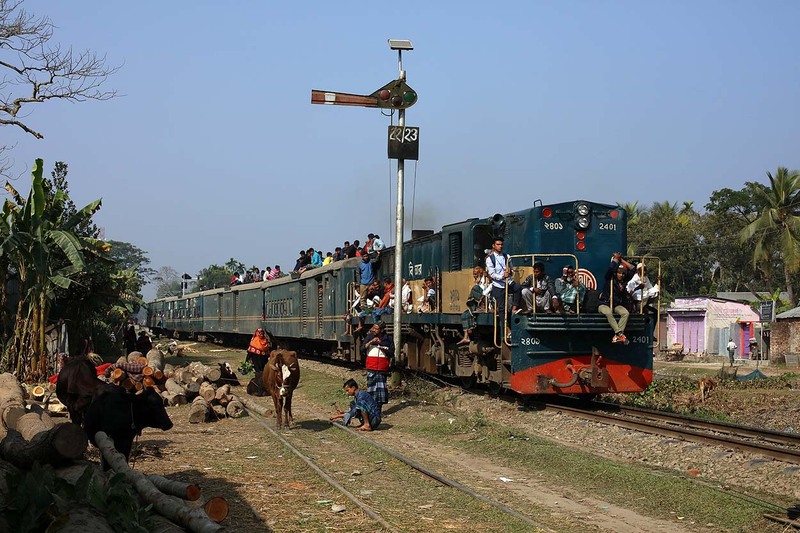 Bangladesh Railways 2939 makes its stop with Intercity train 'Bijoy Express' 785 (Chittagong - Mymensingh) while inspectors squeeze themselves in a draisine at Laksam Junction on 14 January 2019. 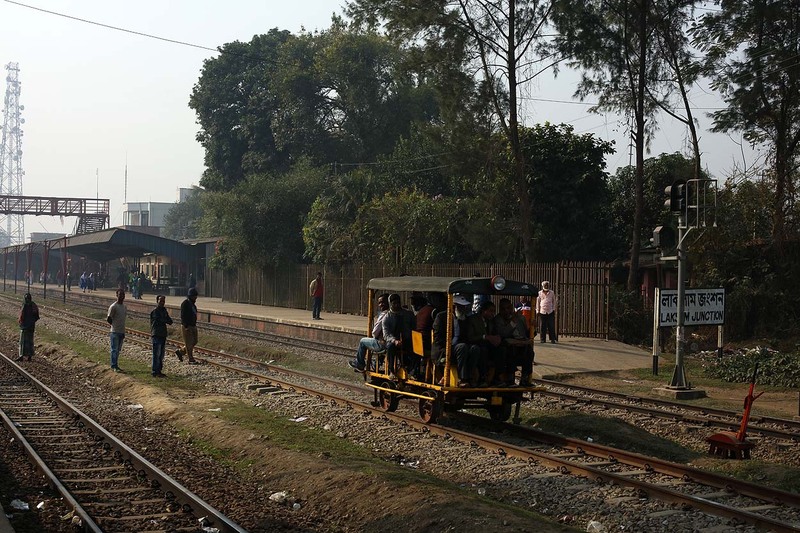 Inspectors squeezed themselves in a draisine to inspect the dual tracking towards Akhaura at Laksam Junction on 14 January 2019. 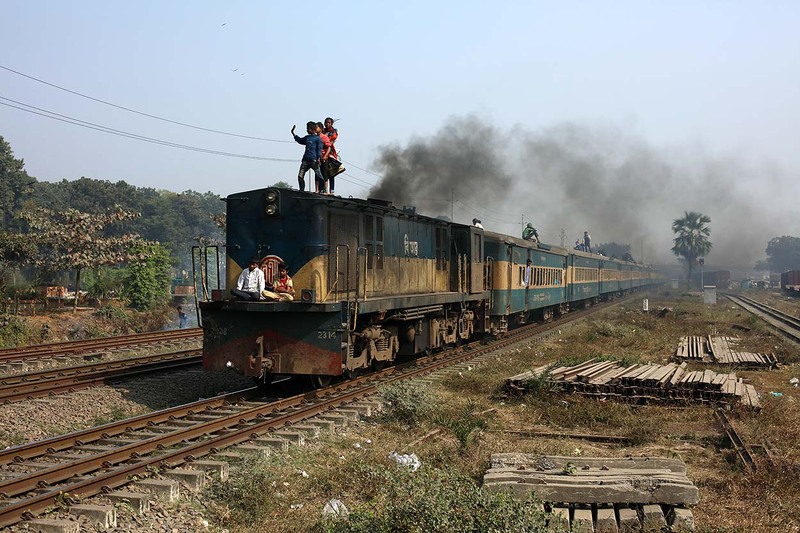 Bangladesh Railways 2909 approaches Lalmai with 'Jalalabad Express' 14 from Sylhet to Chittagong on 14 January 2019. 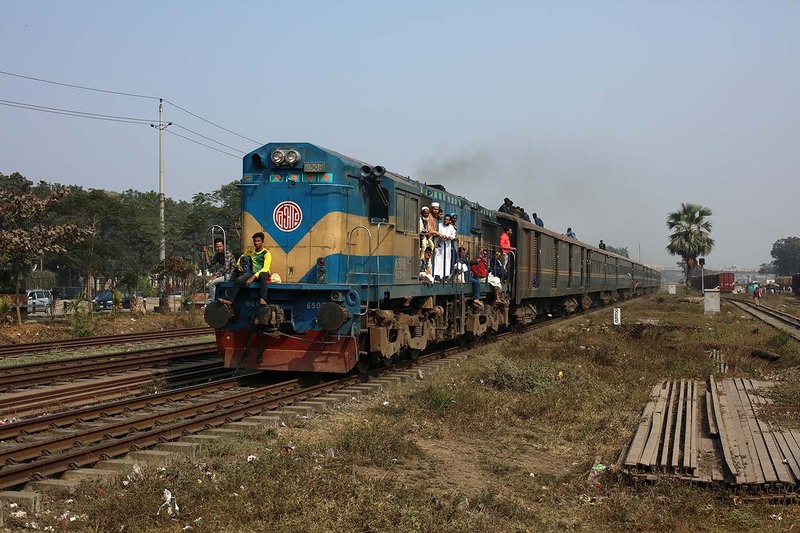 Bangladesh Railways 2925 approaches Lalmai with Intercity train 'Mohanagar Provati' 704 from Dhaka to Chittagong on 14 January 2019. 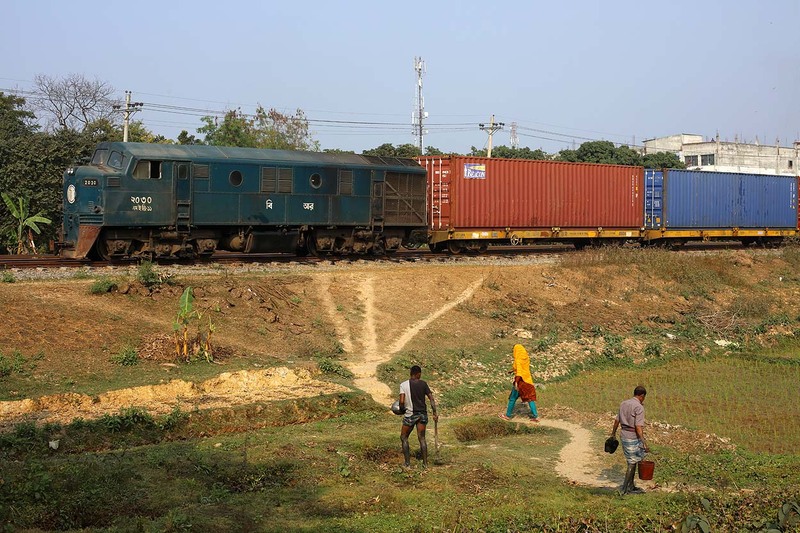 Bangladesh Railways 2720 leaves Lalmai with 'Chattala Express' 67 from Chittagong to Dhaka while Bangladesh Railways 2721 is used to unload ballast wagons on 14 January 2019. 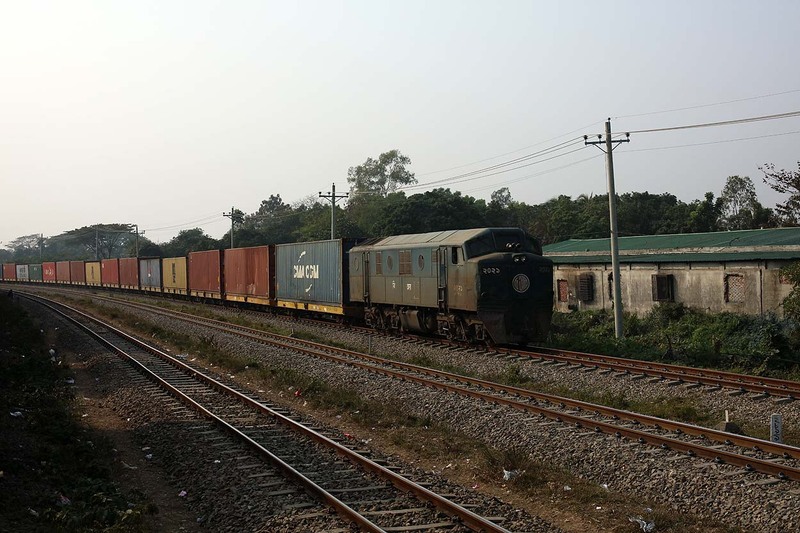 Bangladesh Railways 2609 leaves Laksam with a containertrain from Dhaka to Chittagong on 14 January 2019. 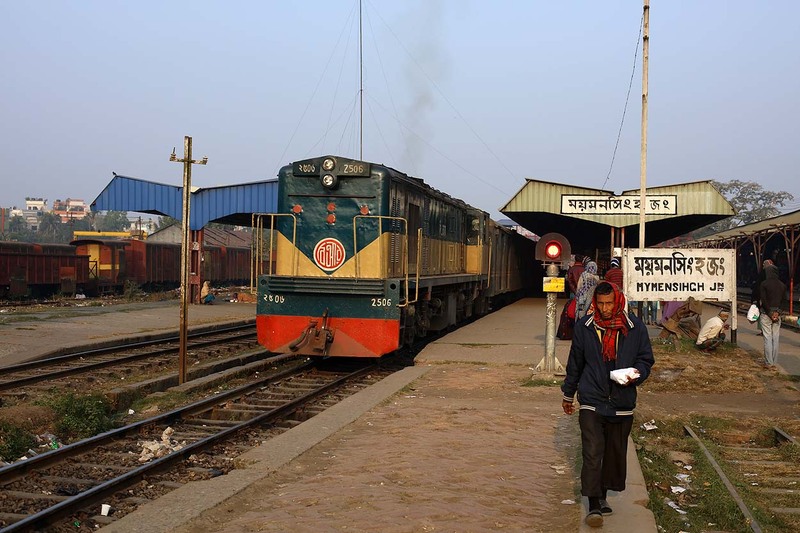 Bangladesh Railways 2720 arrives at Bhairab Junction with Intercity train 'Egarosindhur Provati' 738 from Kishoreganj to Dhaka on 15 January 2019. 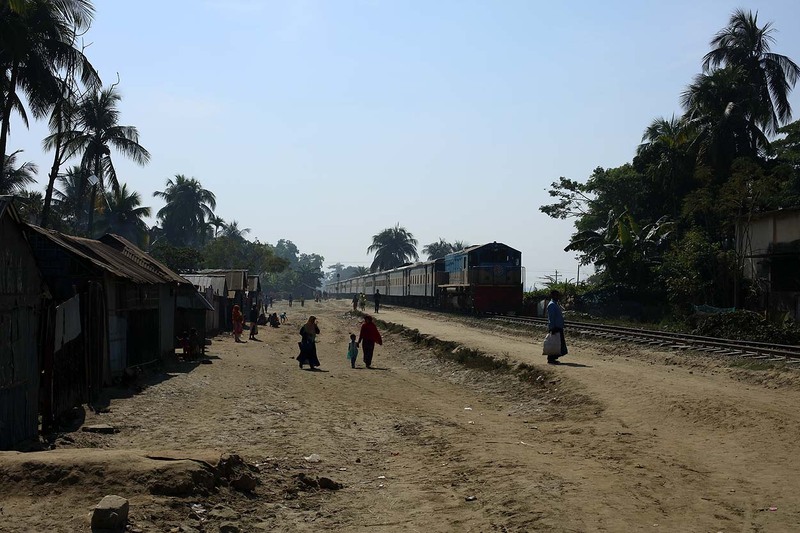 Bangladesh Railways 2935 runs through Bhairab Junction with Intercity train 'Sonar Bangla Express' 788 from Dhaka to Chittagong on 15 January 2019. 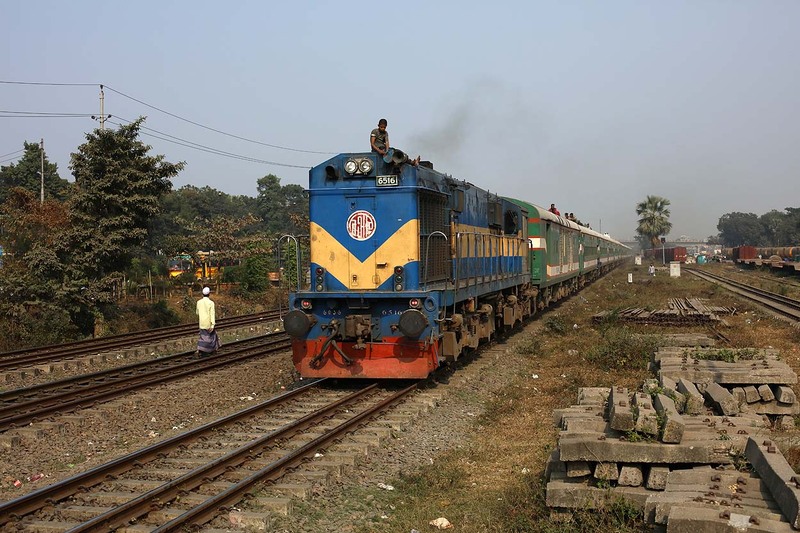 Bangladesh Railways 2720 departs Bhairab Junction with Intercity train 'Egarosindhur Provati' 738 from Kishoreganj to Dhaka on 15 January 2019. 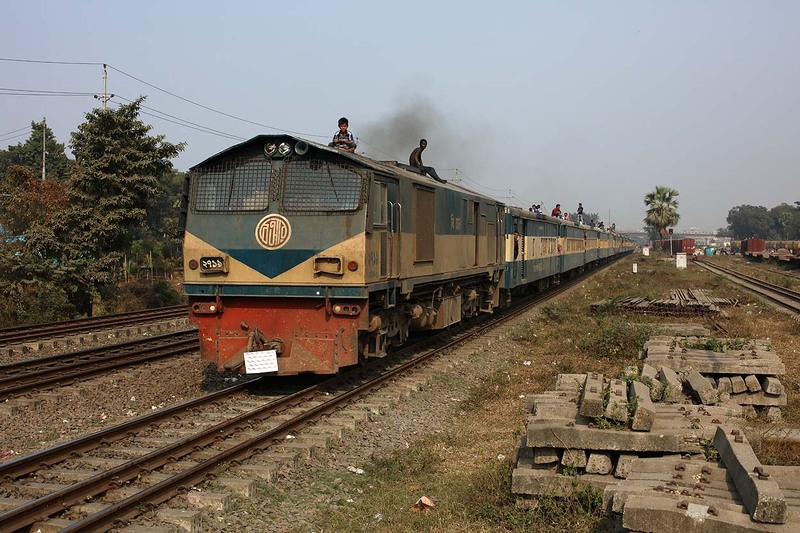 Bangladesh Railways 2312 departs Kishoreganj with Intercity train 'Egarosindhur Goduli' 750 from Kishoreganj to Dhaka on 15 January 2019. 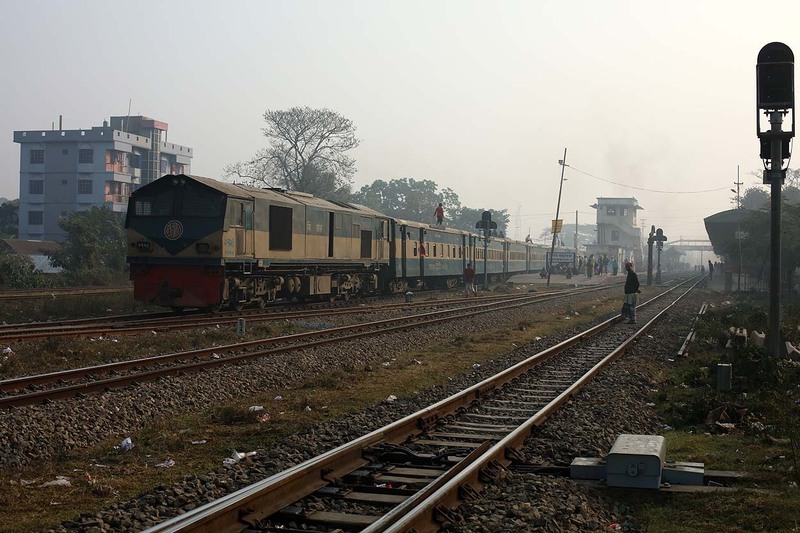 Bangladesh Railways 2401 arrives at Kishoreganj with Intercity train 'Bijoy Express' 785 from Mymensingh to Chittagong on 15 January 2019. 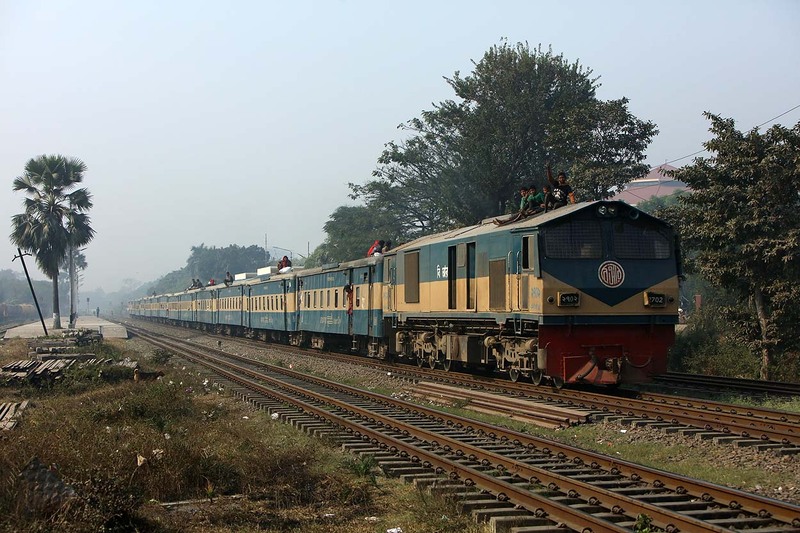 Bangladesh Railways 2401 departs Kishoreganj with Intercity train 'Bijoy Express' 785 from Mymensingh to Chittagong on 15 January 2019. 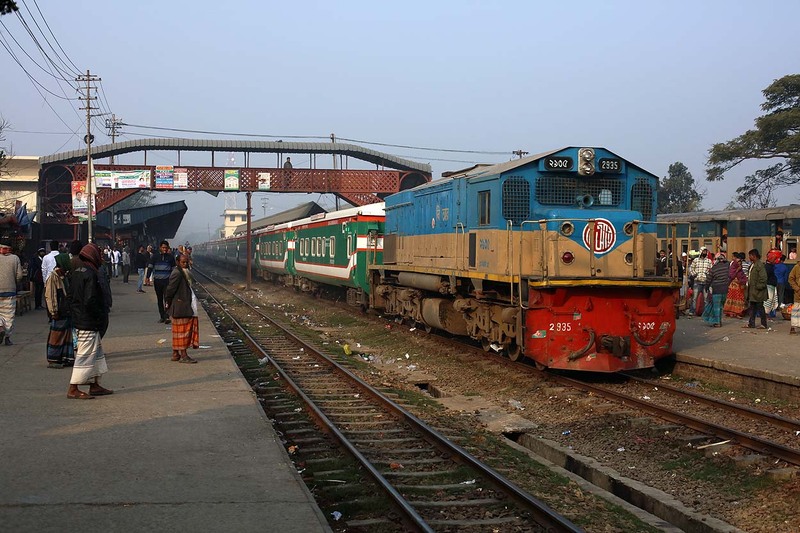 Bangladesh Railways 2932 arrives at Kishoreganj with Intercity train 'Kishorgonj Express' 781 from Dhaka to Kishoreganj on 15 January 2019. 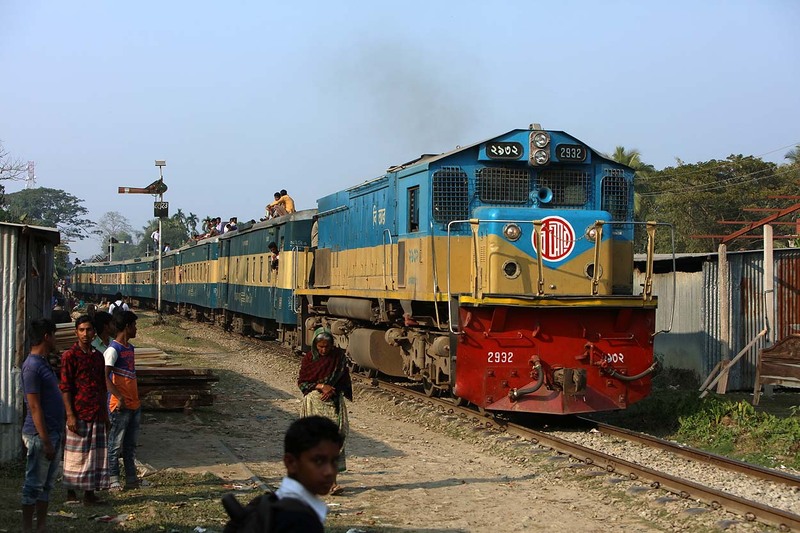 Bangladesh Railways 2932 departs Kishoreganj with Intercity train 'Kishorgonj Express' 782 from Kishoreganj to Dhaka on 15 January 2019. 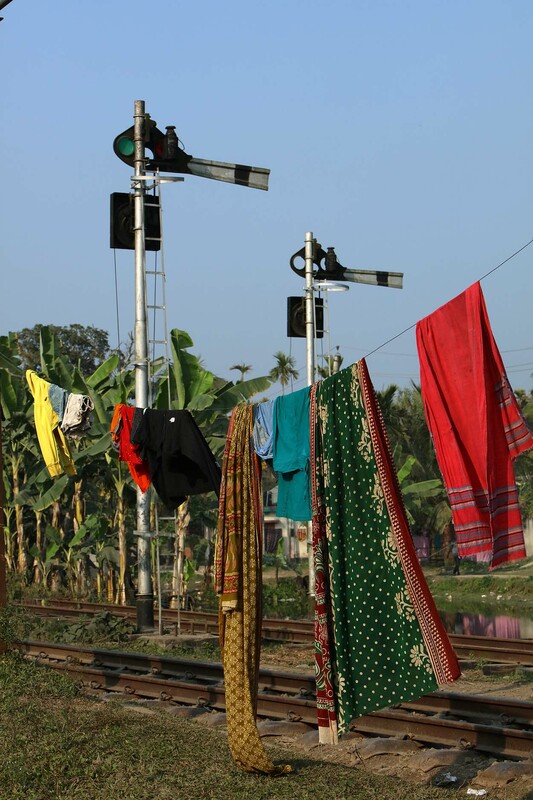 Drying laundry at Kishoreganj on 15 January 2019. 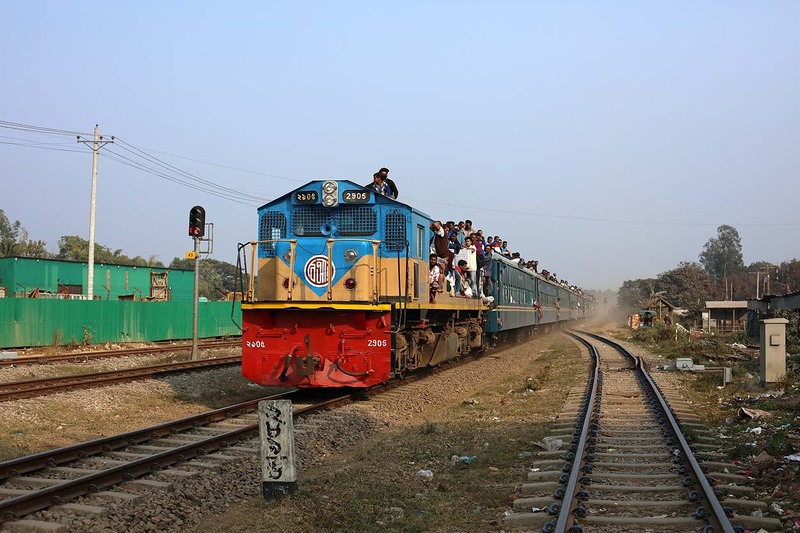 Bangladesh Railways 2518 departs Kishoreganj with 'Isakhan Express' 40 from Kishoreganj to Dhaka on 15 January 2019. 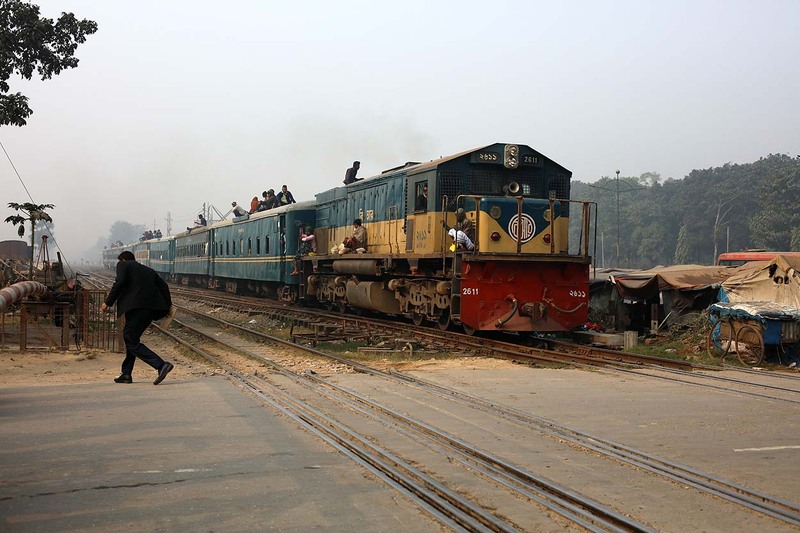 Bangladesh Railways 2506 departs Mymensingh Junction with 'Jamalpur Commuter' 52 from Dewanganj to Dhaka on 16 January 2019. 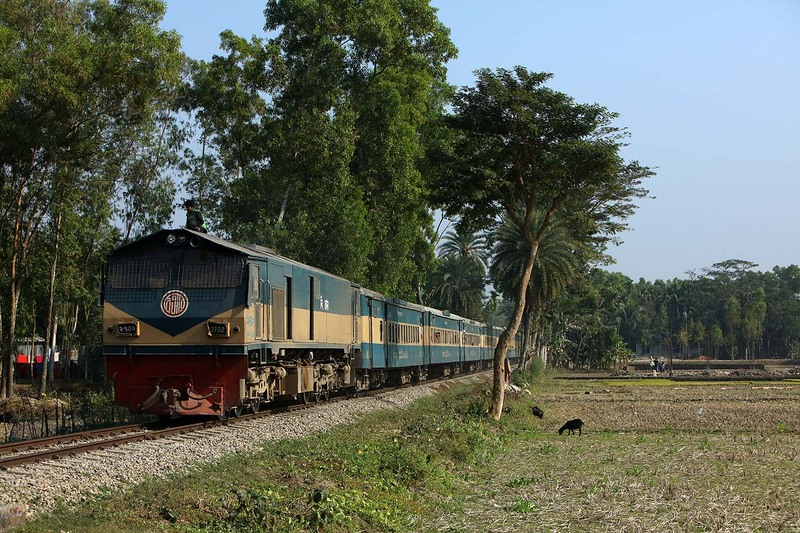 Bangladesh Railways 2718 approaches Mymensingh Junction with Intercity train 'Bharamaputra' 744 from Dewanganj to Dhaka on 16 January 2019. 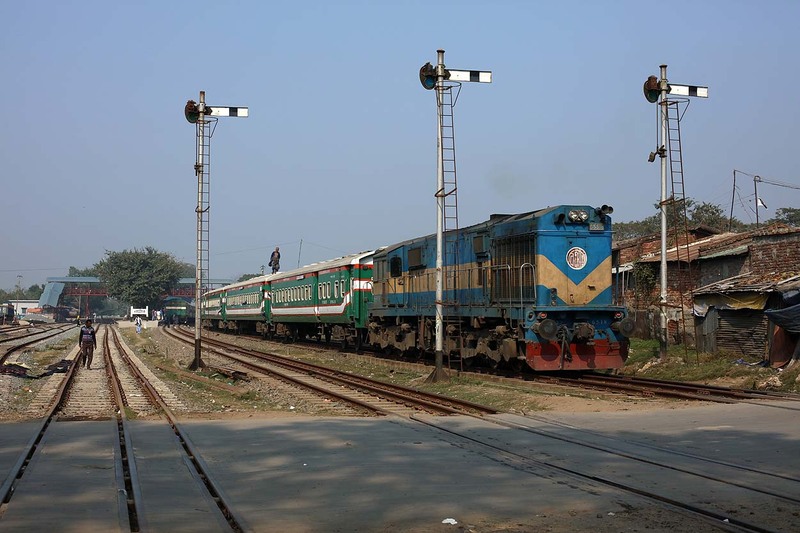 Bangladesh Railways 2718 stops at Mymensingh Junction with Intercity train 'Bharamaputra' 744 from Dewanganj to Dhaka on 16 January 2019. 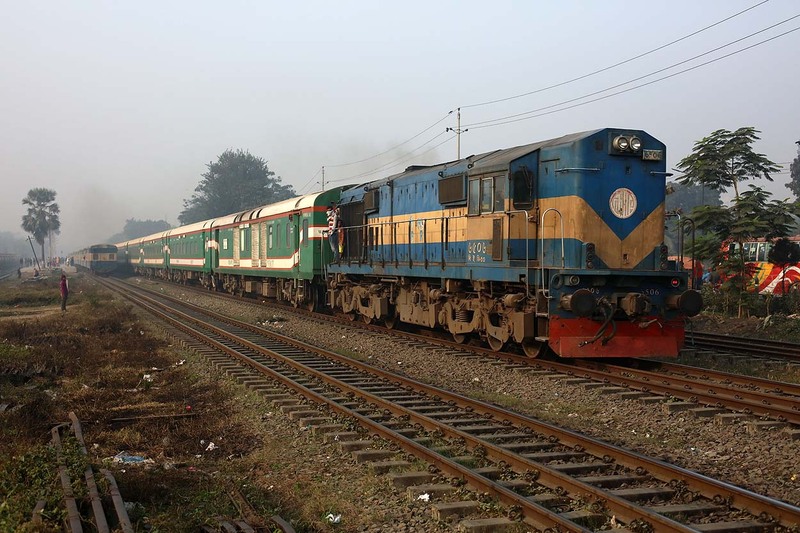 Bangladesh Railways 2718 departs Mymensingh Junction with Intercity train 'Bharamaputra' 744 from Dewanganj to Dhaka on 16 January 2019. 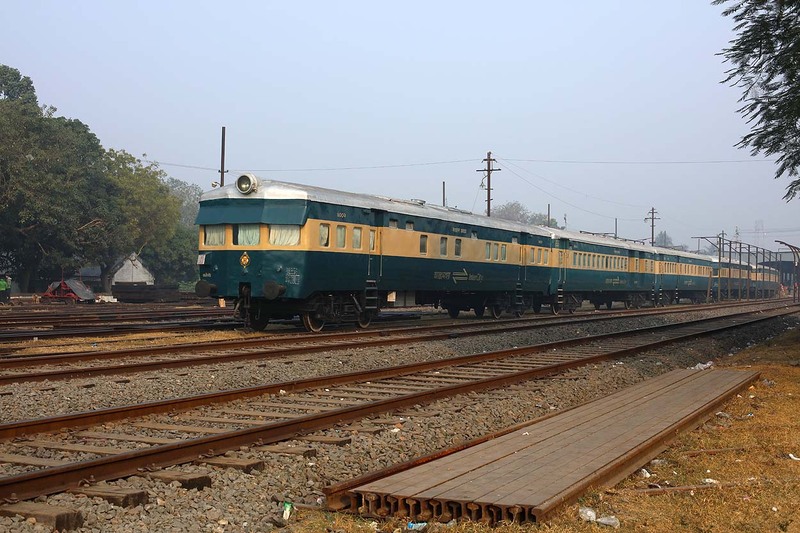 On the left stand DMU 10022 and locomotive 2934. 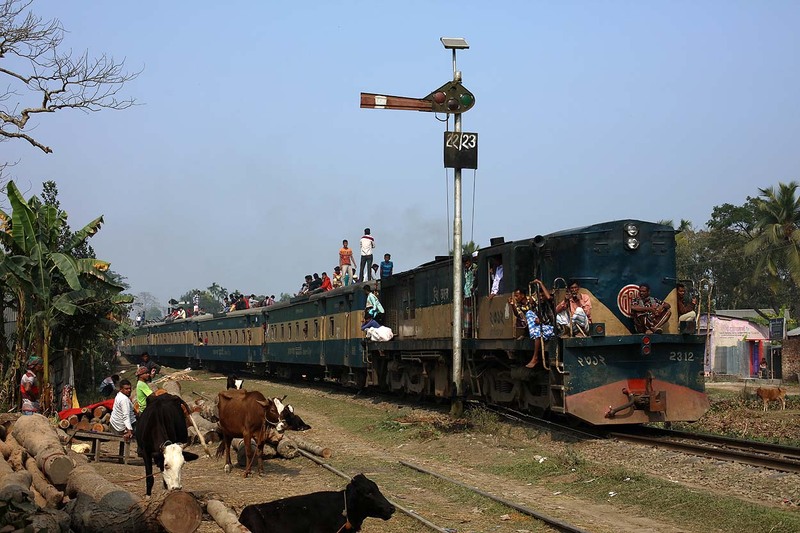 Everything alright on top of Intercity train 'Bharamaputra' 744 from Dewanganj to Dhaka on 16 January 2019. 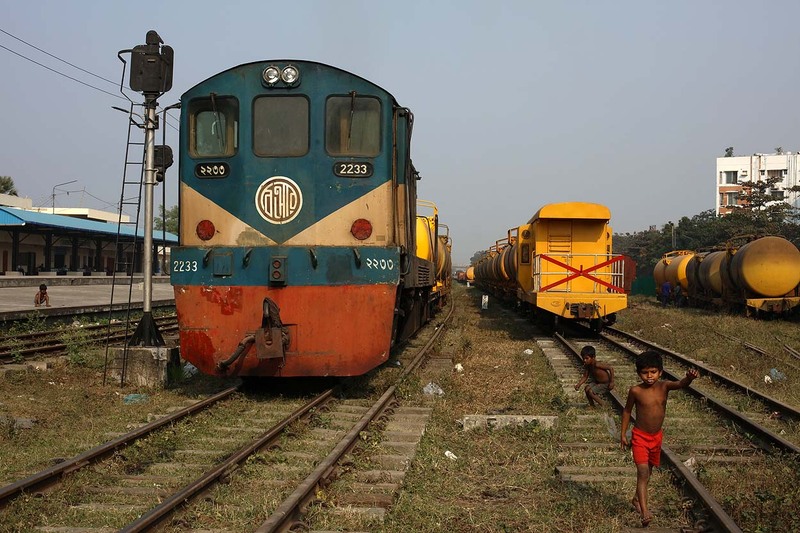 Bangladesh Railways DMU 10022 and Bangladesh Railways locomotive 2934 await duties at Mymensingh Junction on 16 January 2019. 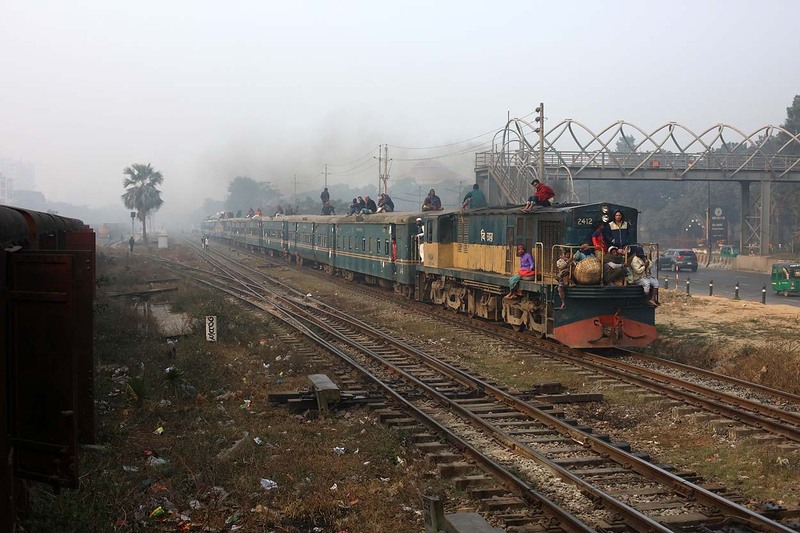 Bangladesh Railways 2403 departs Mymensingh Junction with 'Mymensingh' 92 from Mymensingh Junction to Joydebpur Junction on 16 January 2019. 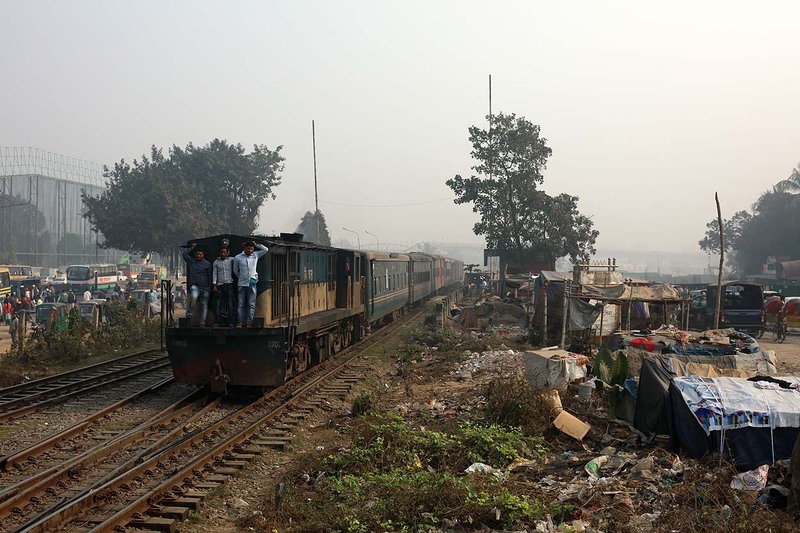 Bangladesh Railways 2934 approaches Mymensingh depot with a bagage coach and a van from Mymensingh Junction on 16 January 2019. 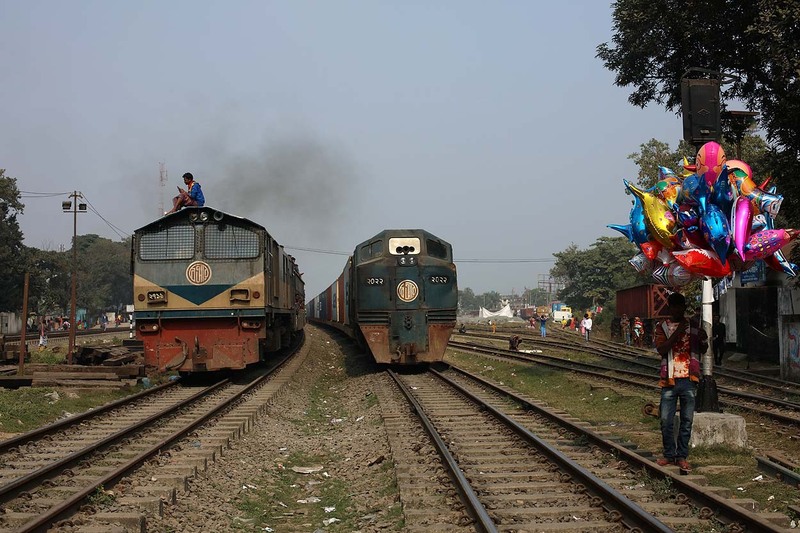 Bangladesh Railways 2512 crosses the railway lines from Mymensingh Junction to Dhaka (left) and Mymensingh depot (right) with a passenger train from Gouripur to Mymensingh Junction at Mymensingh on 16 January 2019. 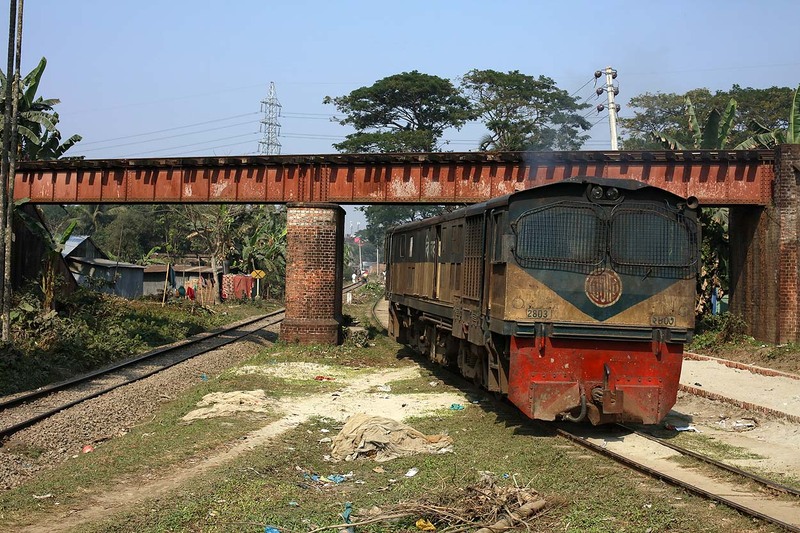 Bangladesh Railways 2803 is on its way from Mymensingh depot to Mymensingh Junction and dives under the railway line from Gouripur to Mymensingh Junction at Mymensingh on 16 January 2019. 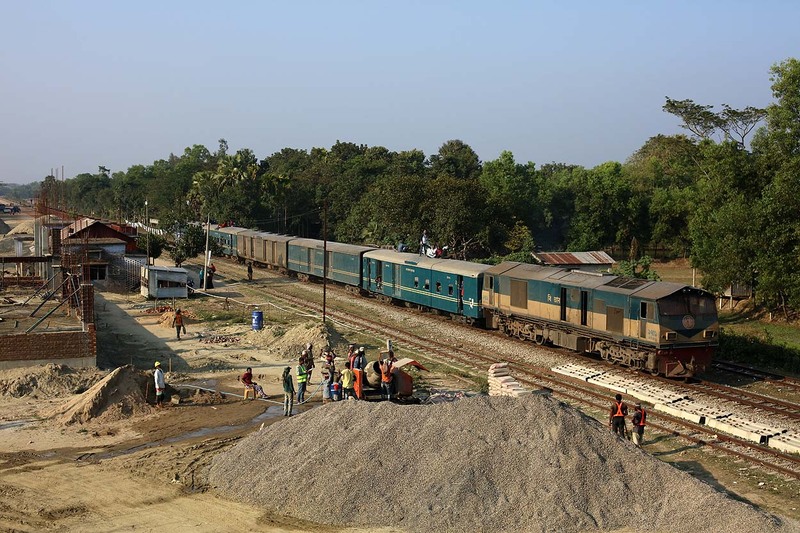 Bangladesh Railways 2613 approaches the bridge with the railway line from Gouripur to Mymensingh Junction with Intercity train 'Haor Express' 778 from Mohangonj to Dhaka at Mymensingh on 16 January 2019. 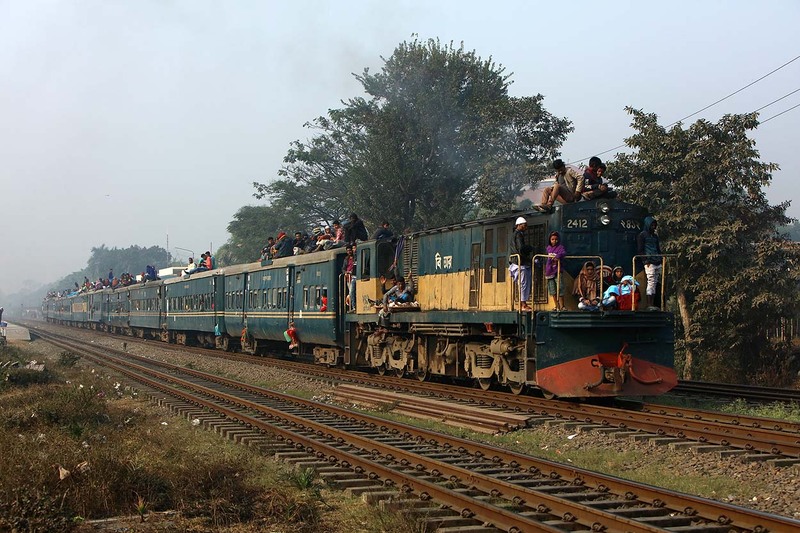 Bangladesh Railways 2512 with a local passenger train from Mymensingh Junction to Gouripur at Mymensingh on 16 January 2019. 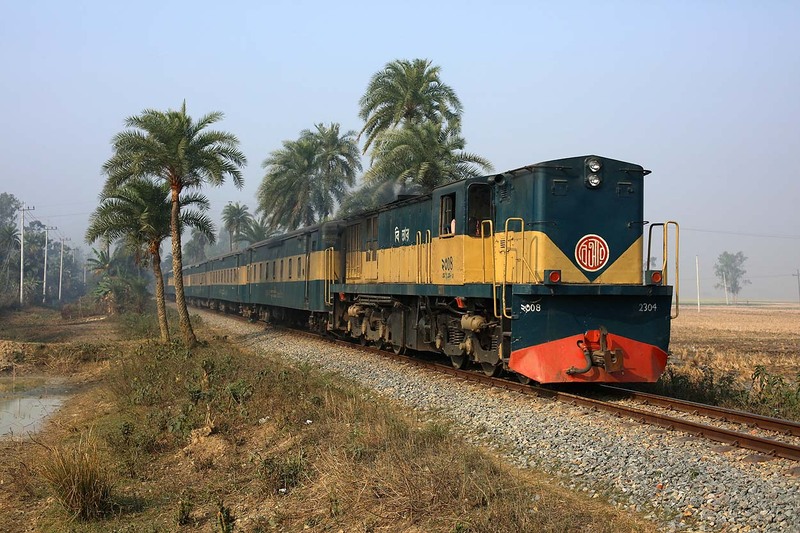 Bangladesh Railways 2803 with 'Isakhan Express' 40 from Mymensingh Junction to Dhaka (via the long route) at Mymensingh on 16 January 2019. 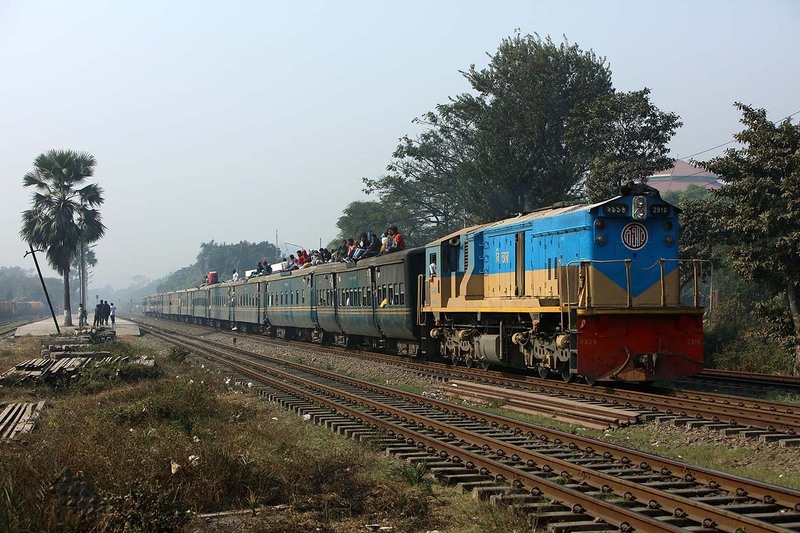 Bangladesh Railways 2702 with Intercity train 'Agnibina Express' 735 from Dhaka to Tarakandi at Kismot on 16 January 2019. 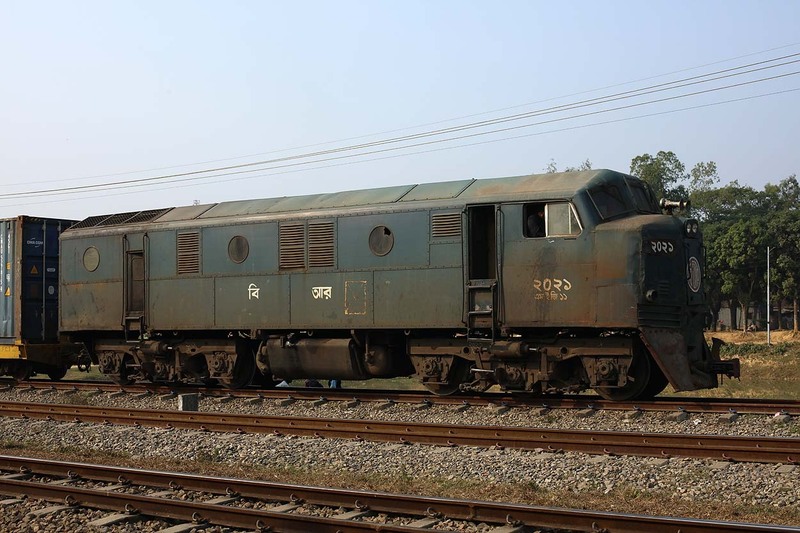 An unknown Bangladesh Railways Class 2700 locomotive with 'Dholesssory Express' 75 from Mymensingh Juntion to Bangabandhu Setu East at Bhuapur on 16 January 2019. 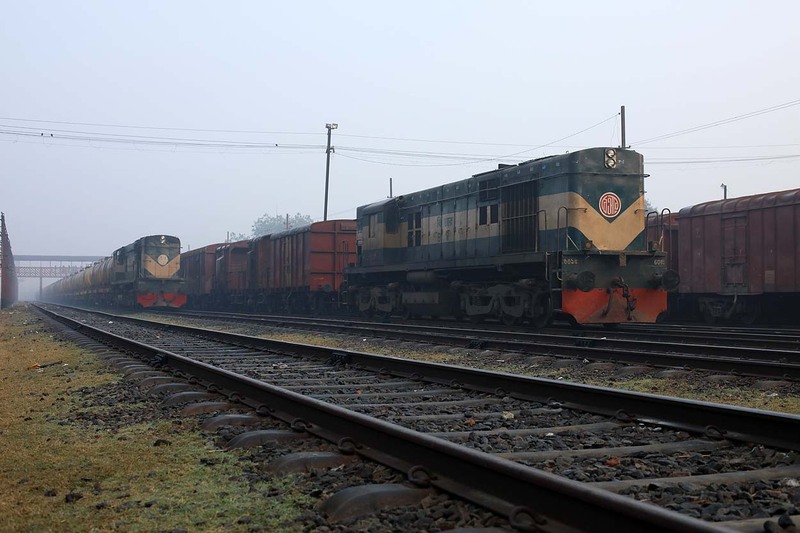 Bangladesh Railways 2306 arrives at Bogra with 'Padmarag Express' 21 from Santahar to Lalmonirhat on 17 January 2019. 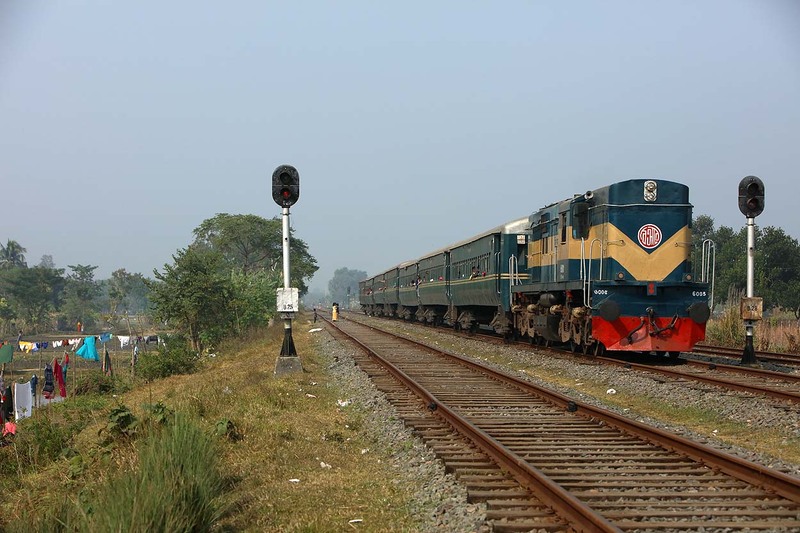 Bangladesh Railways 2306 stops at Bogra with 'Padmarag Express' 21 from Santahar to Lalmonirhat on 17 January 2019. 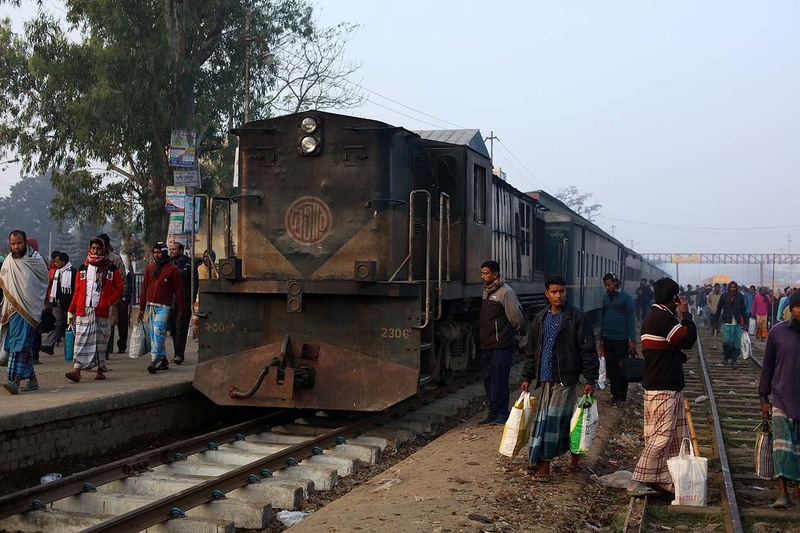 Bangladesh Railways 2306 departs Bogra with 'Padmarag Express' 21 from Santahar to Lalmonirhat on 17 January 2019. 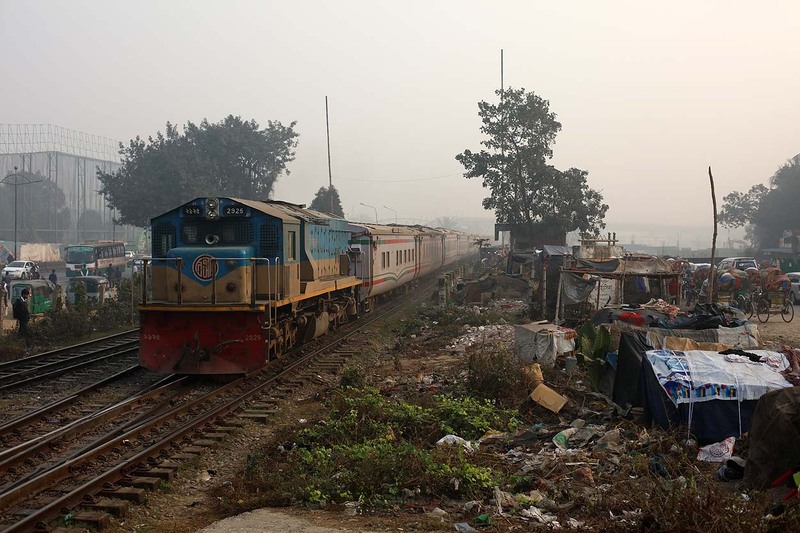 The train drives through a market built up between the tracks. 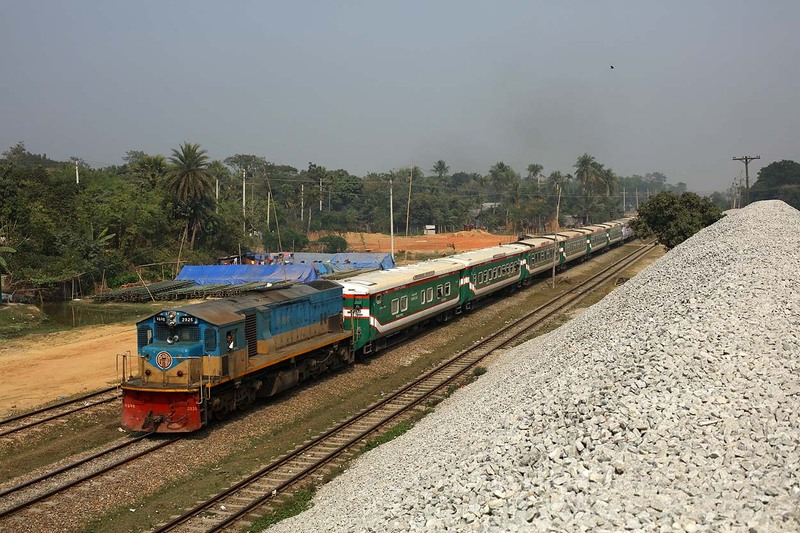 Bangladesh Railways 2304 drives through palm trees at Kahaloo with Intercity train 'Karutoa Express' 713 from Santahar to Burimari on 17 January 2019. 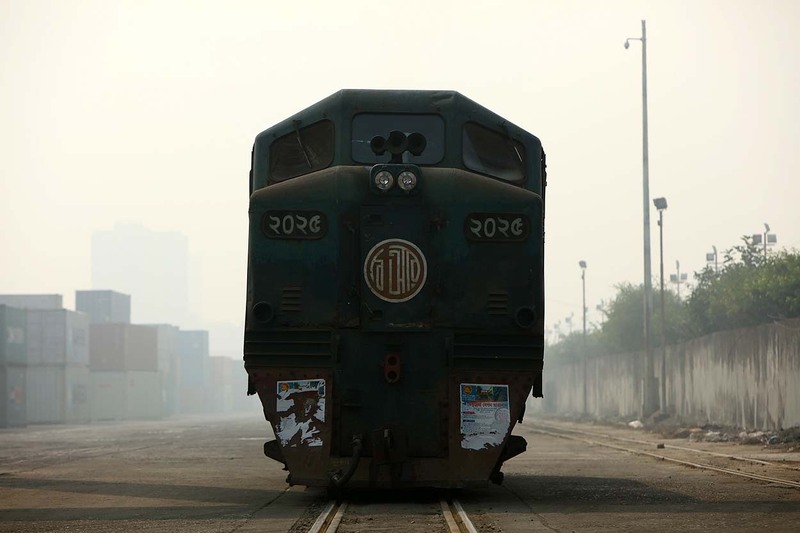 Finally a photo without any other people than the loco driver! However, we had to pursuede some people to get out of the picture. 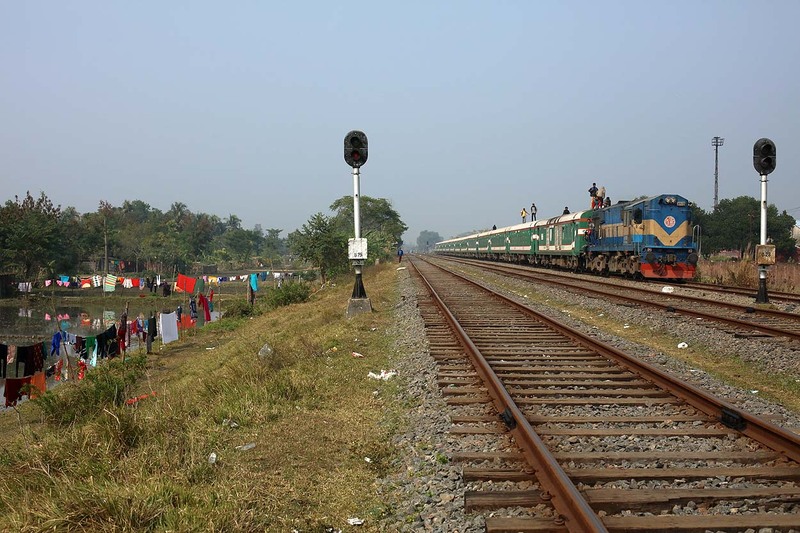 Bangladesh Railways 6518 approaches Natore with Intercity train 'Drutojan Express' 758 from Dinajpur to Dhaka on 17 January 2019. 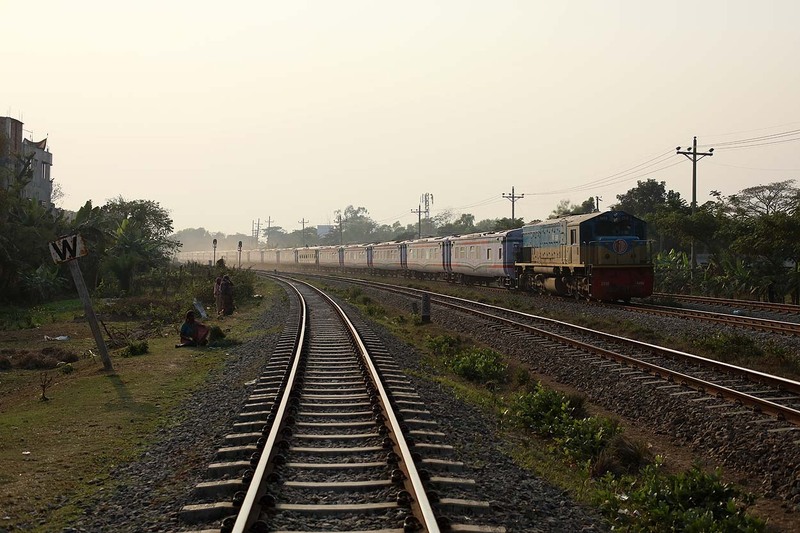 Bangladesh Railways 6518 departs Natore with Intercity train 'Drutojan Express' 758 from Dinajpur to Dhaka on 17 January 2019. 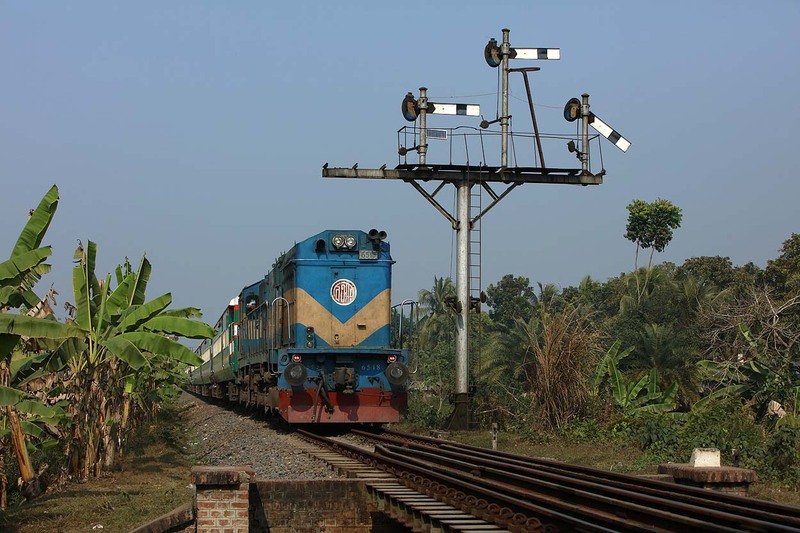 Bangladesh Railways 2930 approaches Natore with Intercity train 'Lalmoni Express' 752 from Lalmonirhat to Dhaka on 17 January 2019. 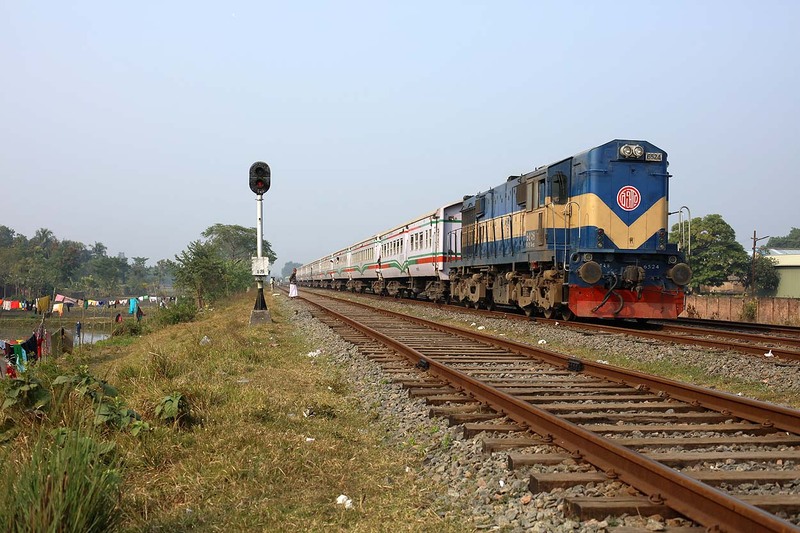 Bangladesh Railways 2930 leaves Natore with Intercity train 'Lalmoni Express' 752 from Lalmonirhat to Dhaka on 17 January 2019. 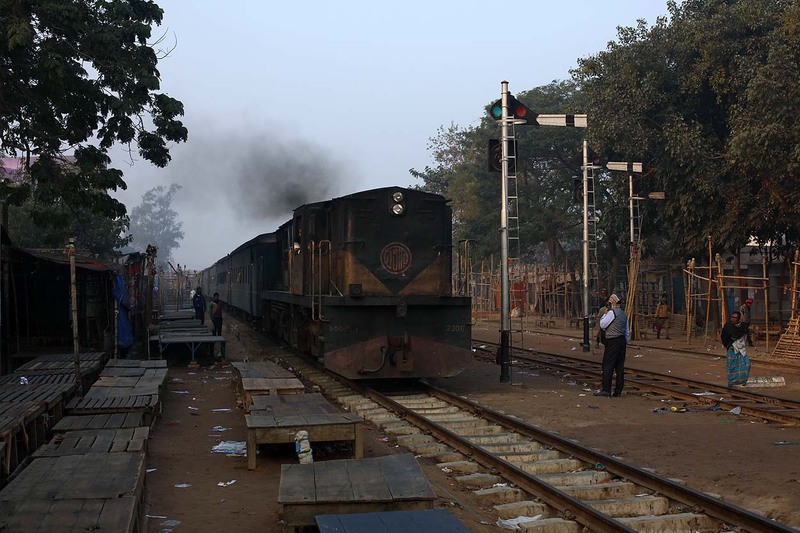 Bangladesh Railways 6409 shunts at Ishwardi Junction on 17 January 2019. 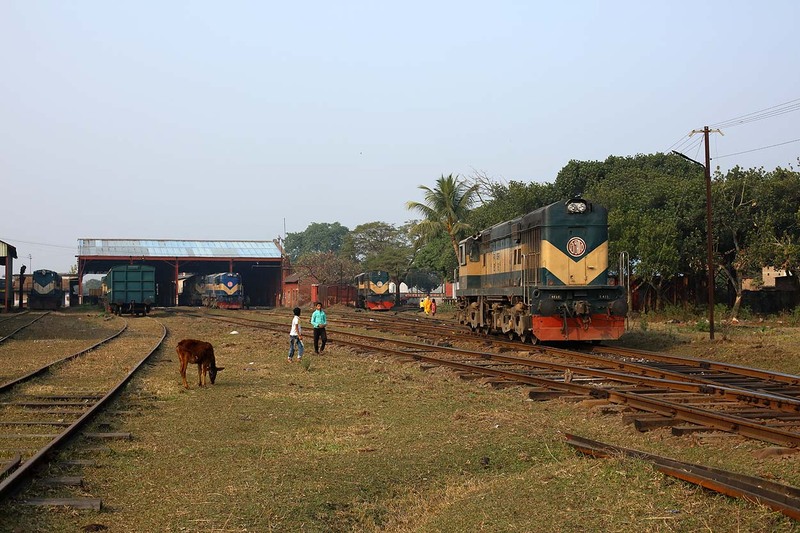 Bangladesh Railways 6000 is ready to depart with tank cars towards Poradah Junction while Bangladesh Railways 6015 stands in the yard at Ishwardi Junction on 18 January 2019. 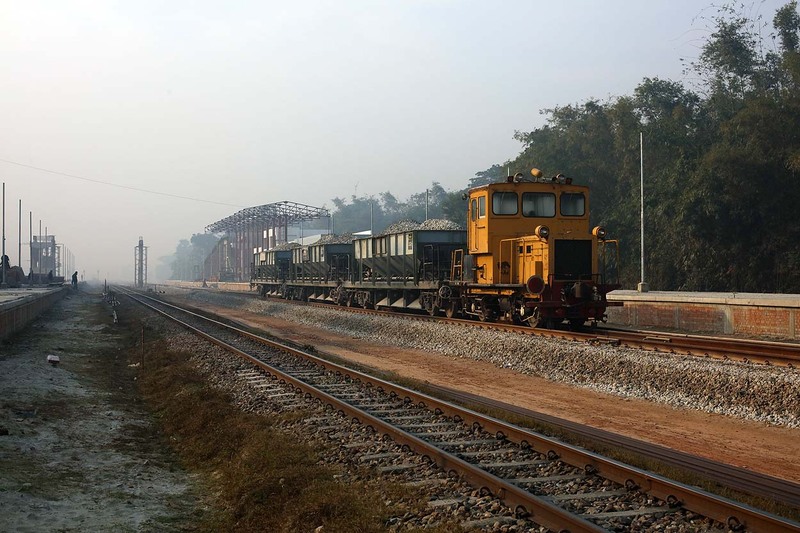 Bangladesh Railways 6000 is ready to depart with tank cars towards Poradah Junction at Ishwardi Junction on 18 January 2019. 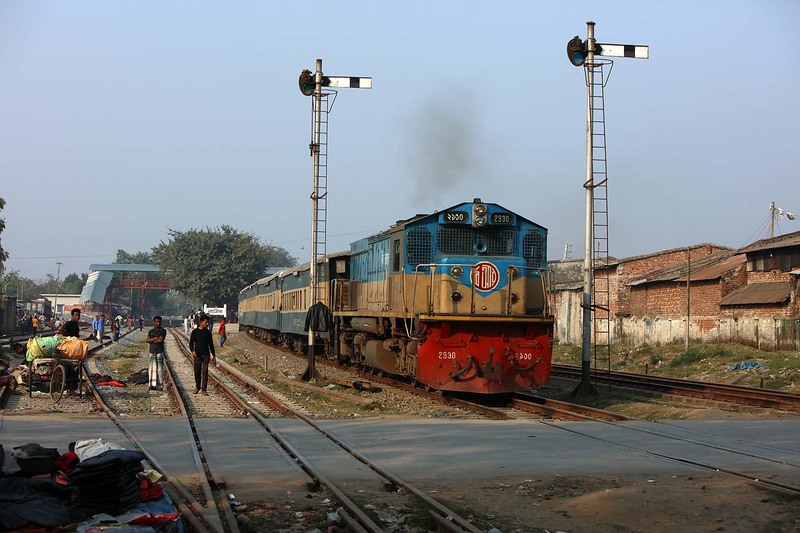 Bangladesh Railways 6504 comes to a halt with Intercity train "Sagardari Express' 762 from Rajshahi to Khulna at Ishwardi Junction on 18 January 2019. 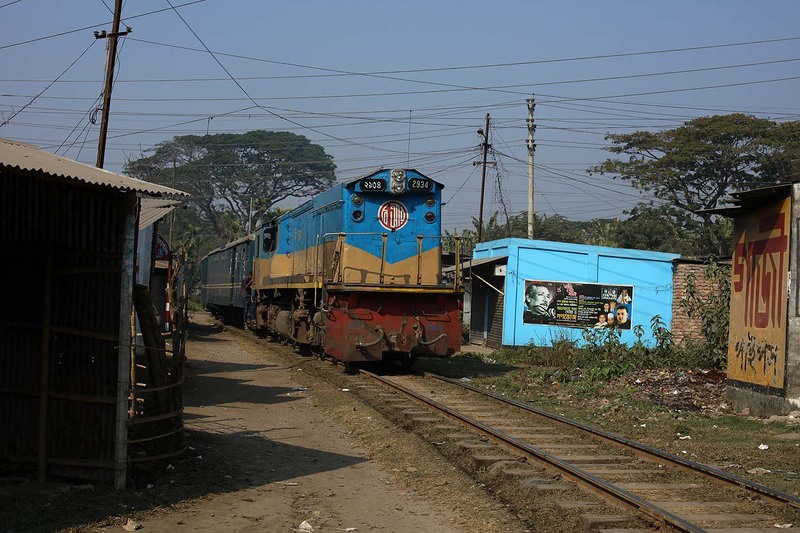 Bangladesh Railways trailer coach 6001 idles at Ishwardi Junction on 18 January 2019. 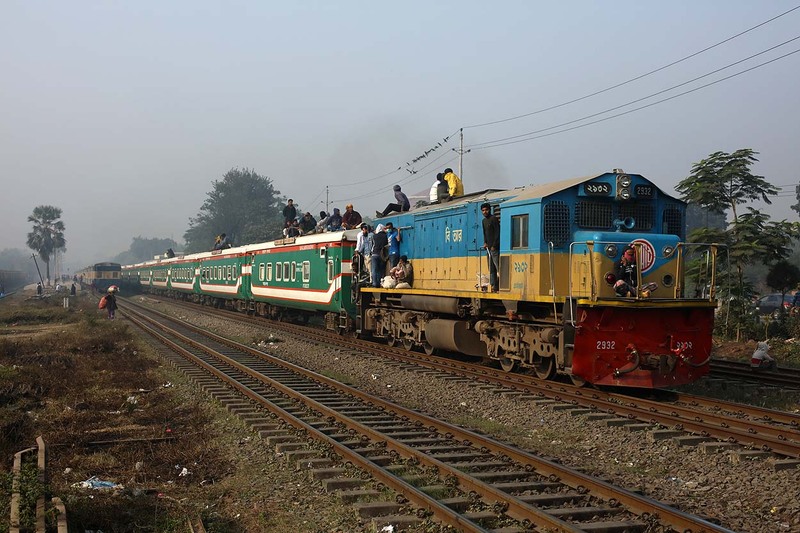 Bangladesh Railways 6504 leaves Ishwardi Junction with Intercity train 'Sagardari Express' 762 from Rajshahi to Khulna on 18 January 2019. 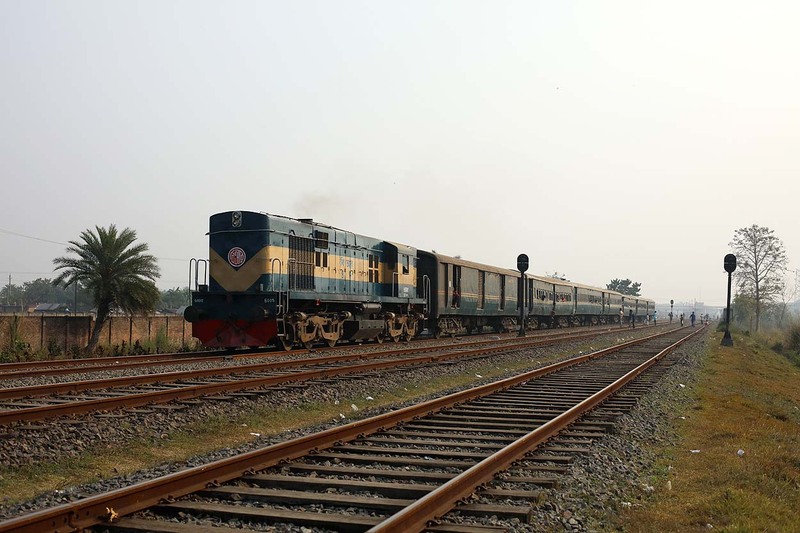 Bangladesh Railways 6109 leaves Ishwardi Junction with Intercity train 'Madhumati Express' 756 from Rajshahi to Goalandaghat on 18 January 2019. 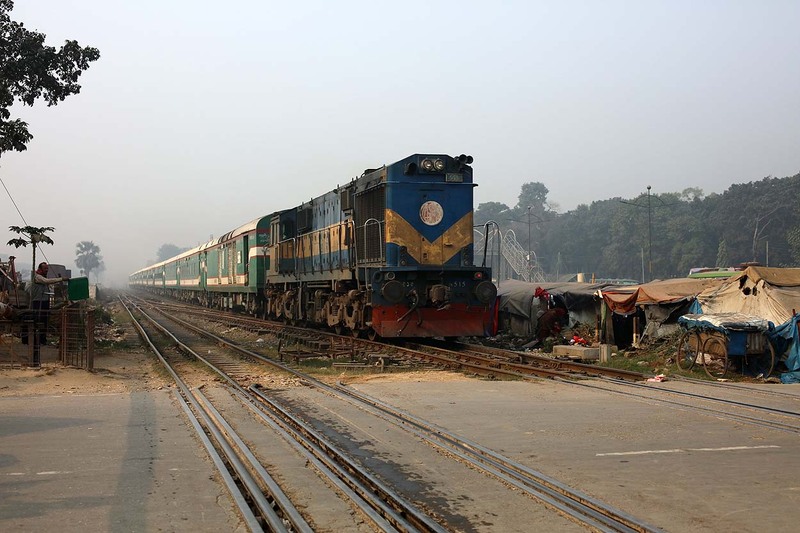 Bangladesh Railways trailer coach 6002 idles with other coaches at Ishwardi Junction on 18 January 2019. 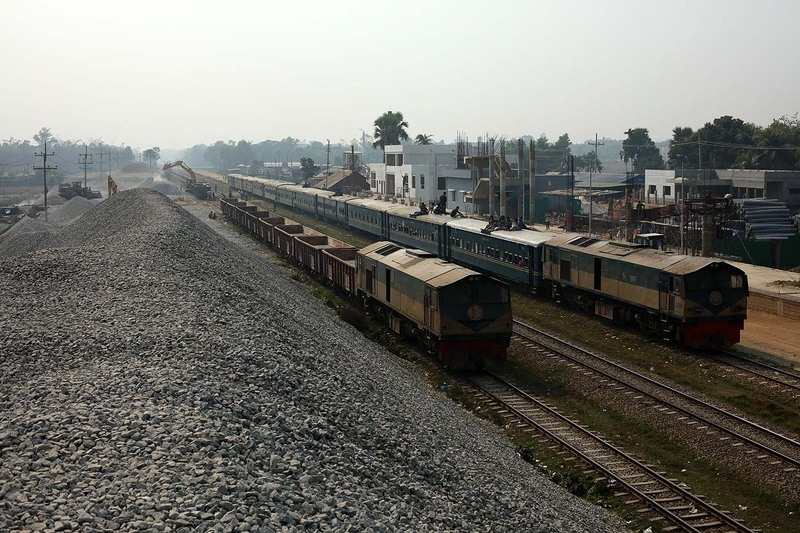 Bangladesh Railways 6000 leaves Ishwardi Junction with tank cars towards Poradah Junction on 18 January 2019. 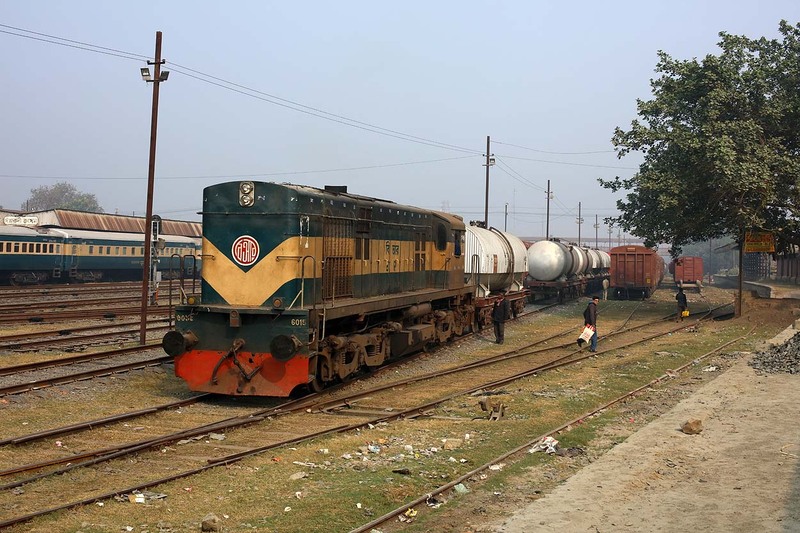 Bangladesh Railways 6015 picks up a tank car at the yard of Ishwardi Junction on 18 January 2019. 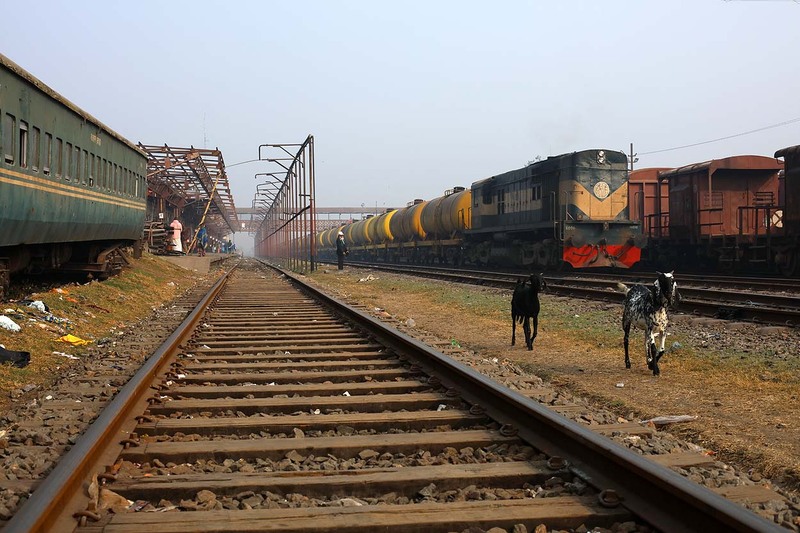 Bangladesh Railways 6015 shunts a tank car at the yard of Ishwardi Junction on 18 January 2019. 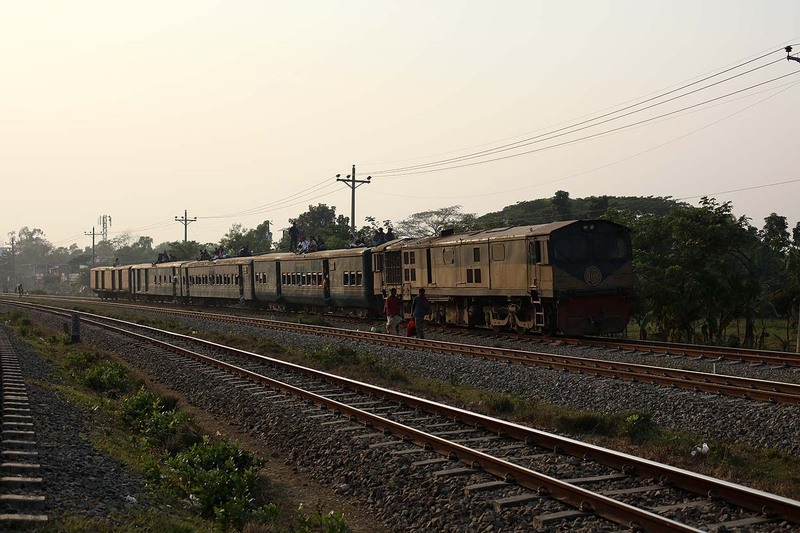 Bangladesh Railways 6008 approaches Ishwardi Junction with 'Mahananda Express' 16 from Chapai Nawabganj to Khulna on 18 January 2019. 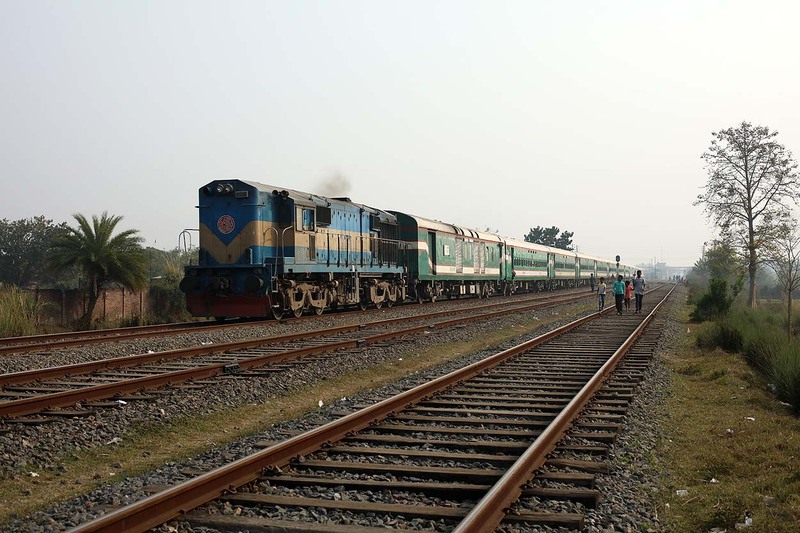 Bangladesh Railways 6503 approaches Ishwardi Junction with Intercity train 'Rupsha Express' 728 from Chilahati to Khulna on 18 January 2019. 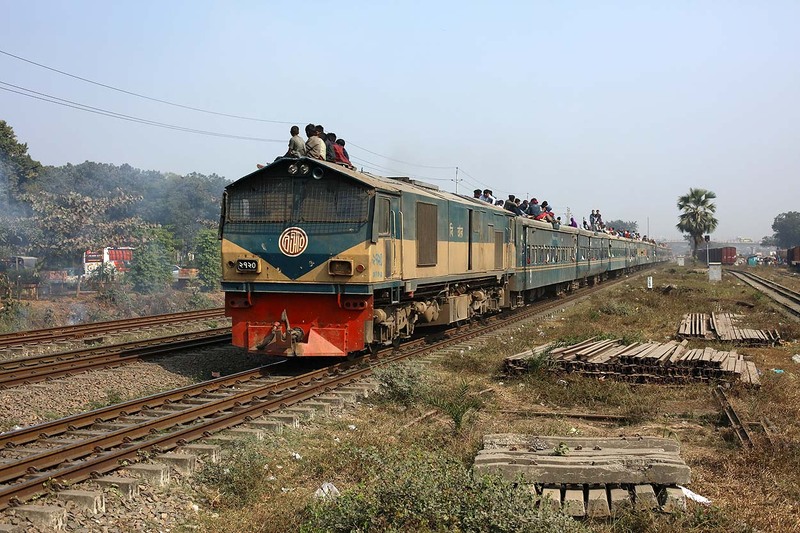 Bangladesh Railways 6005 approaches Ishwardi Junction with 'Rajshahi Express' 6 from Chapai Nawabganj to Sirajganj on 18 January 2019. 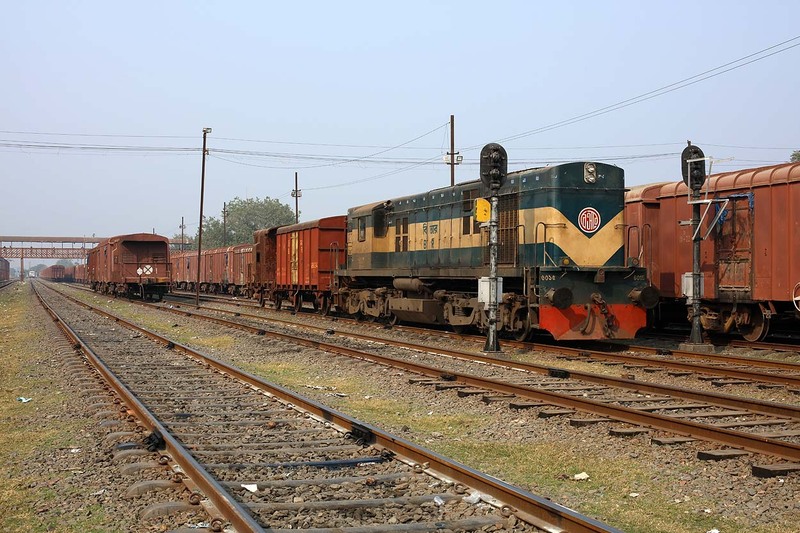 Bangladesh Railways 6015 stands in Ishwardi Junction yard with two wagons on 18 January 2019. 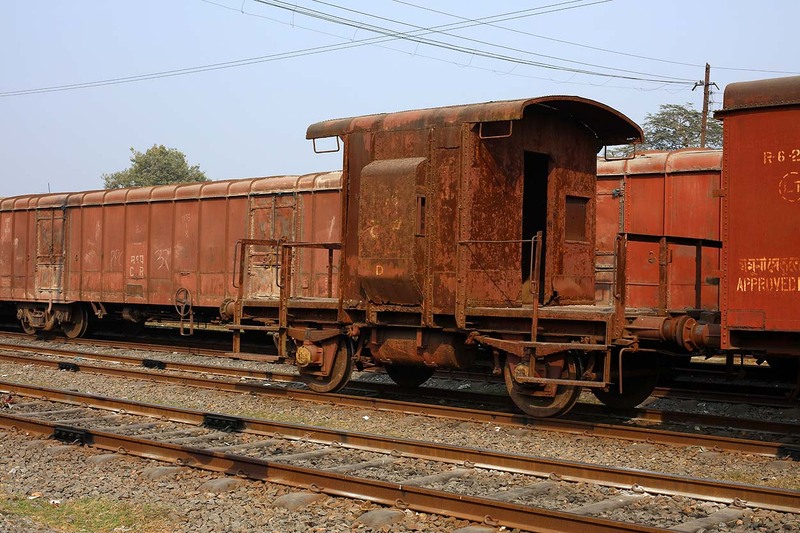 This conductor car seems still to be in service at Ishwardi Junction yard on 18 January 2019. 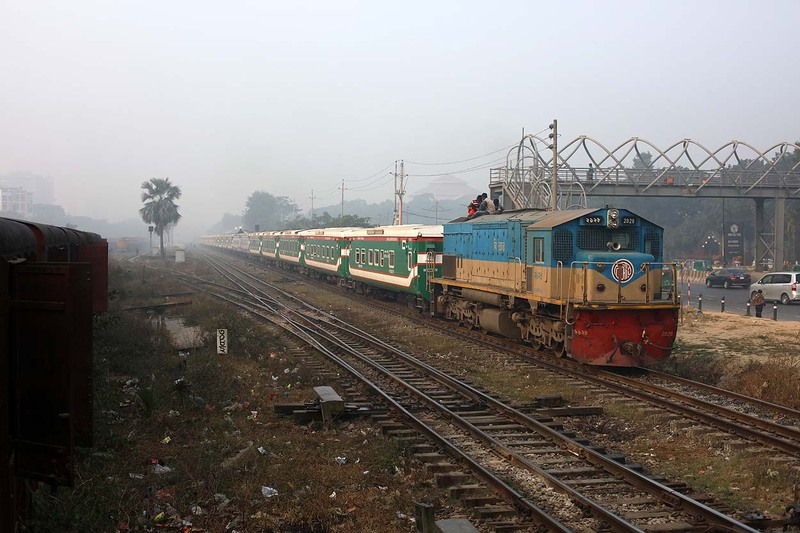 Bangladesh Railways 6501 departs Ishwardi Junction with Intercity train 'Chittra Express' 763 from Khulna to Dhaka on 18 January 2019. 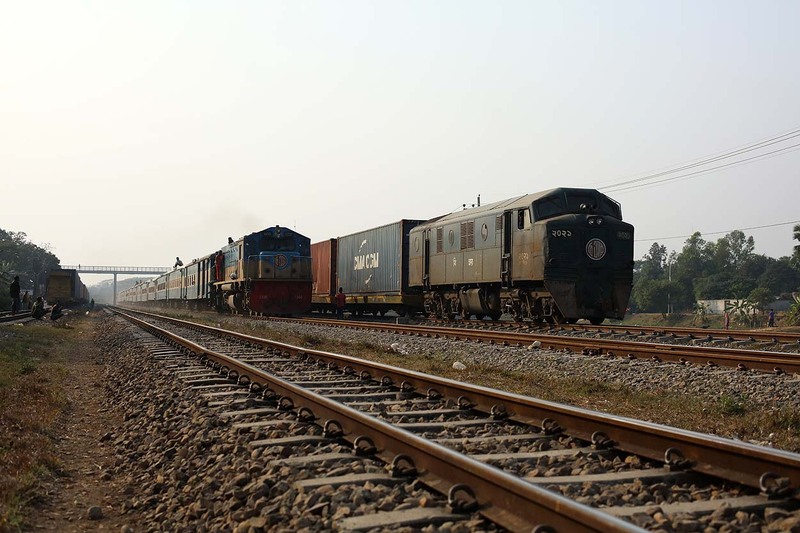 Bangladesh Railways 6524 approaches Ishwardi Junction with Intercity train 'Kapotaskh Express' 716 from Rajshahi to Khulna on 18 January 2019. 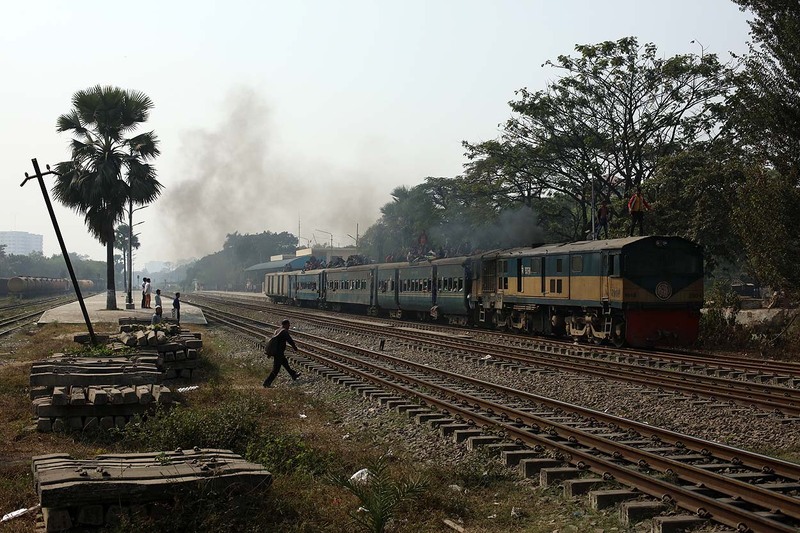 Bangladesh Railways 6005 leaves Ishwardi Junction with 'Rajshahi Express' 6 from Chapai Nawabganj to Sirajganj on 18 January 2019. 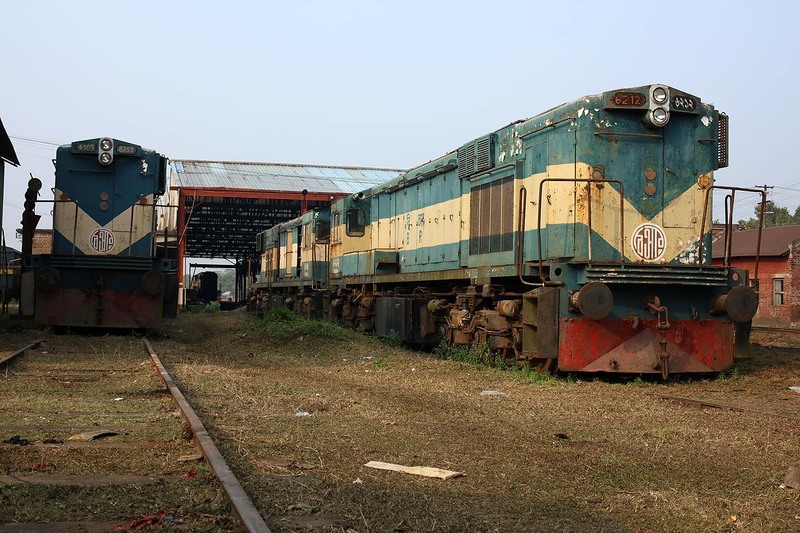 Stored Bangladesh Railways locomotives 6212 + 6206 (right) and 6207 (left) at Ishwardi Junction depot on 18 January 2019. 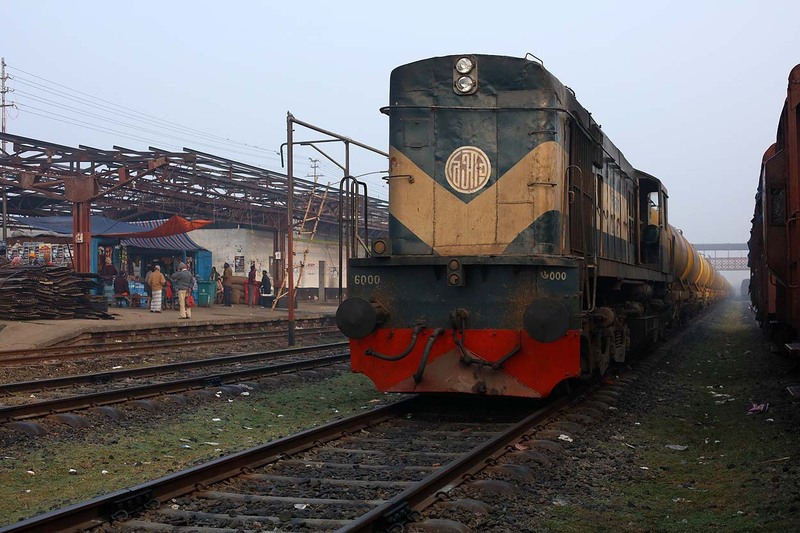 Bangladesh Railways 6016 gets attention at Ishwardi Junction depot on 18 January 2019. 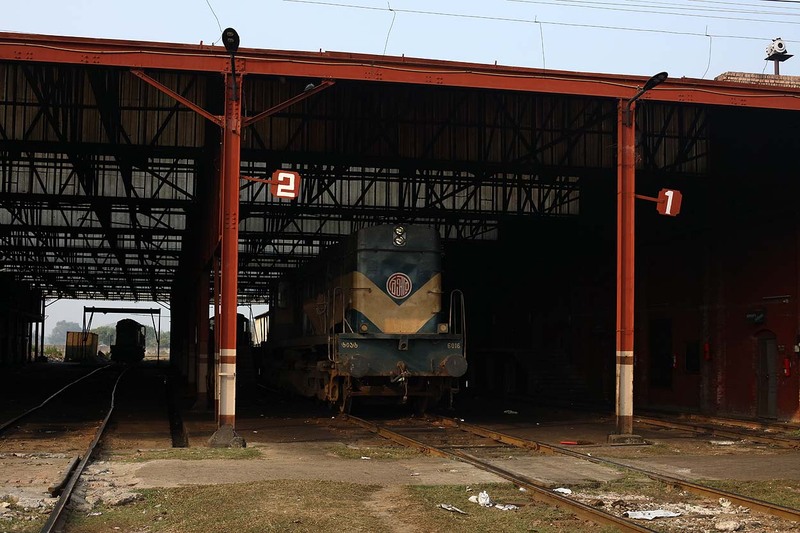 Five different locomotive classes at Ishwardi Junction depot on 18 January 2019. 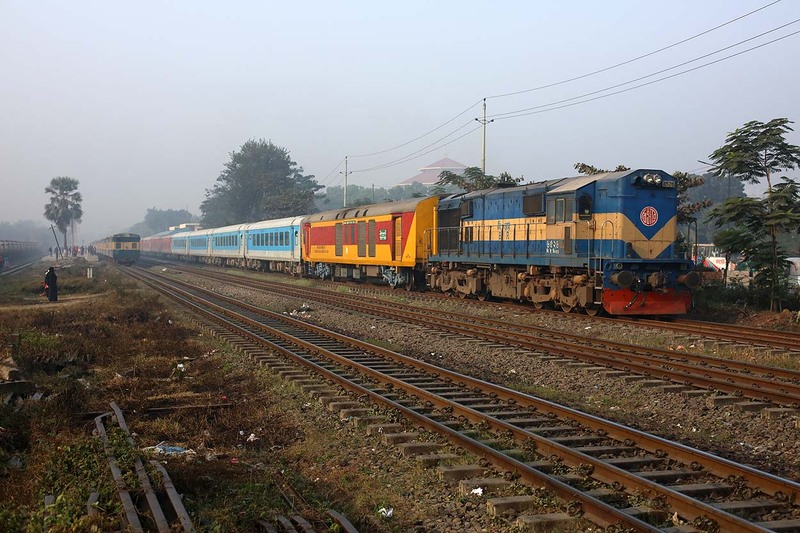 From right lo left 6413, 6115, 6524, 6016 and BR 6207. 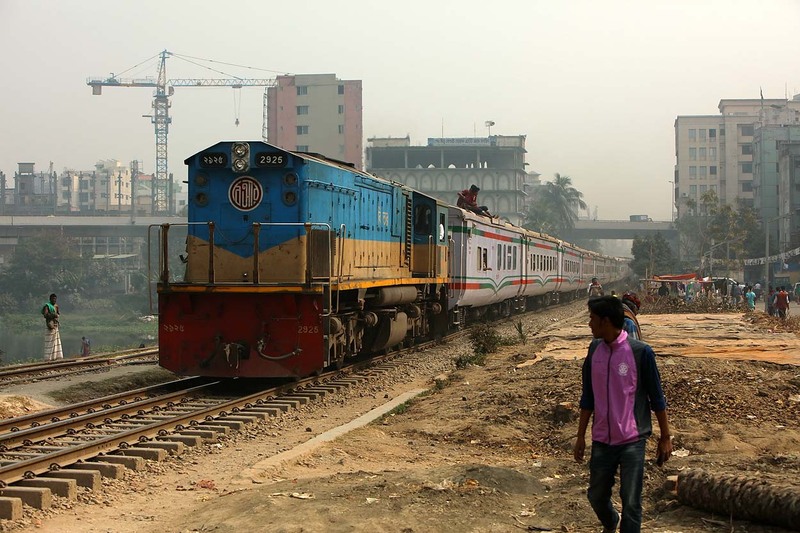 Bangladesh Railways 6520 departs Dhaka Cantonment with international Intercity train 'Moitree Express' 3110 (Dhaka Cantonment, BD - Kolkata, IN) on 19 January 2019. 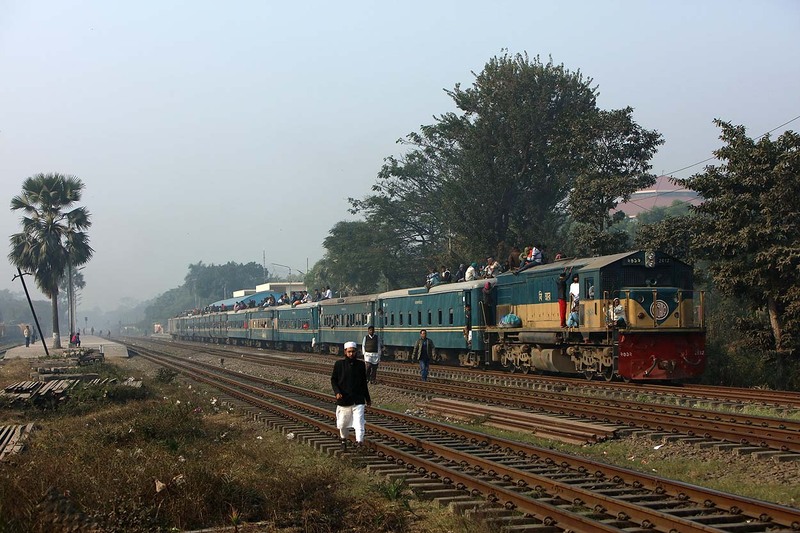 Bangladesh Railways 2925 approaches Dhaka Cantonment with Intercity train 'Jamuna Express' 746 from Tarakandi to Dhaka on 19 January 2019. 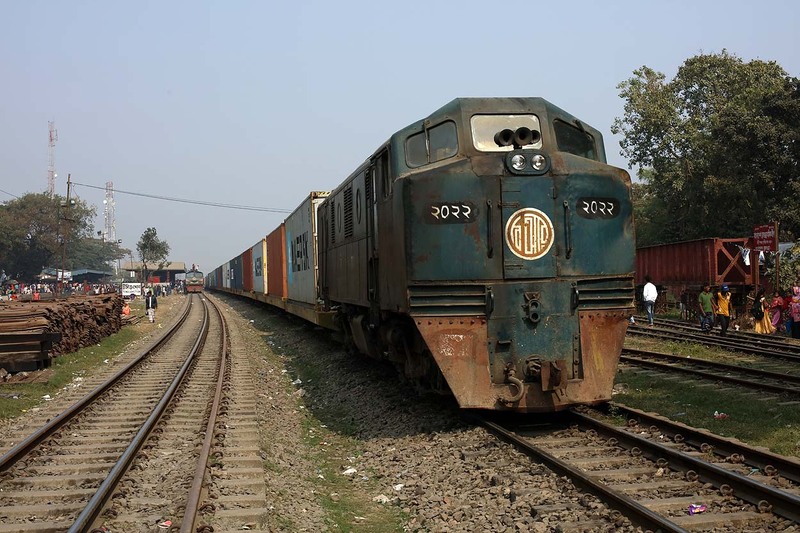 Bangladesh Railways 2928 runs through Dhaka Cantonment with Intercity train 'Mohanagar Provati' 704 from Dhaka to Chittagong on 19 January 2019. 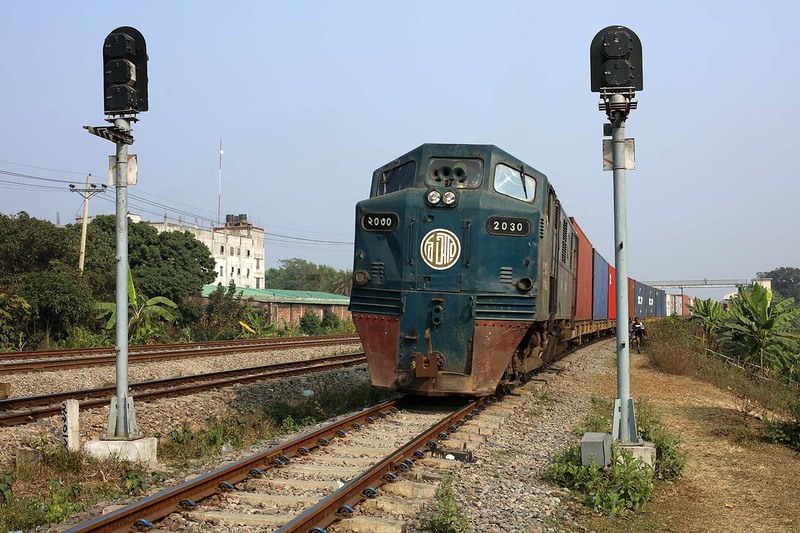 Bangladesh Railways 2403 approaches Dhaka Cantonment with 'Titas Commuter' 33 from Brahmanbaria to Dhaka on 19 January 2019. 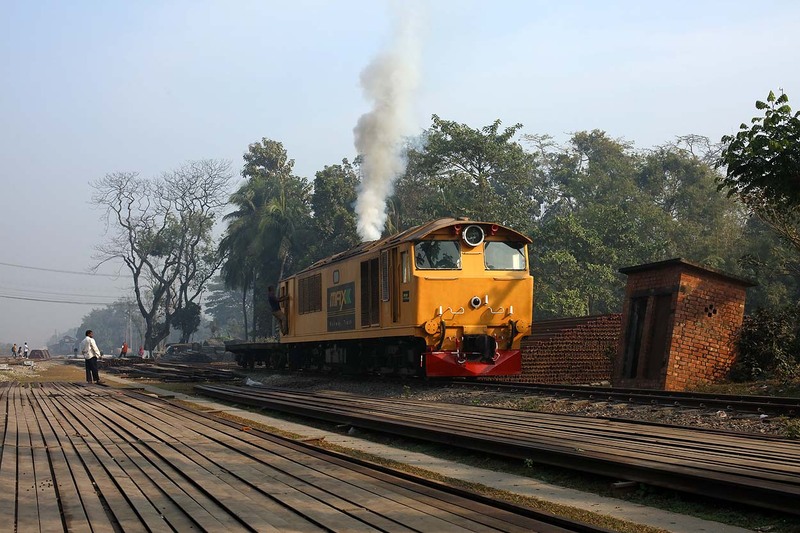 Bangladesh Railways 2412 runs through Dhaka Cantonment with 'Mahua' 43 from Dhaka to Mohangonj on 19 January 2019. 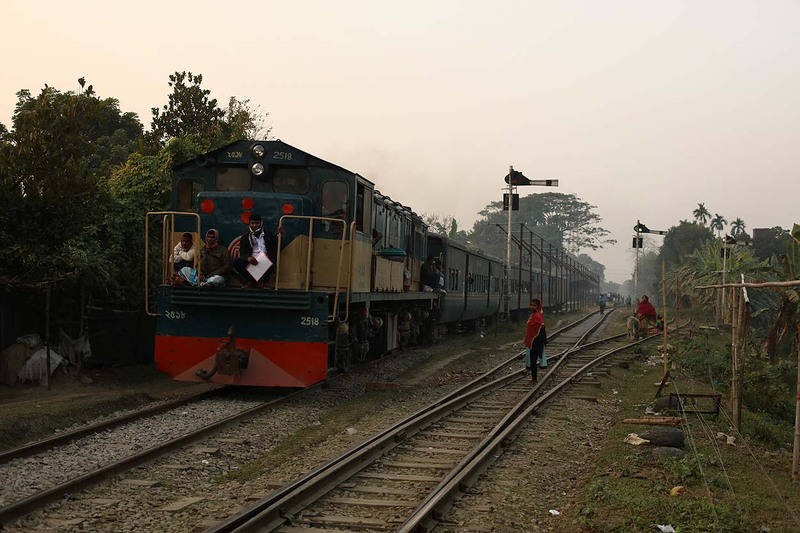 Bangladesh Railways 2612 approaches Dhaka Cantonment with 'Surma Mail' 10 from Sylhet to Dhaka on 19 January 2019. 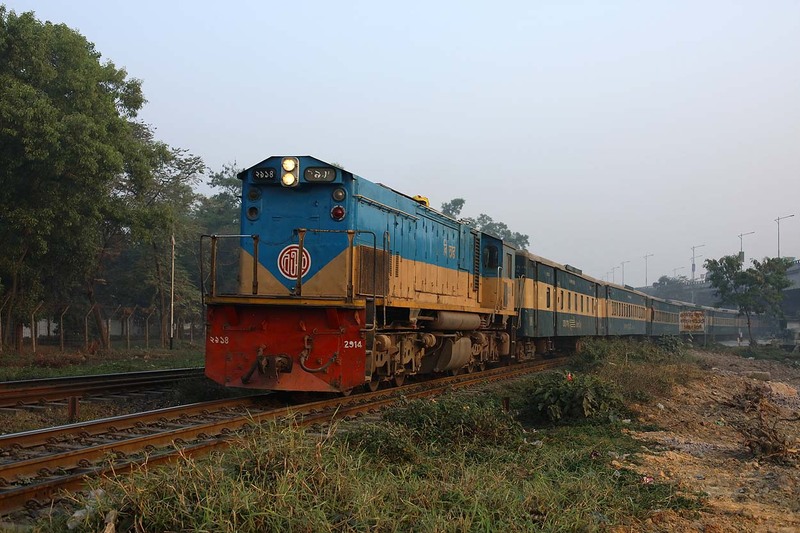 Bangladesh Railways 2611 leaves Dhaka Cantonment with 'Karnaphuli Express' 4 from Dhaka to Chittagong on 19 January 2019. 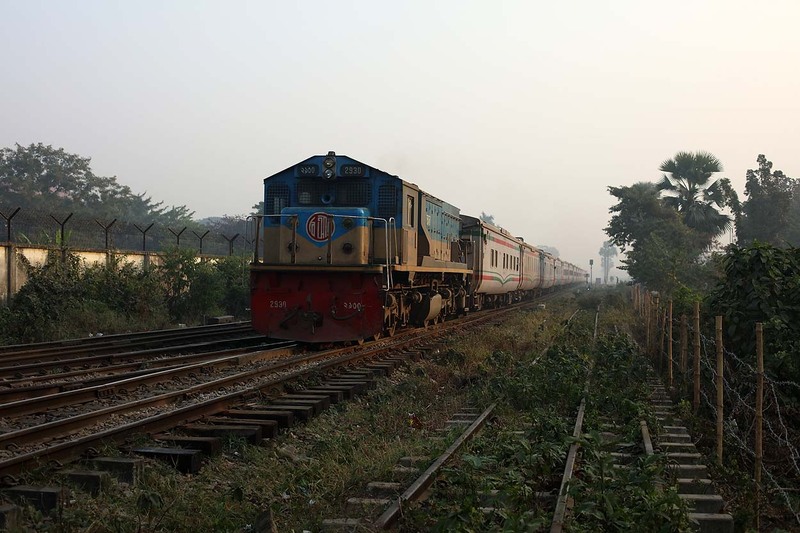 Bangladesh Railways 6502 approaches Dhaka Cantonment with Intercity train 'Ekota Express' 706 from Dinajpur to Dhaka on 19 January 2019. 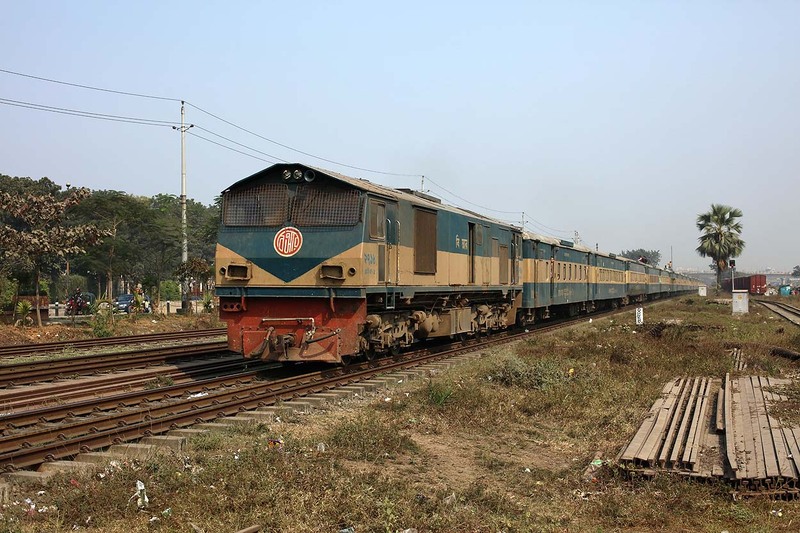 Bangladesh Railways 6515 leaves Dhaka Cantonment with 'Nilsagar' 765 from Dhaka to Chilahati on 19 January 2019. 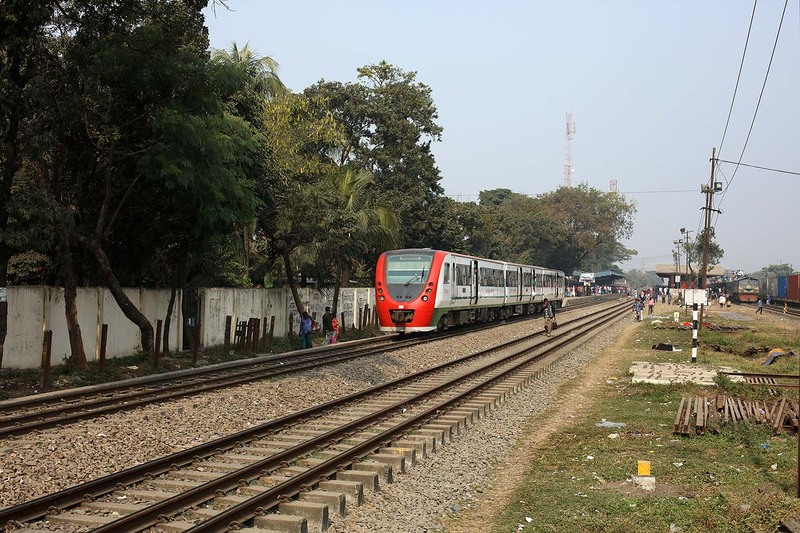 Bangladesh Railways 2301 approaches Dhaka Cantonment with 'Tongi-Commuter' 2 from Tongi Junction to Dhaka on 19 January 2019. 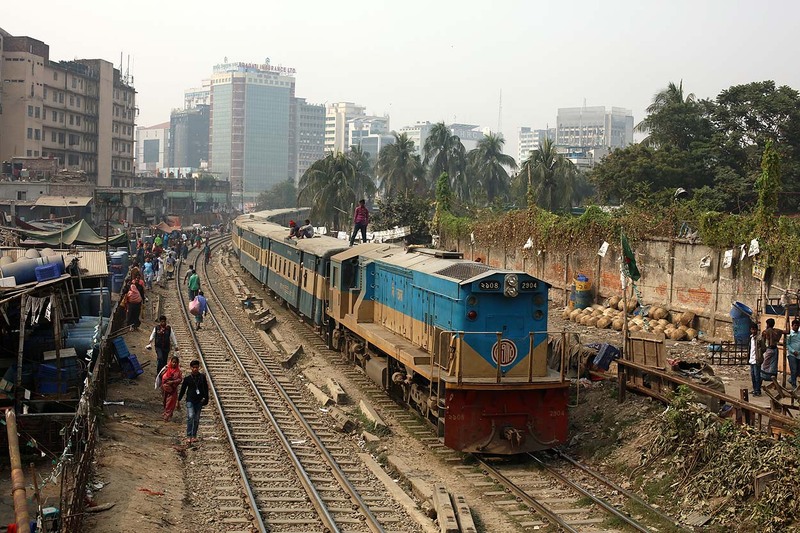 Bangladesh Railways 6516 approaches Dhaka Cantonment with a southbound passenger train to Dhaka on 19 January 2019. 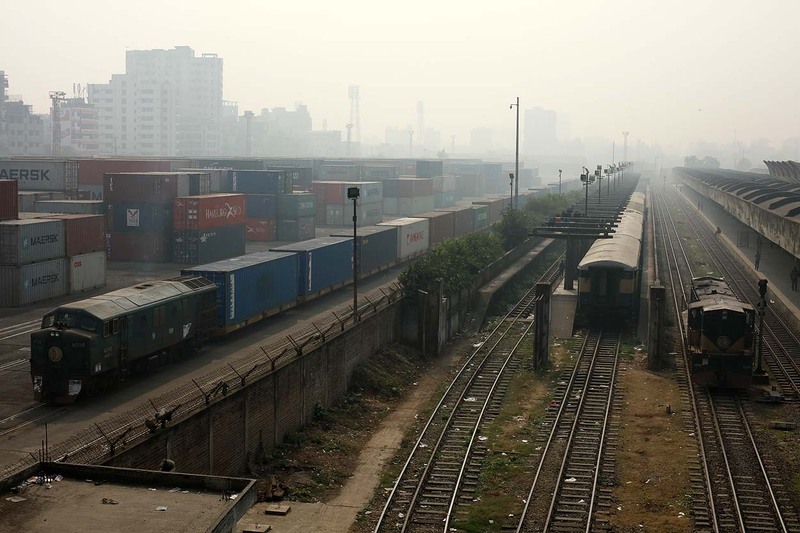 Bangladesh Railways 2025 awaits its departure at Dhaka container terminal (just east of Dhaka main station) with a container train to Chittagong on 19 January 2019. 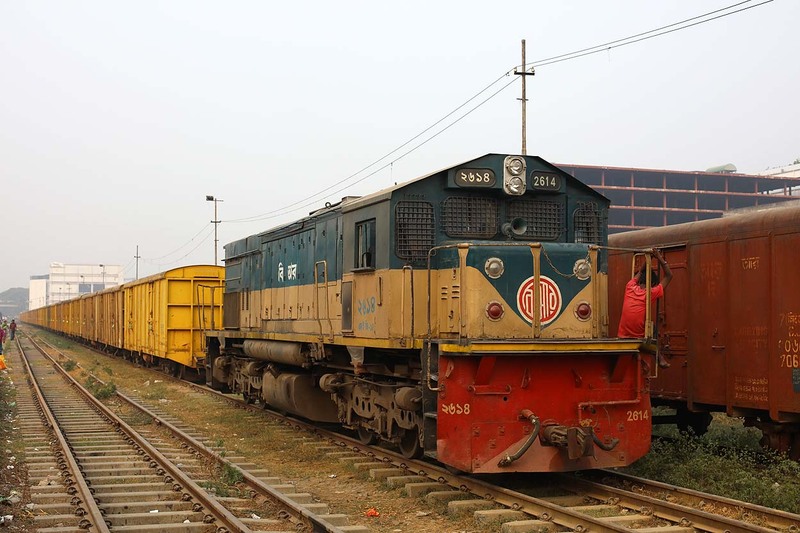 Bangladesh Railways 2025 awaits its departure at Dhaka container terminal (just east of Dhaka main station) with a container train to Chittagong on 19 January 2019. 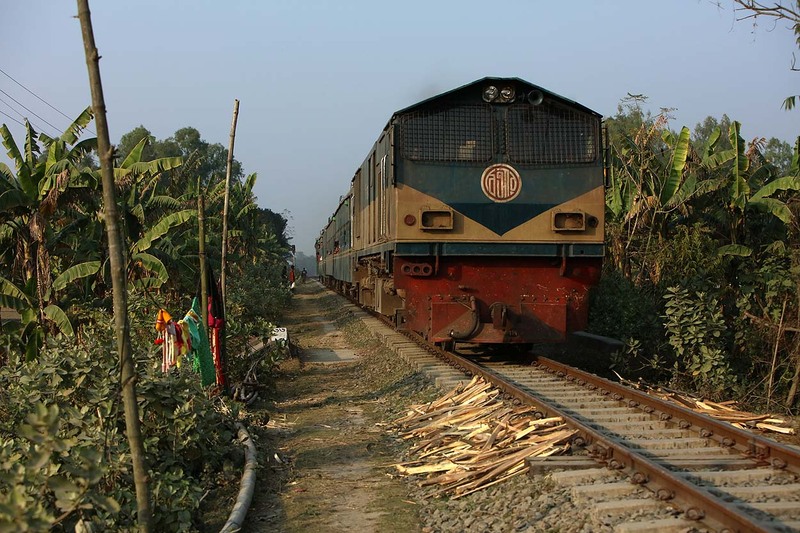 Bangladesh Railways 2320 shunts at the right. 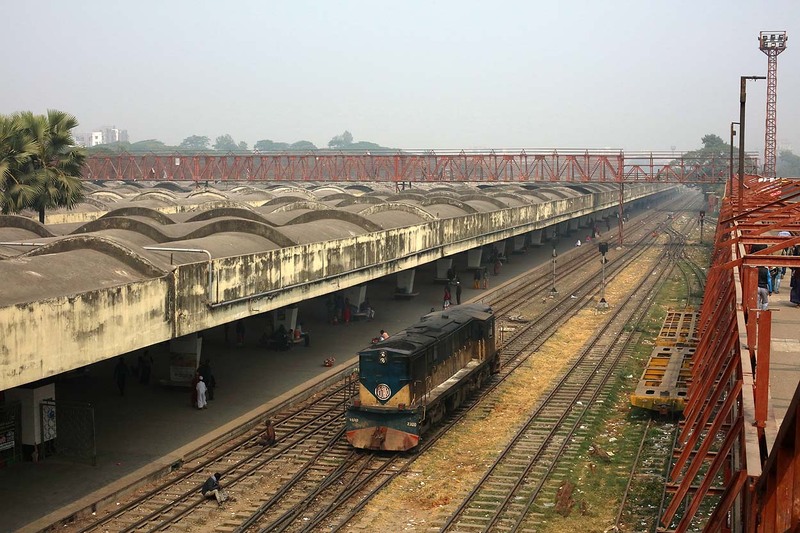 The wonderful canopy of Dhaka main station on 19 January 2019. 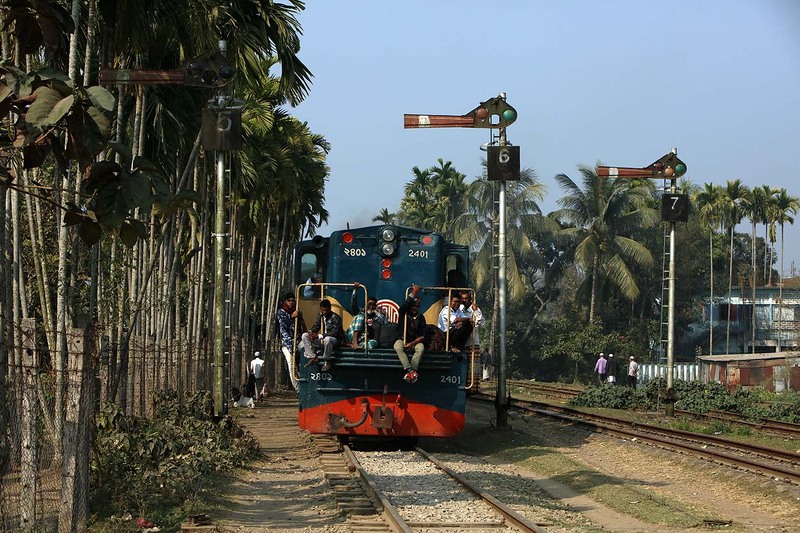 Bangladesh Railways 2320 shunts at the right. 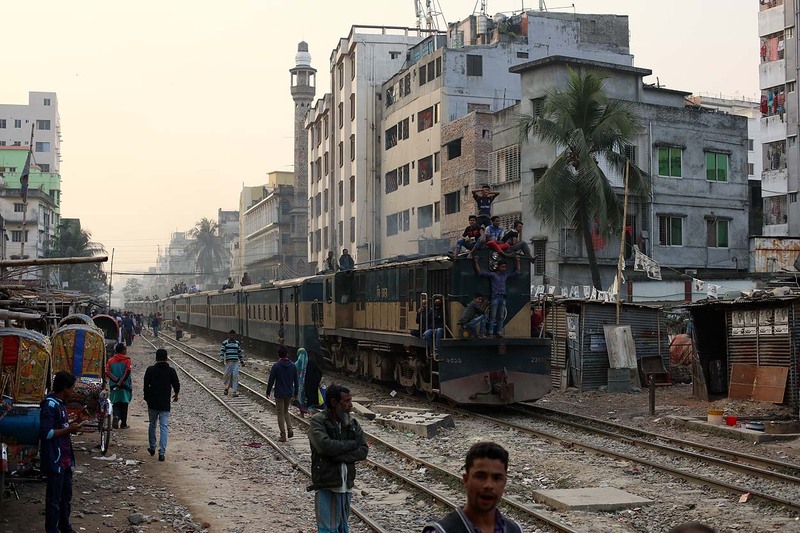 Bangladesh Railways 2514 runs through Dhaka Moghbazar with 'Isakhan Express' 39 from Dhaka to Mymensingh on 19 January 2019. 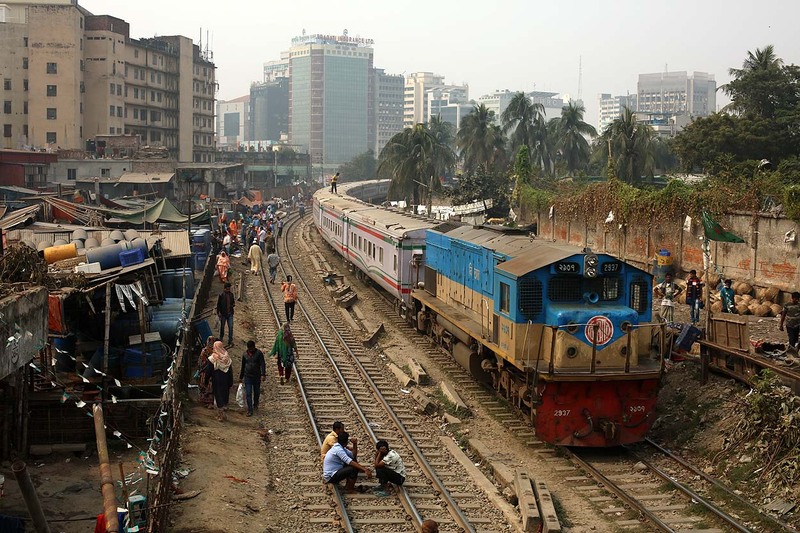 Bangladesh Railways 2925 runs through Dhaka Moghbazar with Intercity train 'Ekota Express' 705 from Dhaka to Dinajpur on 19 January 2019. 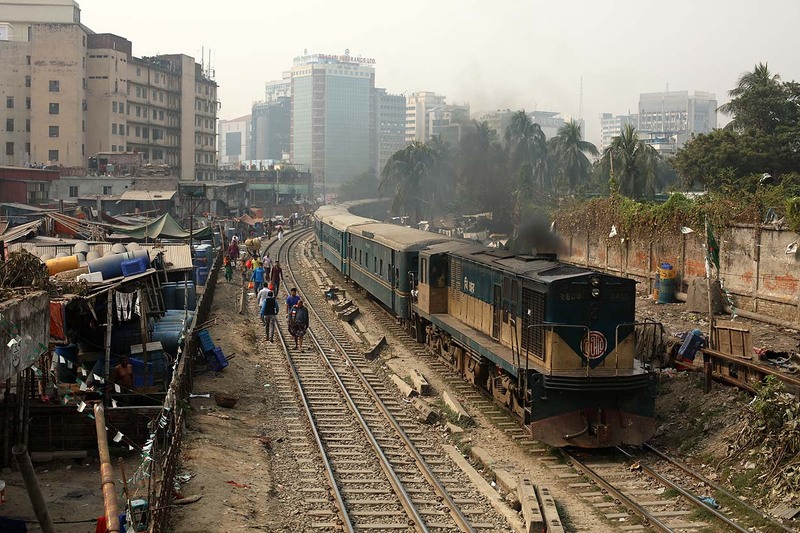 Bangladesh Railways 2312 runs through Dhaka Moghbazar with 'Jamalpur Commuter' 52 from Dewanganj Bazar to Dhaka on 19 January 2019. 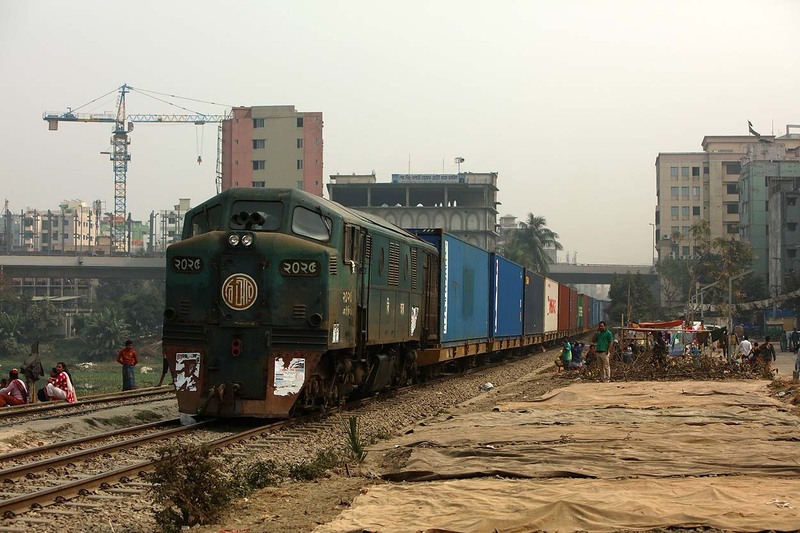 Bangladesh Railways 2025 runs through Dhaka Moghbazar with a container train from Dhaka to Chittagong on 19 January 2019. 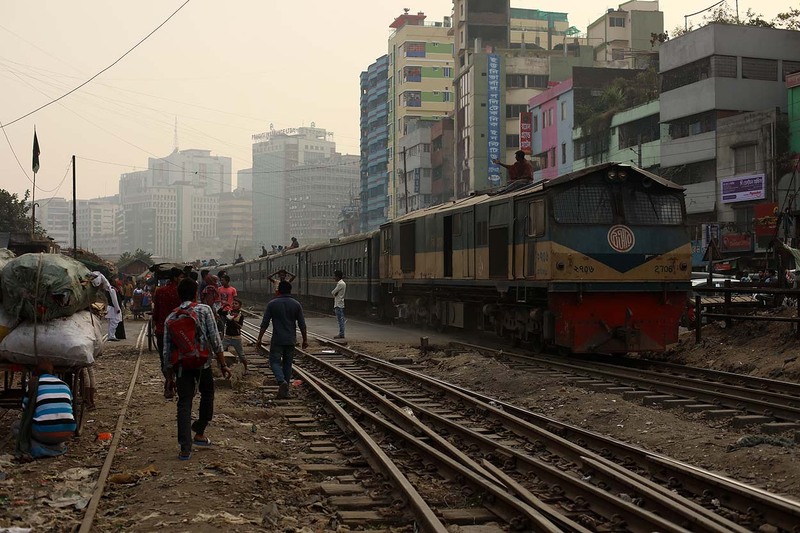 Bangladesh Railways 2704 runs through Dhaka Moghbazar with 'Vawal Express' 56 from Dewanganj Bazar to Dhaka on 19 January 2019. 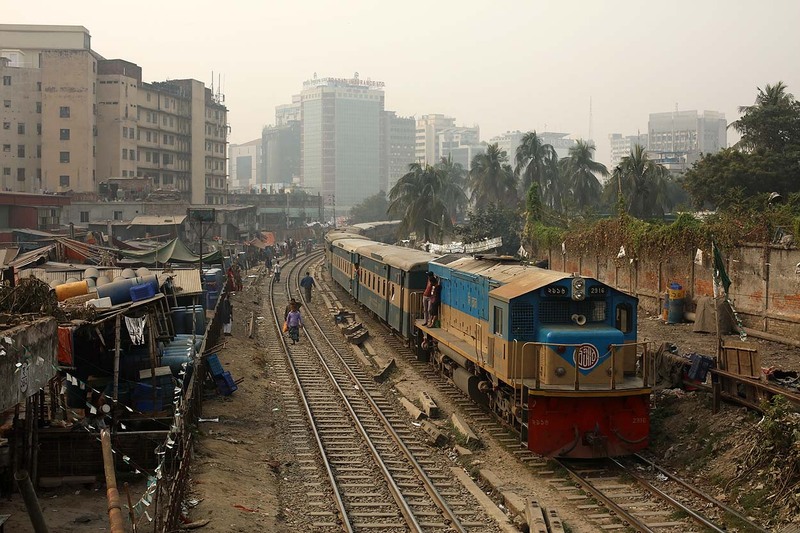 Bangladesh Railways 2937 runs through Dhaka Karwan Bazar with Intercity train 'Subarna Express' 701 from Chittagong to Dhaka on 19 January 2019. 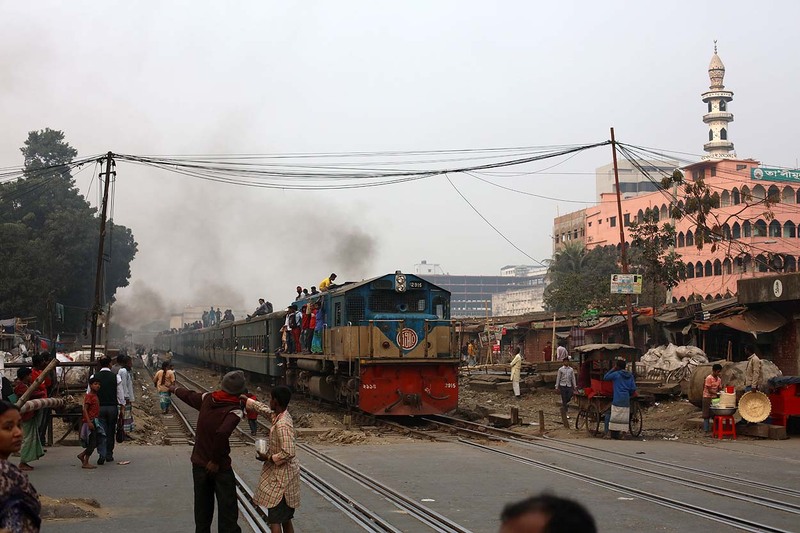 Bangladesh Railways 6516 runs through Dhaka Karwan Bazar with 'Rajshahi Express' 5 from Dhaka to Chapai Nawabganj on 19 January 2019. 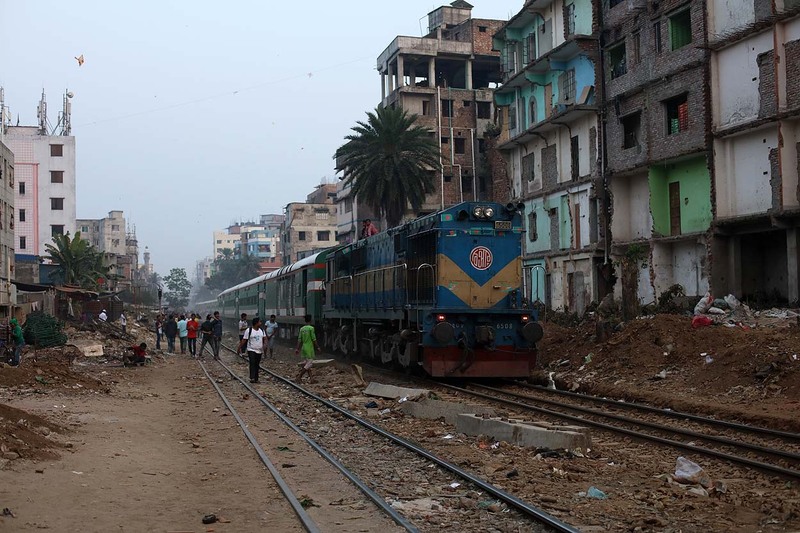 Bangladesh Railways 2904 runs through Dhaka Karwan Bazar with Intercity train 'Upukol Express' 711 from Noakhali to Dhaka on 19 January 2019. 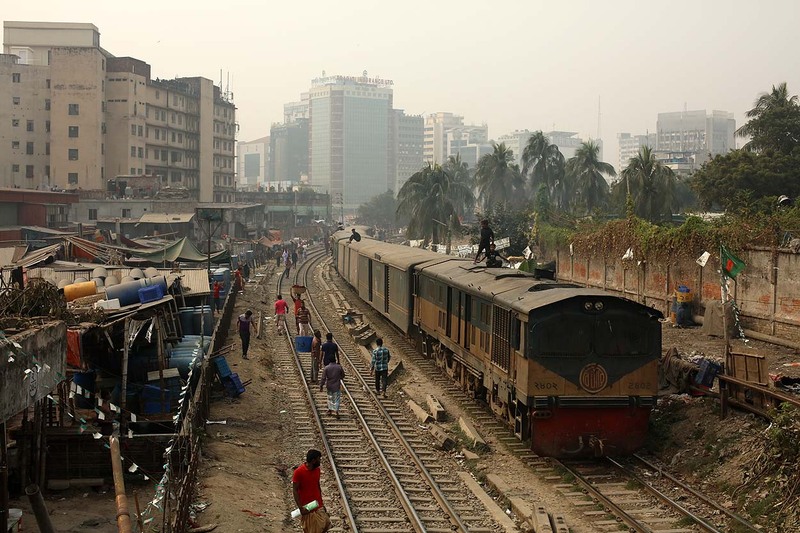 Bangladesh Railways 2905 runs through Dhaka Karwan Bazar with Intercity train 'Bharamaputra' 744 from Dewanganj Bazar to Dhaka on 19 January 2019. 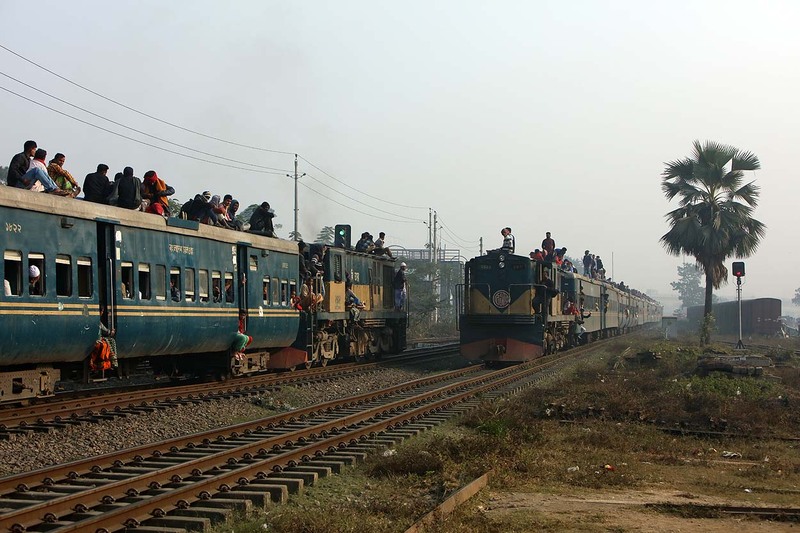 Everything alright on the roof of Intercity train 'Bharamaputra' 744 from Dewanganj Bazar to Dhaka at Dhaka Karwan Bazar on 19 January 2019. 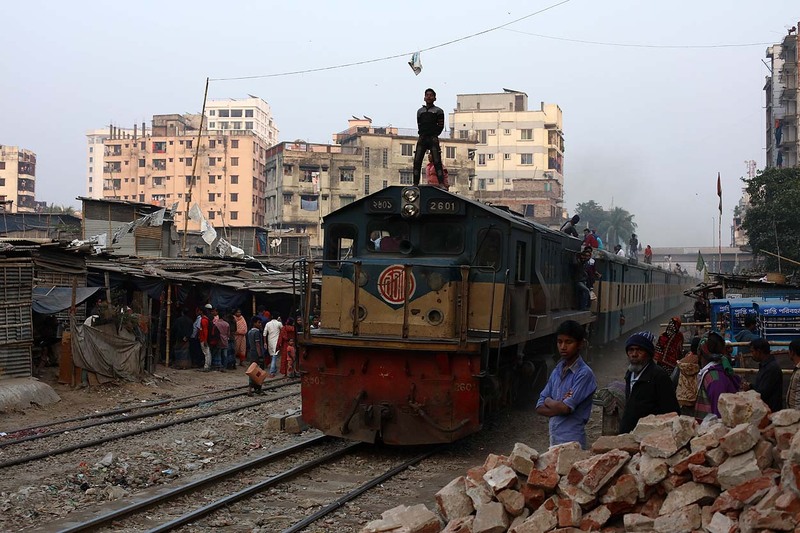 Bangladesh Railways 2403 runs through Dhaka Karwan Bazar with 'Joydebpur Commuter 2' from Joydebpur to Dhaka on 19 January 2019. 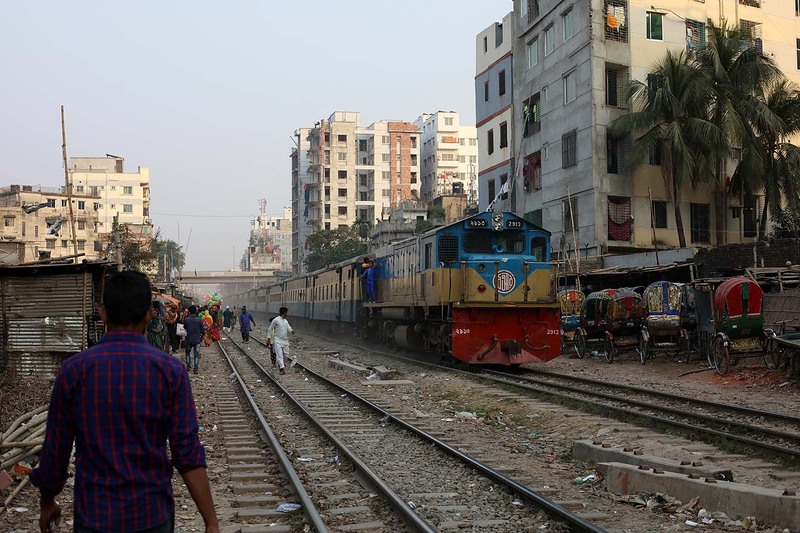 Bangladesh Railways 2802 runs through Dhaka Karwan Bazar with Intercity train 'Kalani Express' 774 from Sylhet to Dhaka on 19 January 2019. 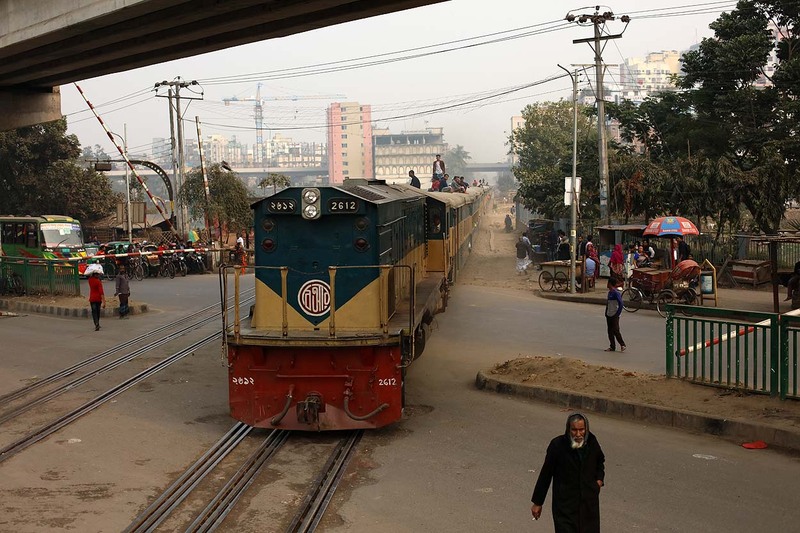 Bangladesh Railways DMU 10010 runs southbound through Dhaka Karwan Bazar on 19 January 2019. 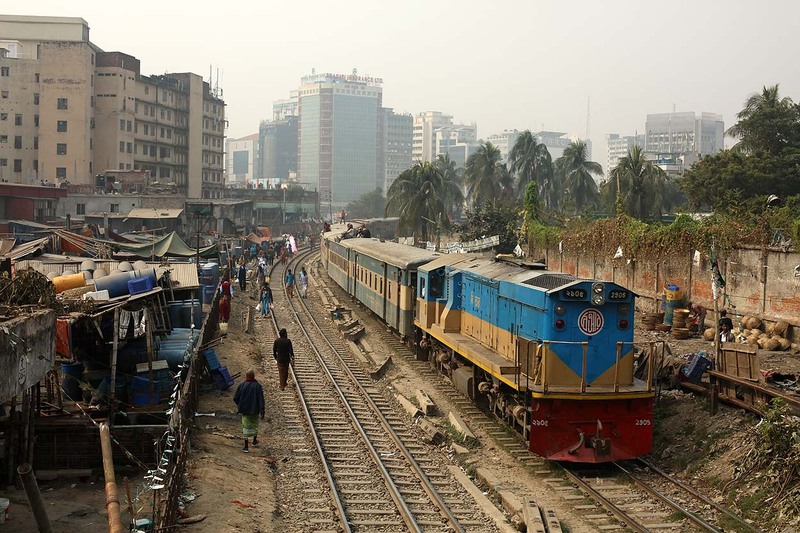 Bangladesh Railways 2916 runs through Dhaka Karwan Bazar with Intercity train 'Haor Express' 778 from Mohangonj to Dhaka on 19 January 2019. 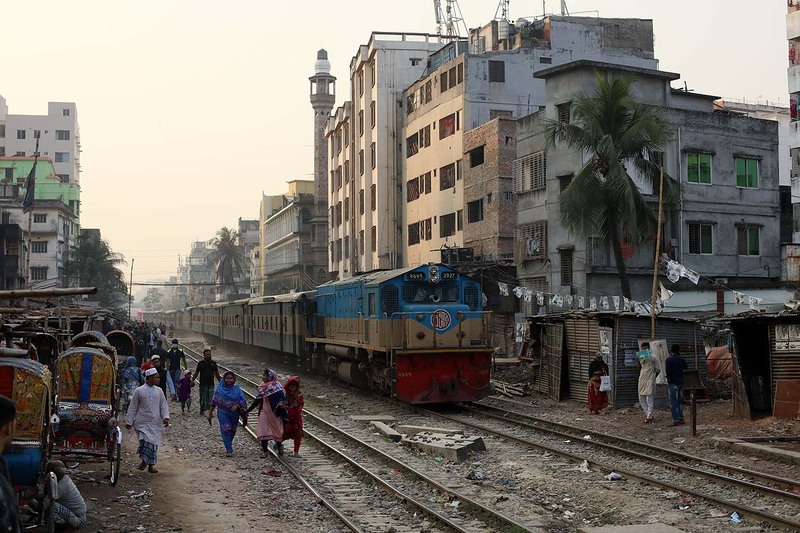 Bangladesh Railways 6524 runs through Dhaka Karwan Bazar with Intercity train 'Silk City Express' 754 from Rajshahi to Dhaka on 19 January 2019. 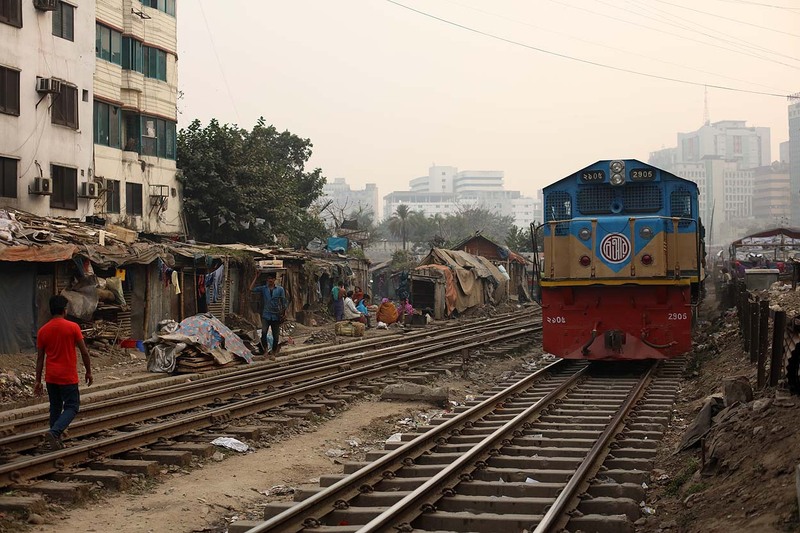 Bangladesh Railways 2603 runs through Dhaka Karwan Bazar with 'Titas Commuter' 35 from Brahmanbaria to Dhaka on 19 January 2019.
good idea at this spot. 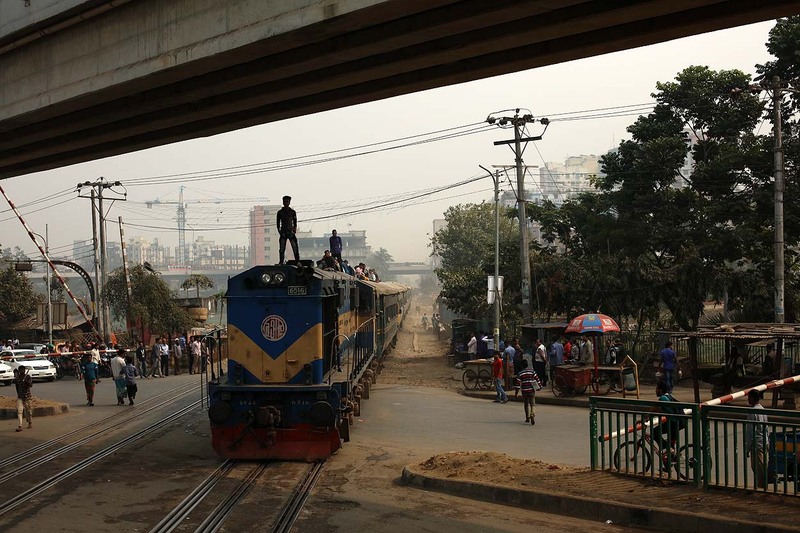 Bangladesh Railways 2937 runs through Dhaka Karwan Bazar with Intercity train 'Subarna Express' 702 from Dhaka to Chittagong on 19 January 2019. 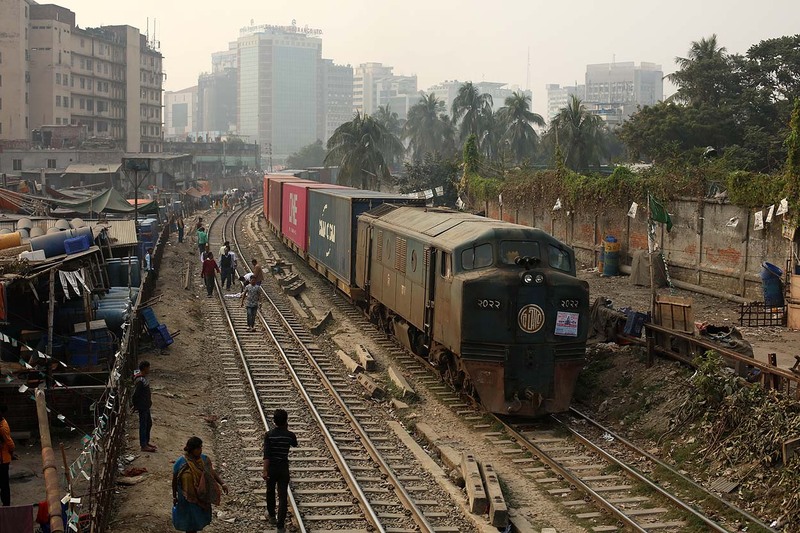 Bangladesh Railways 2022 runs through Dhaka Karwan Bazar with a container train from Chittagong to Dhaka on 19 January 2019. 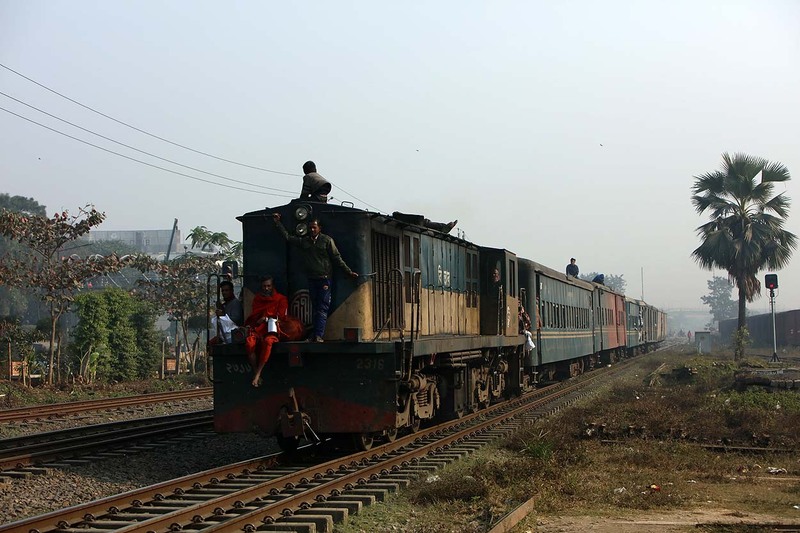 Bangladesh Railways 2706 approaches Dhaka Tejgaon with 'Jamalpur Commuter' 51 from Dhaka to Dewanganj on 19 January 2019. 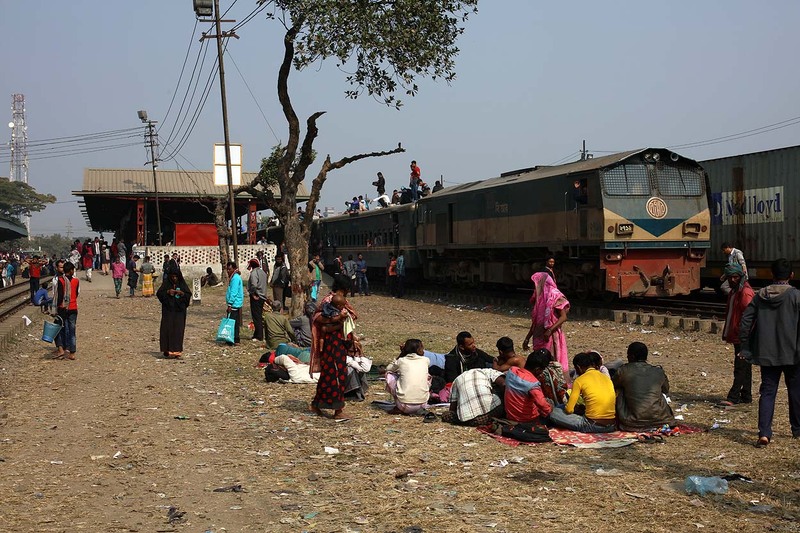 Bangladesh Railways 2614 just detached from a string of box cars at Dhaka Tejgaon and waits to depart to Dhaka main station on 19 January 2019. 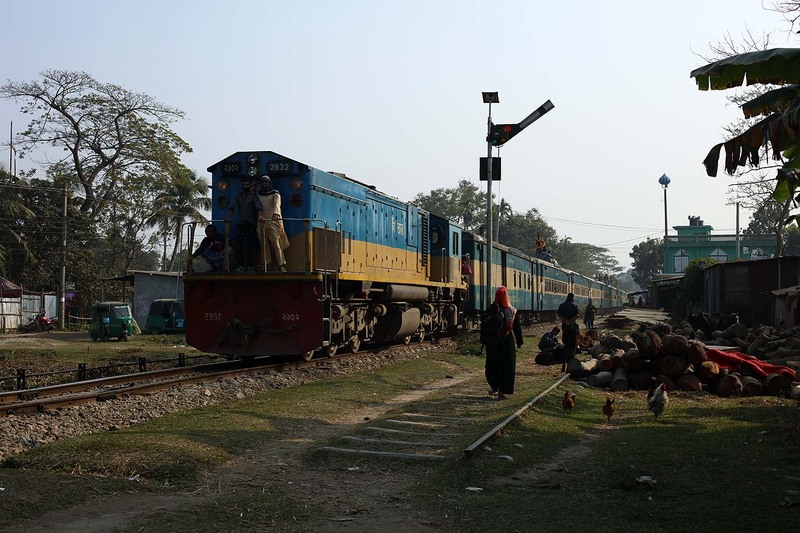 A farther and son are quarreling on the railway crossing while Bangladesh Railways 2915 leaves Dhaka Tejgaon with 'Chattala Express' 67 from Chittagong to Dhaka on 19 January 2019. 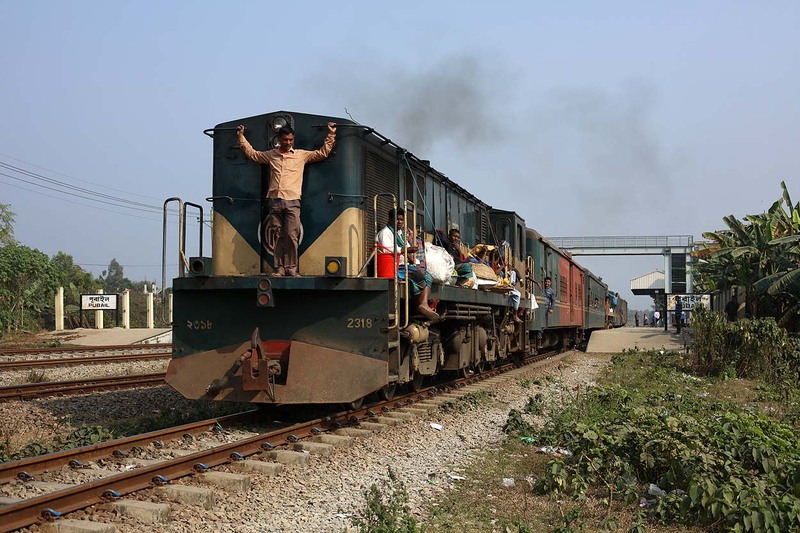 Bangladesh Railways 2905 approaches Dhaka Tejgaon with a northbound passenger train from Dhaka on 19 January 2019. 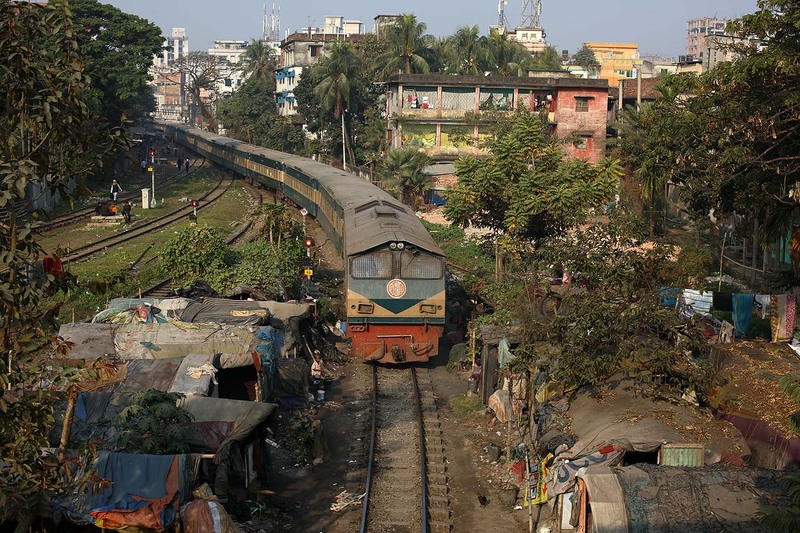 Note the rail connection on the left which dissapears in the slumps. 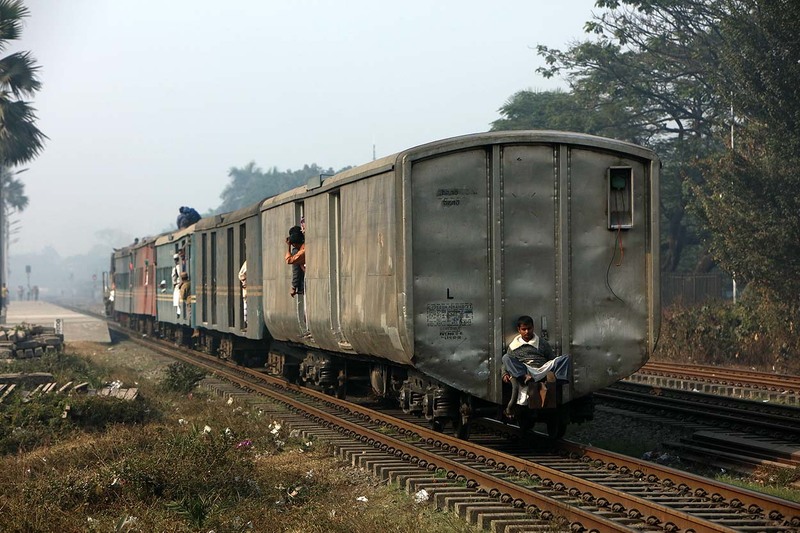 Apparently it is still served once a week by a freight train.